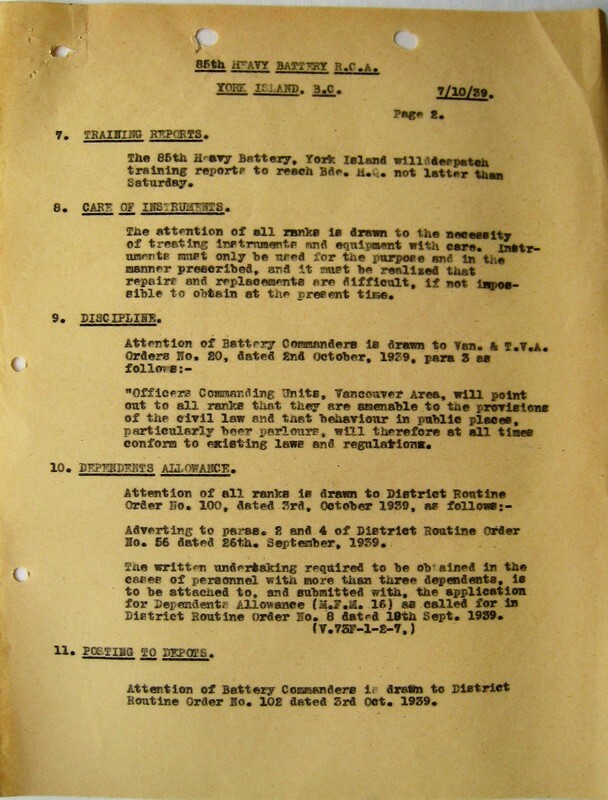 Started to convert power house into barrack hut. 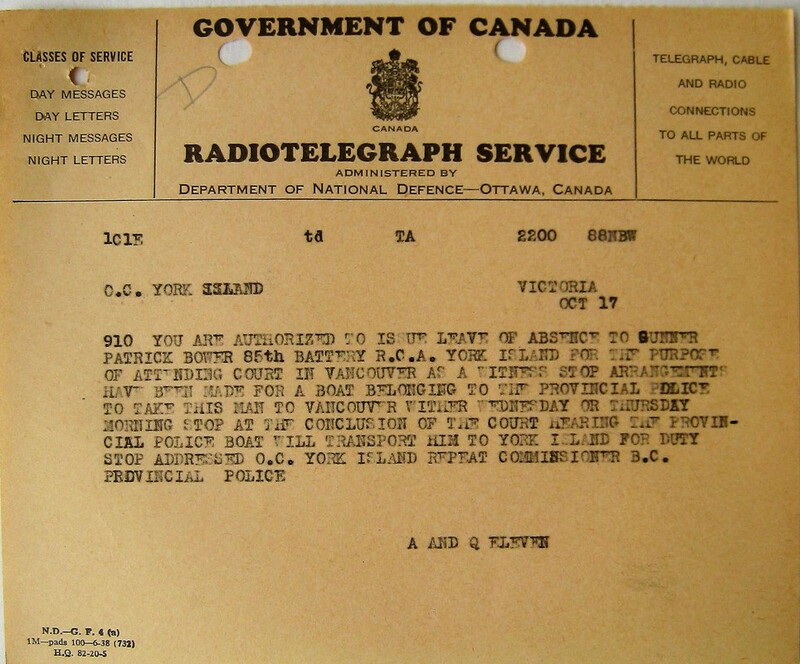 ​Letter re Officer's Establishment (see App. 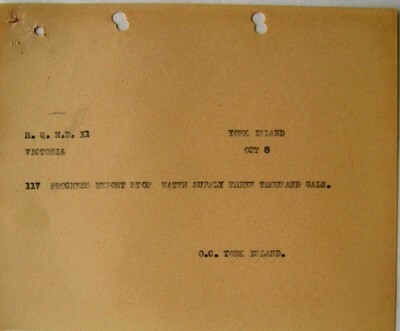 "E"). "Border Prince" delivered lumber and water. 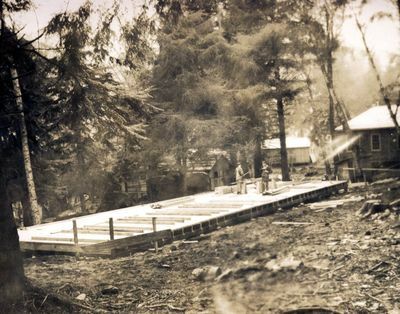 Started construction of mess hut. 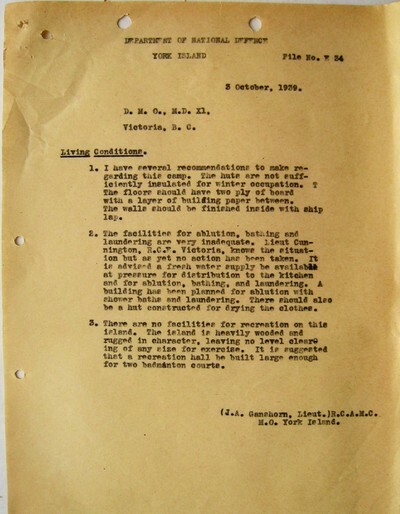 Letter re: living conditions (see App. 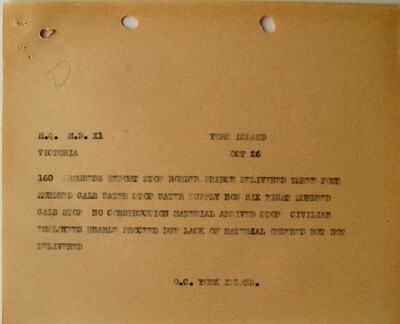 "E"). ​Completed power house floor (see App. 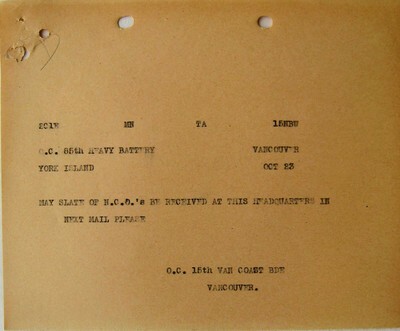 "E"). 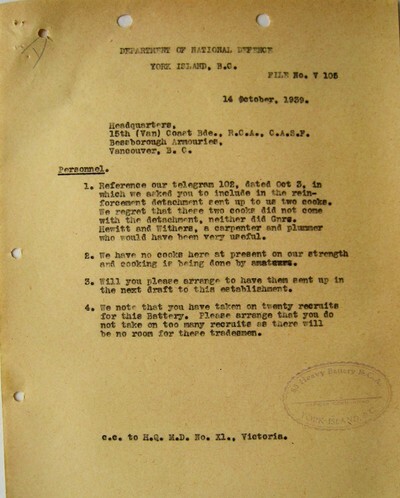 ​Letter re: surveys (see App. 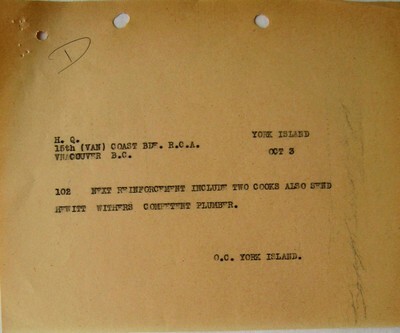 "E"). 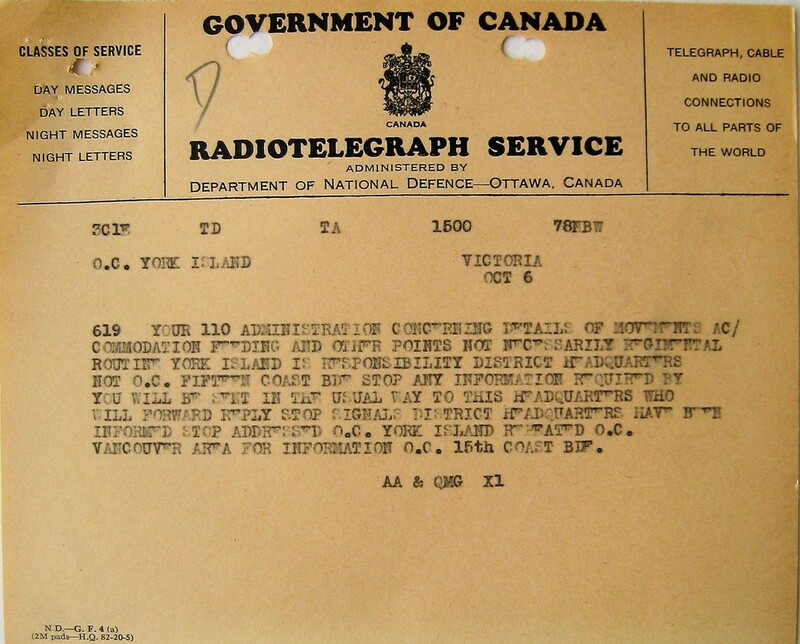 ​Letter re maps (see App. 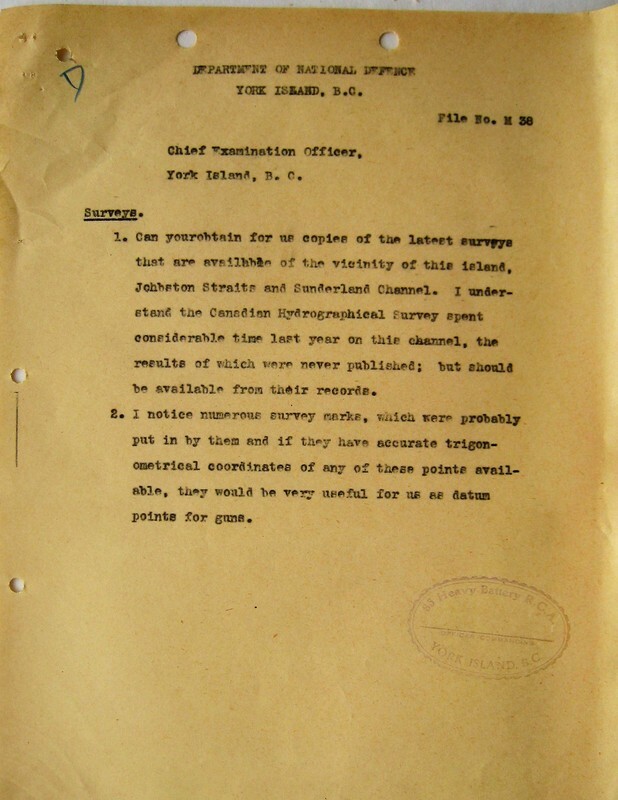 "E"). ​4 ORs sent to Vancouver - category "E". 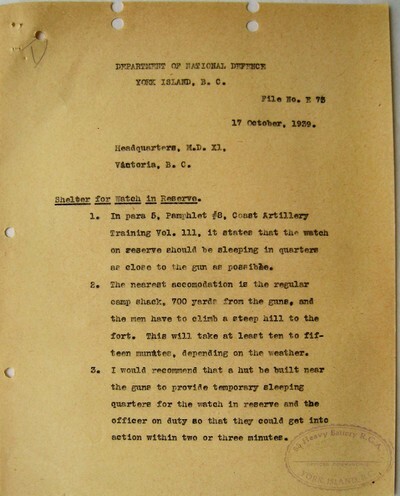 ​Letter re training report (see App. 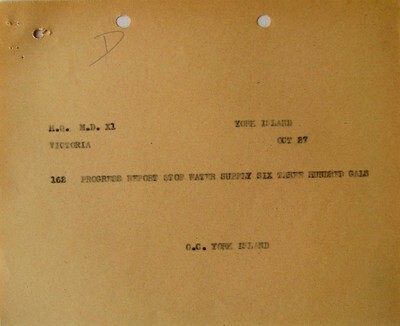 "E"). 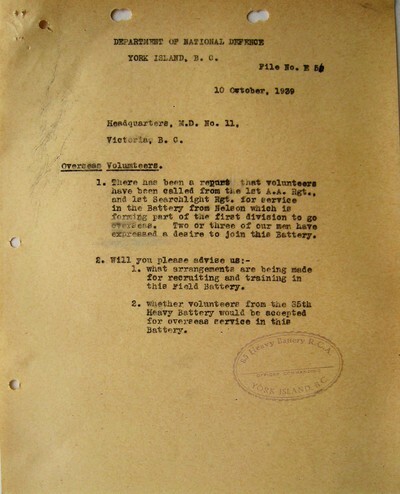 ​Letter re Overseas Volunteers (see App. "E"). 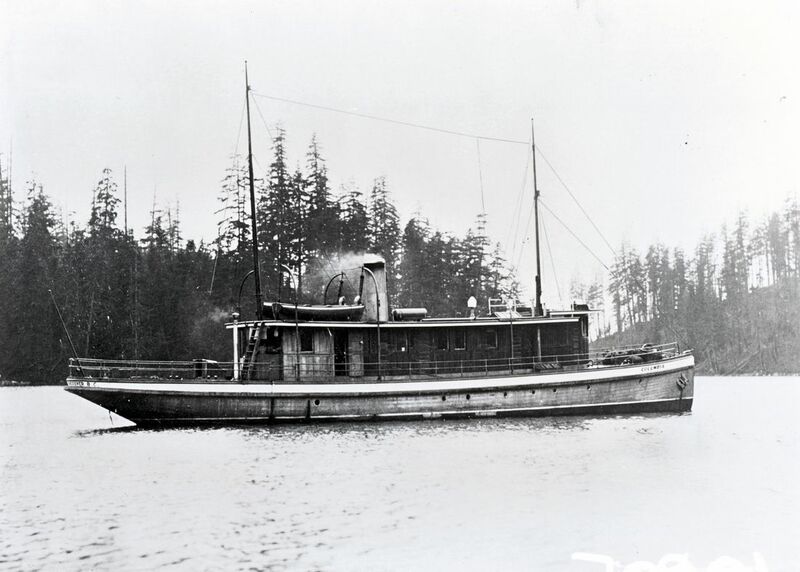 ​"Border Prince" delivered lumber and water. 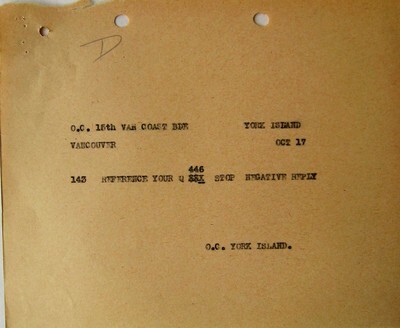 ​16 OR's reported for duty. 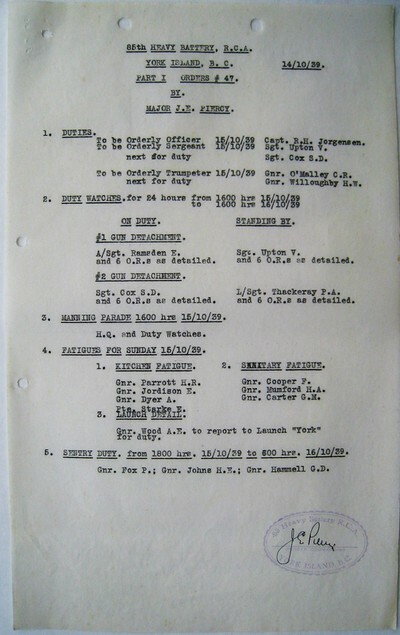 Lt. Col. G.R. 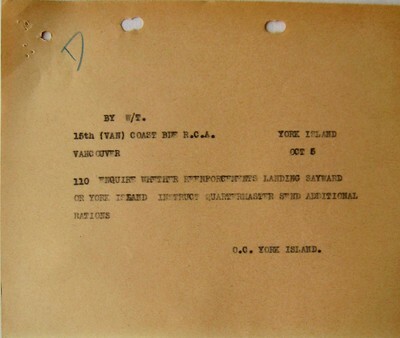 Turner, G.S.O., arrived in R.C.A.F. aircraft accompanied by Air Commodore G.O. 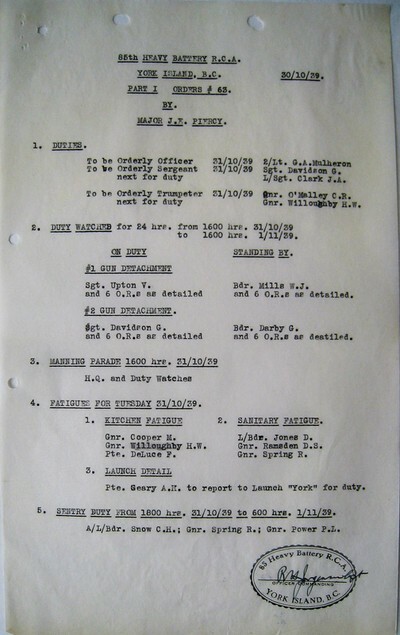 Johnson and Major Chetwynal, RCE. 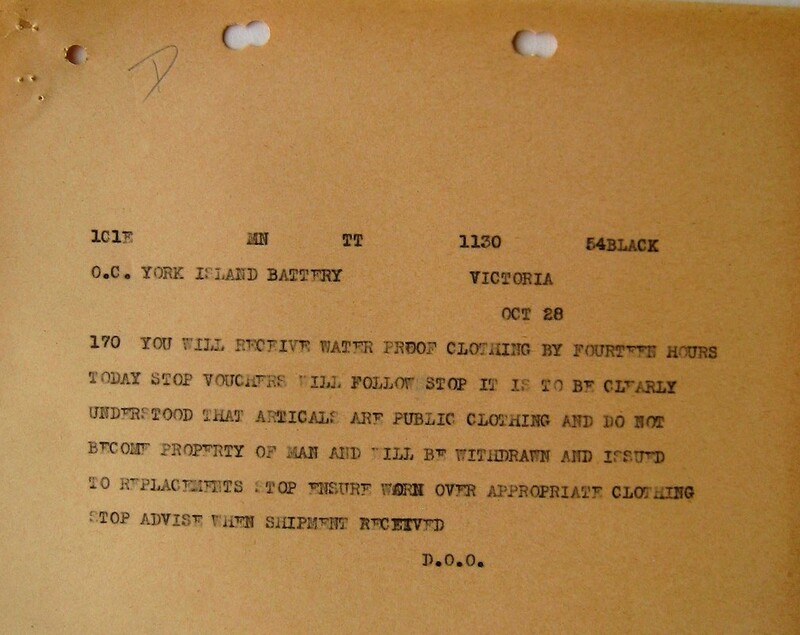 Letter re clothing (see App. 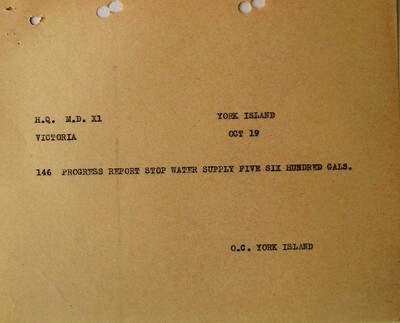 "G"). 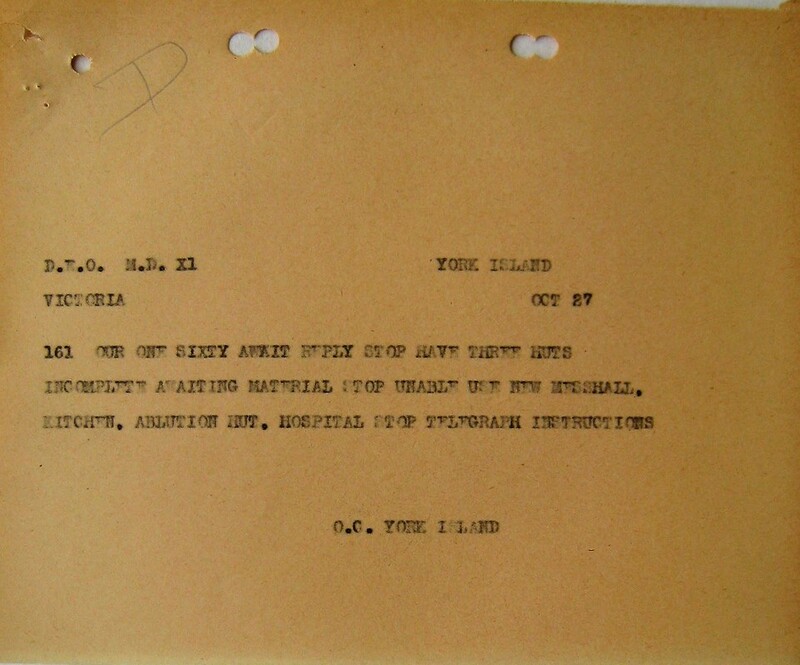 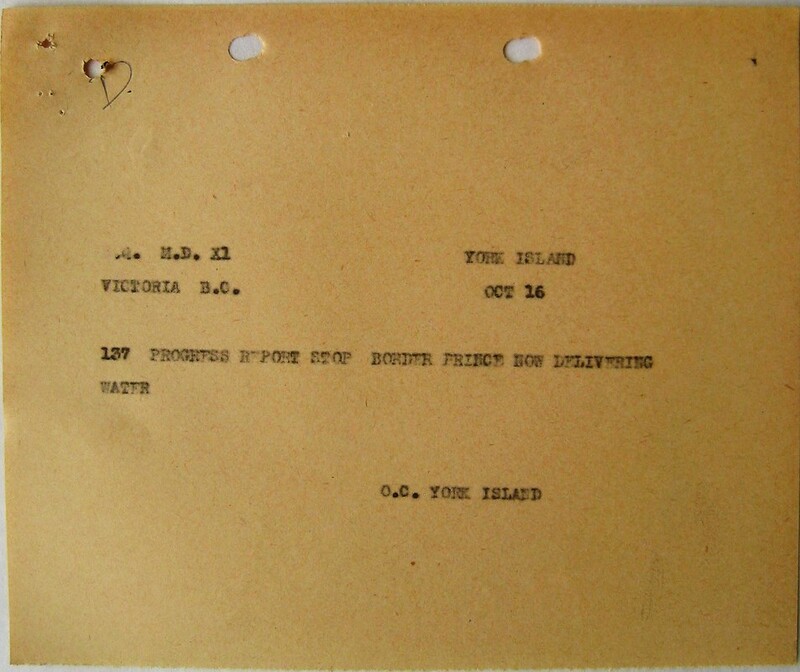 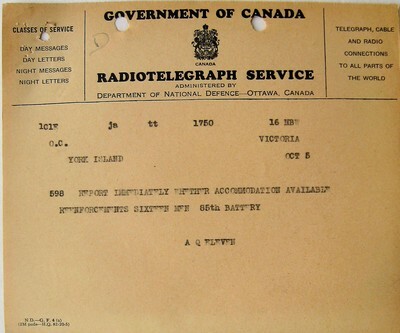 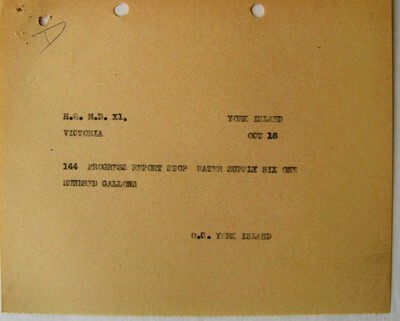 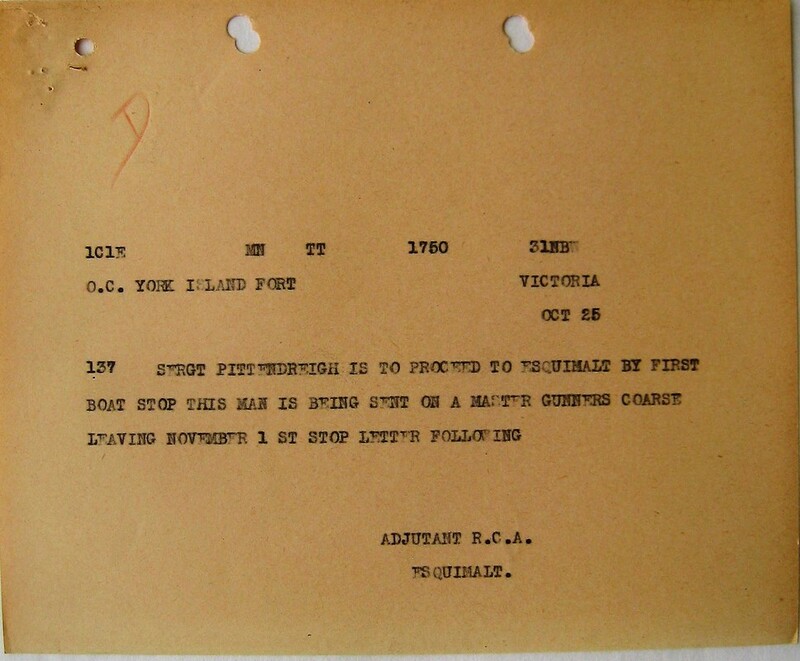 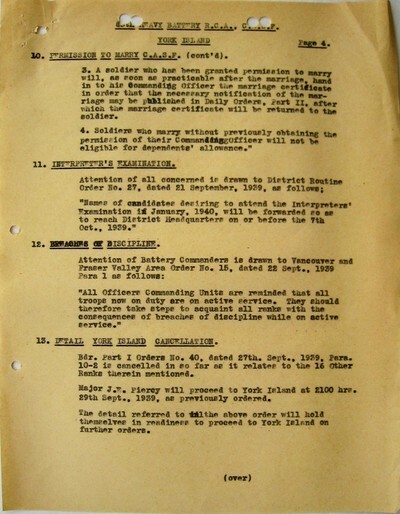 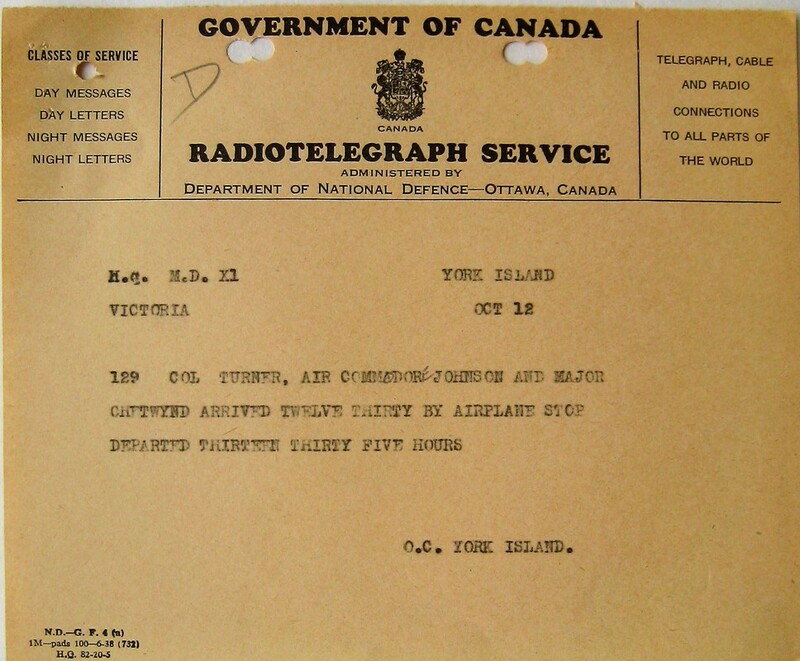 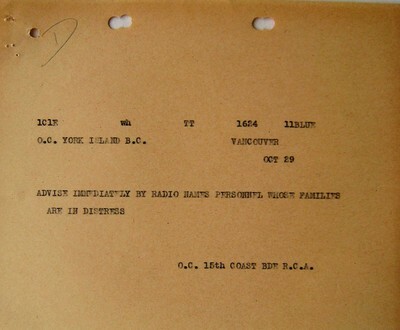 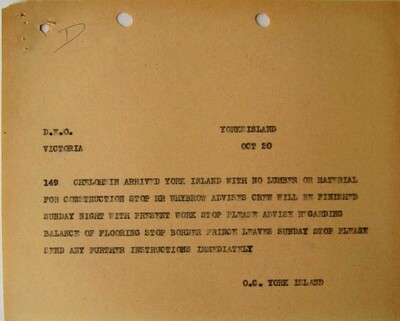 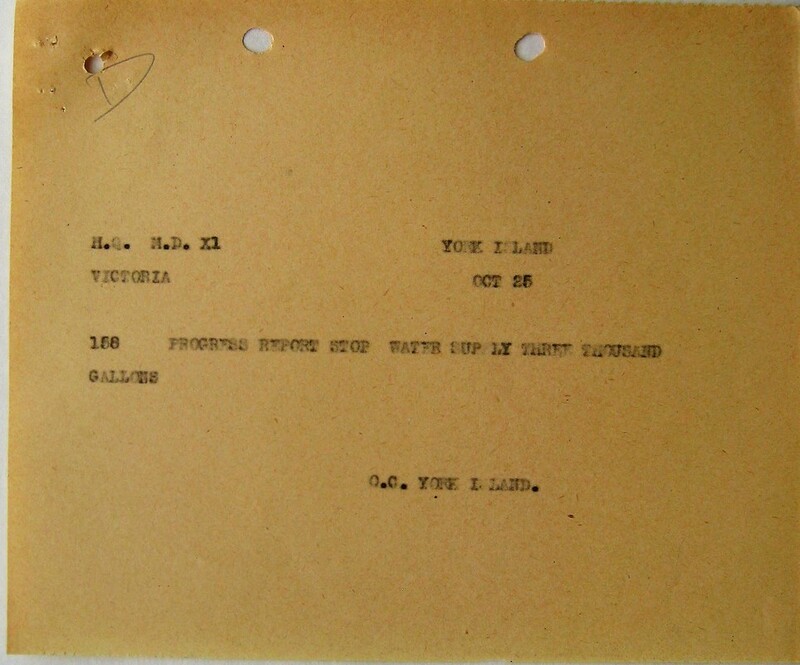 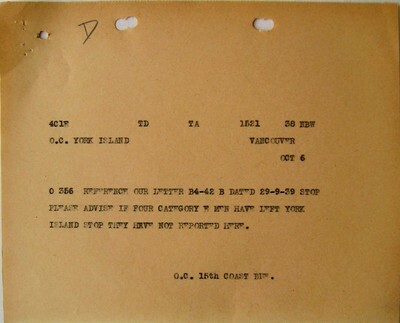 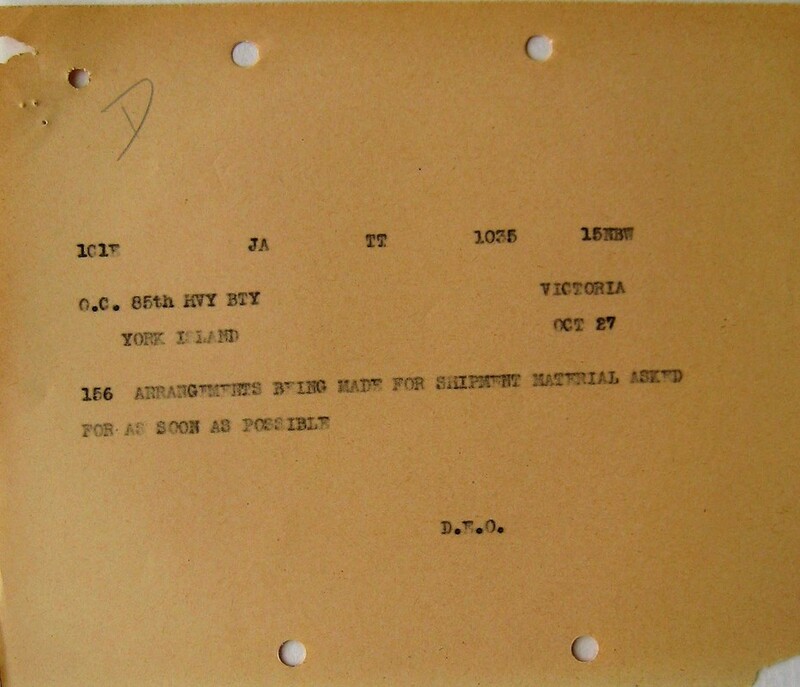 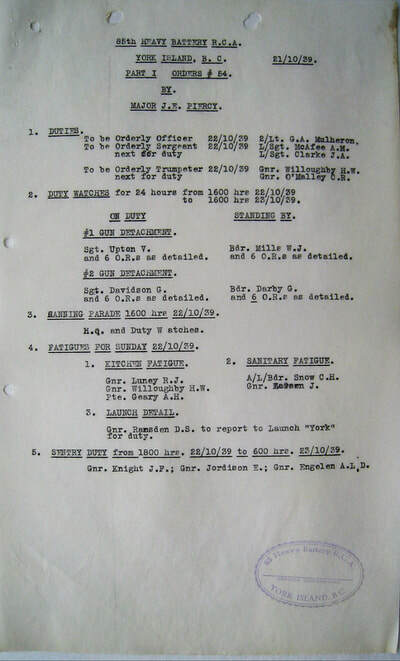 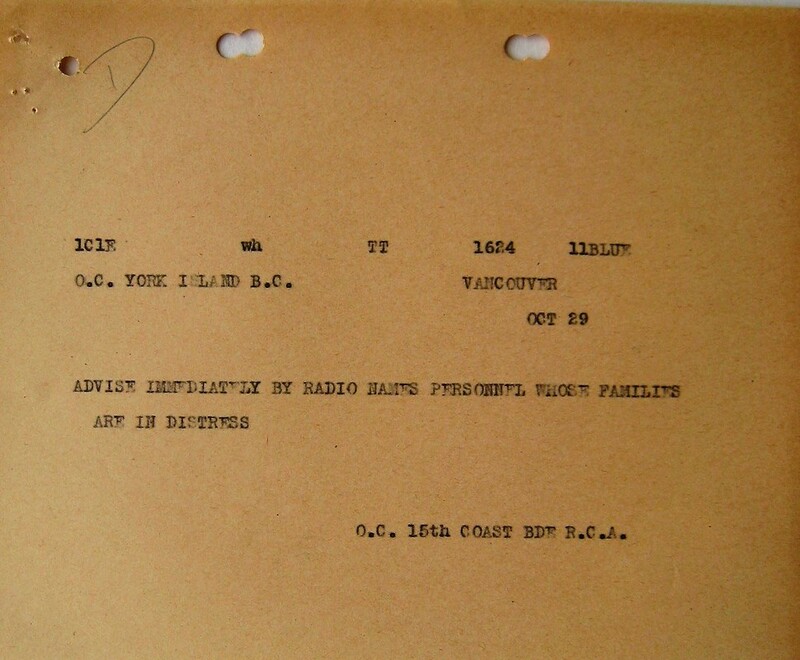 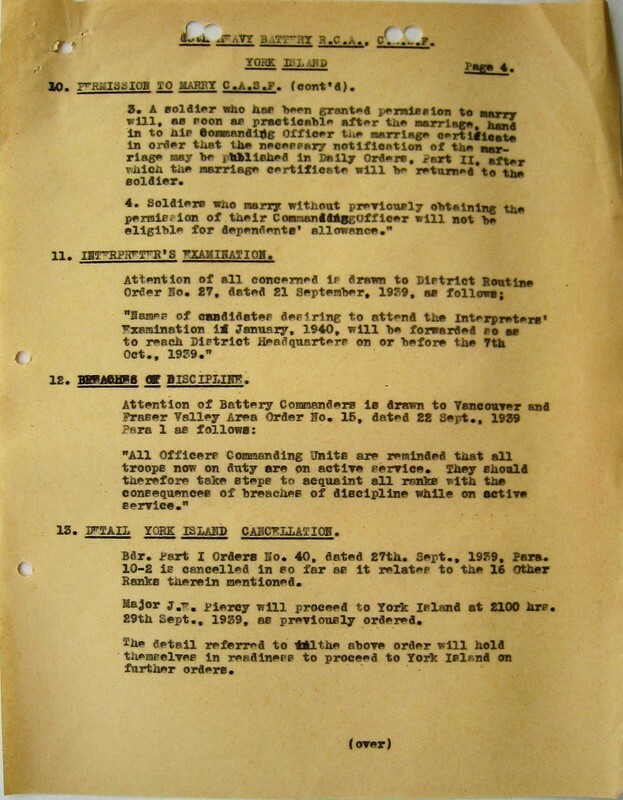 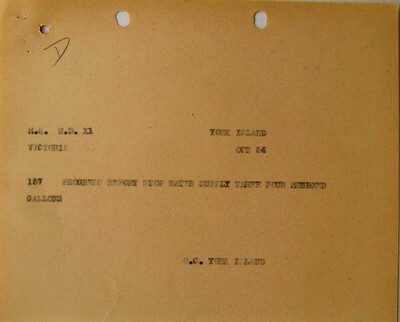 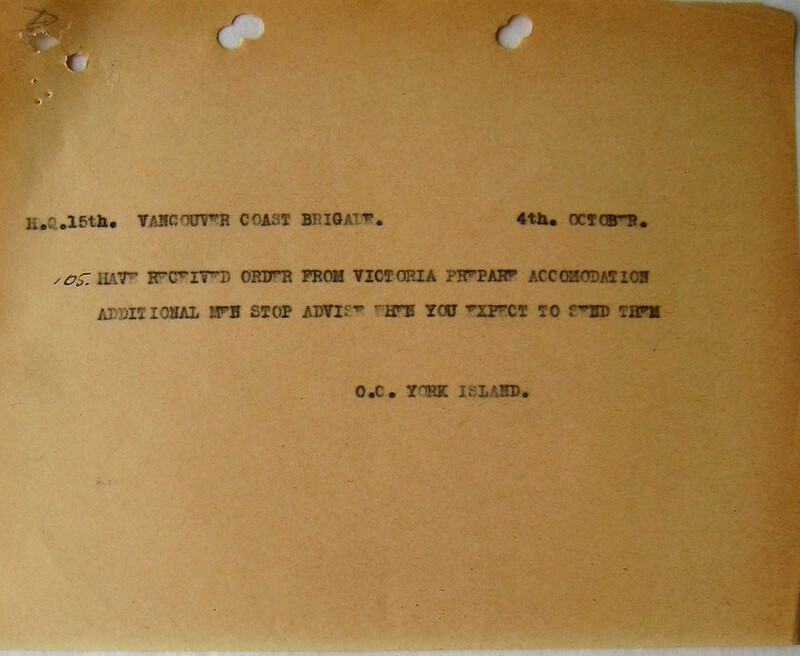 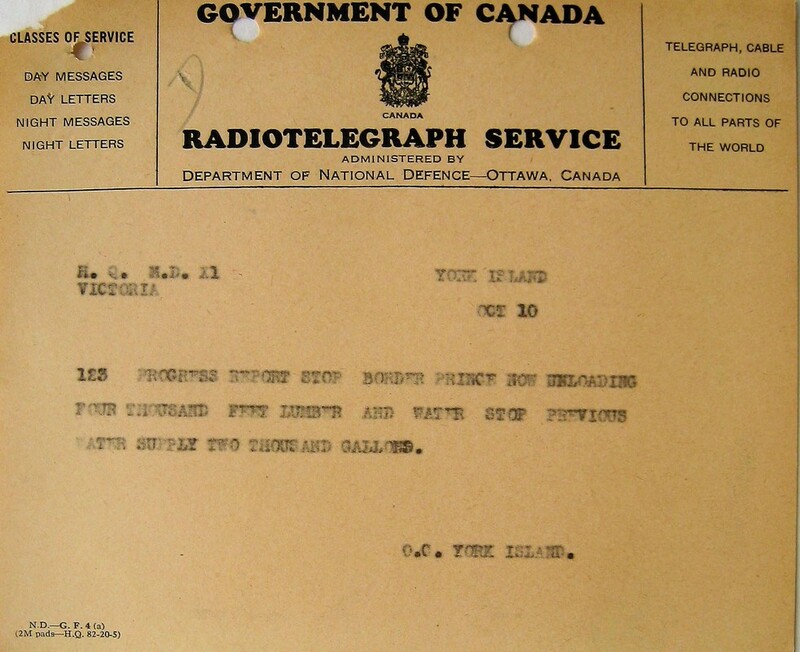 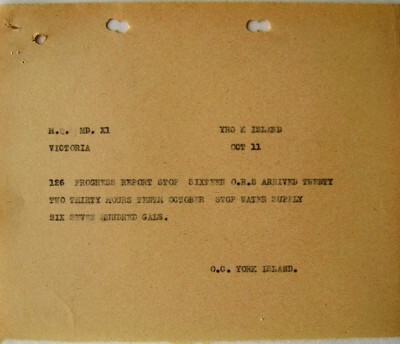 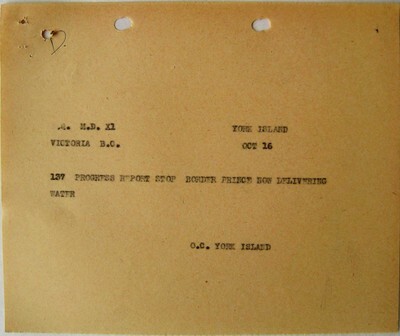 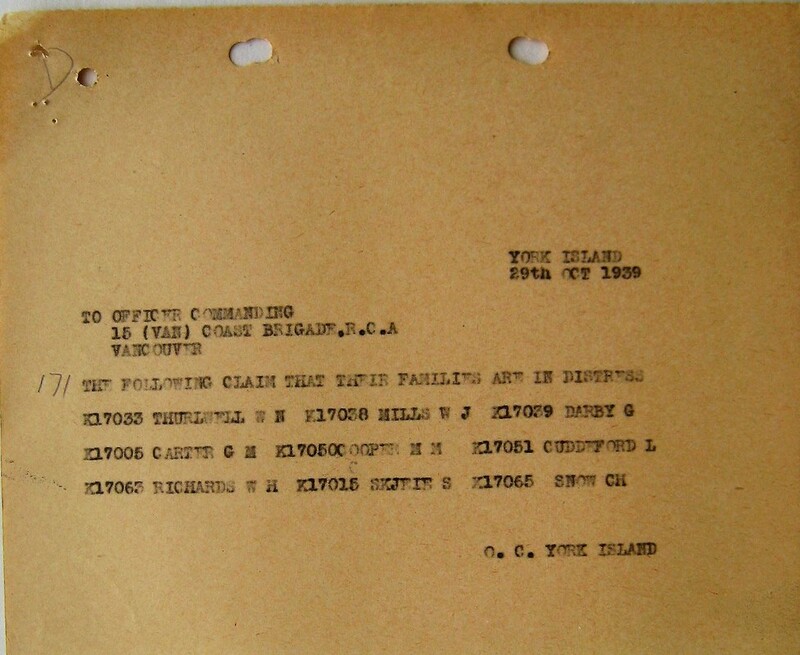 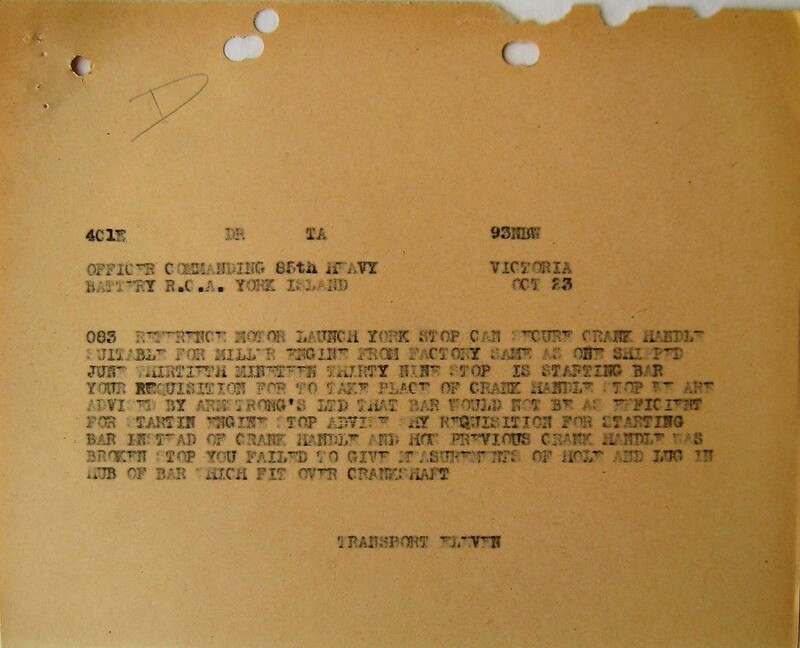 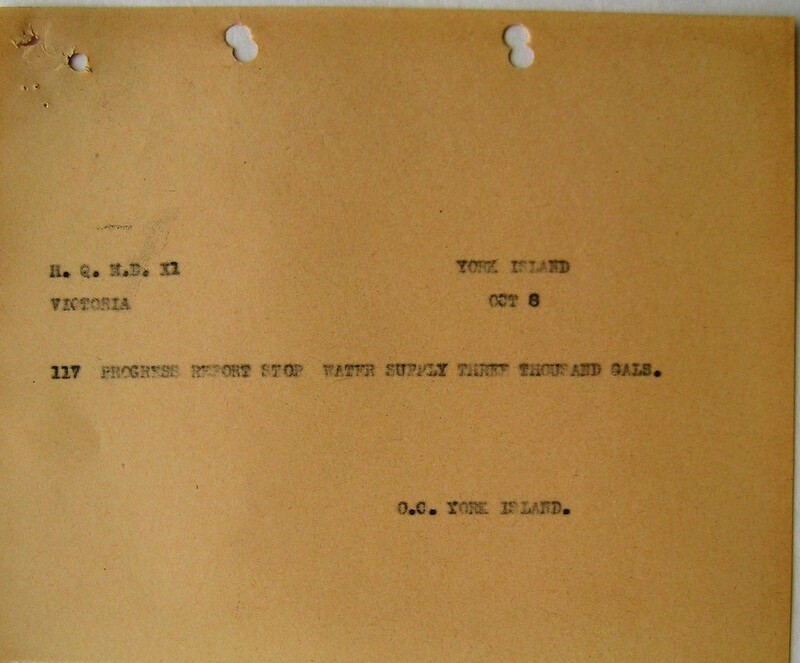 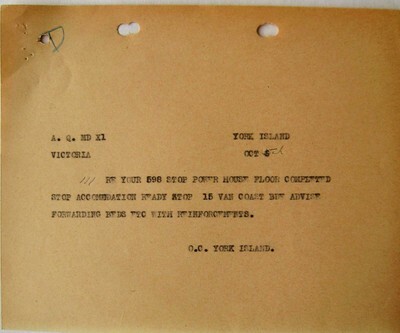 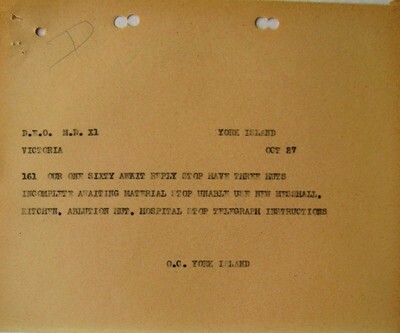 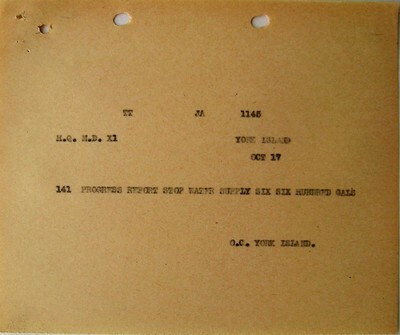 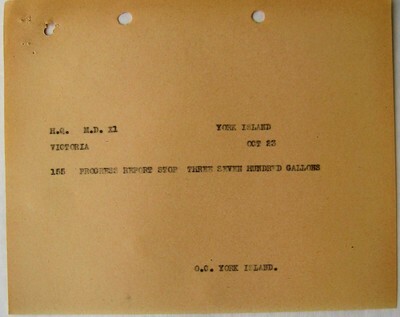 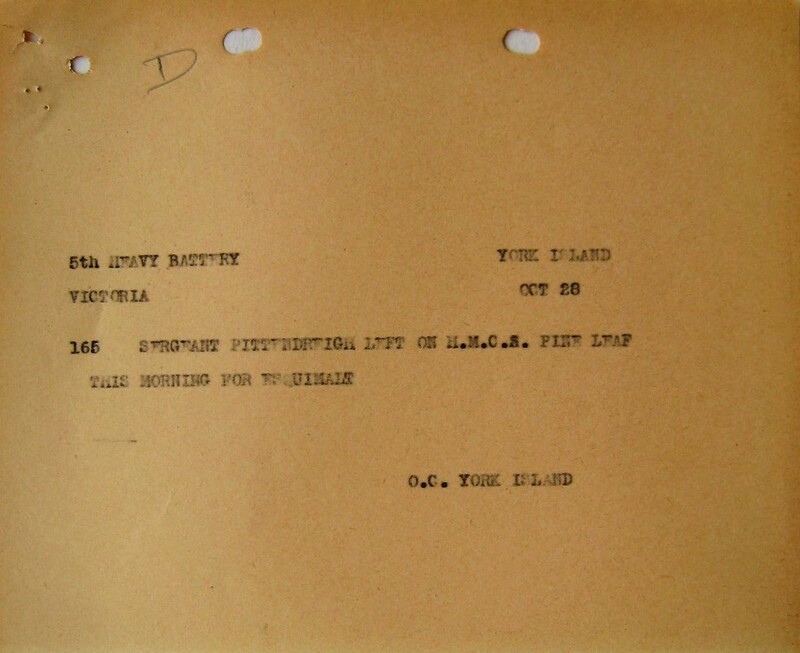 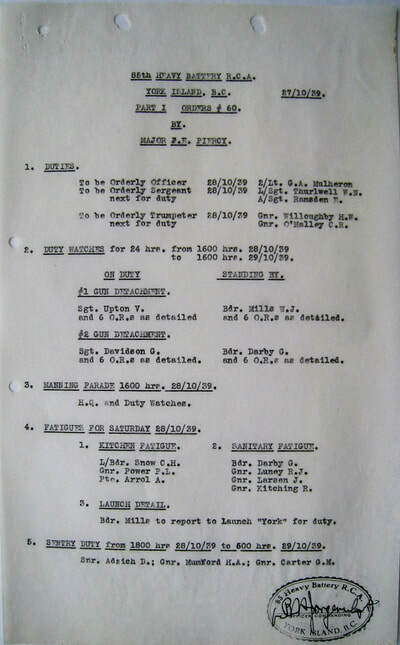 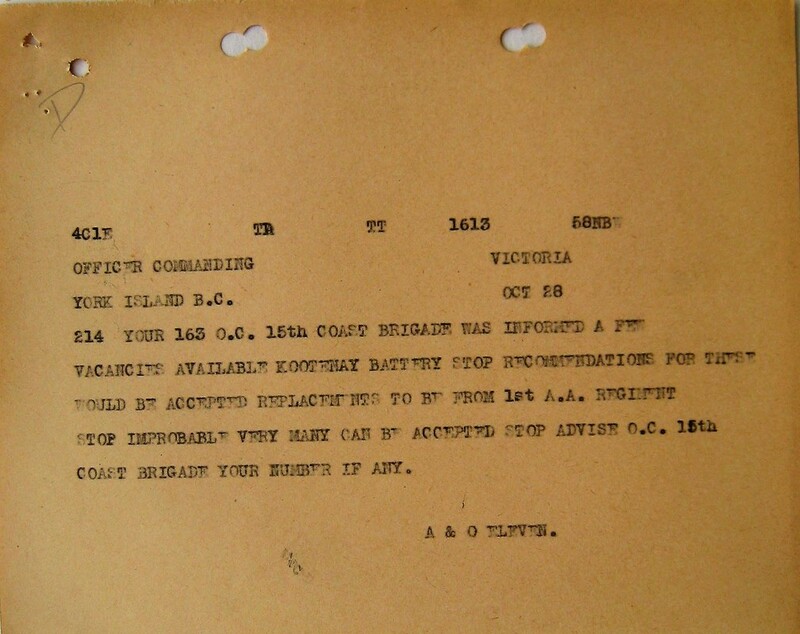 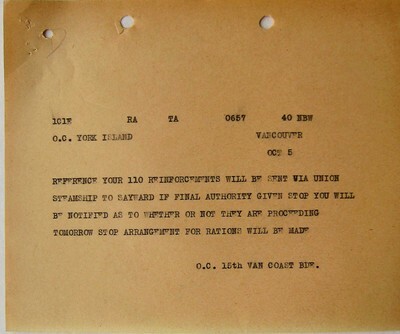 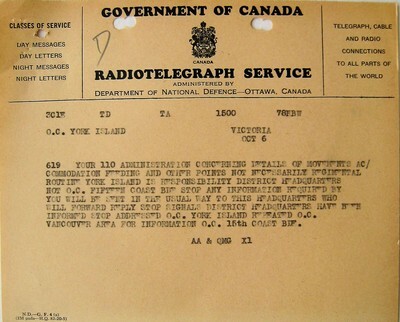 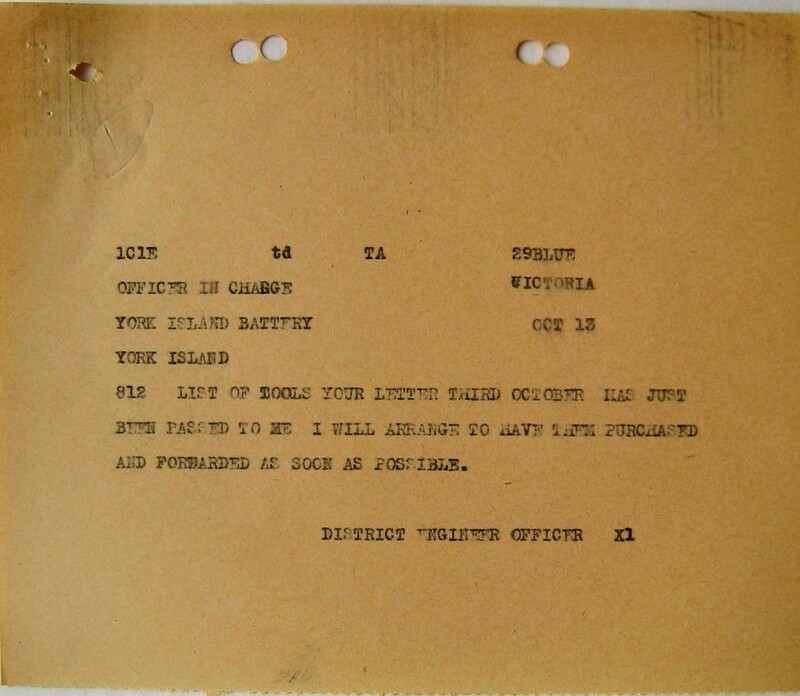 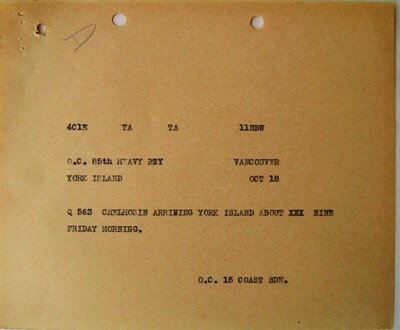 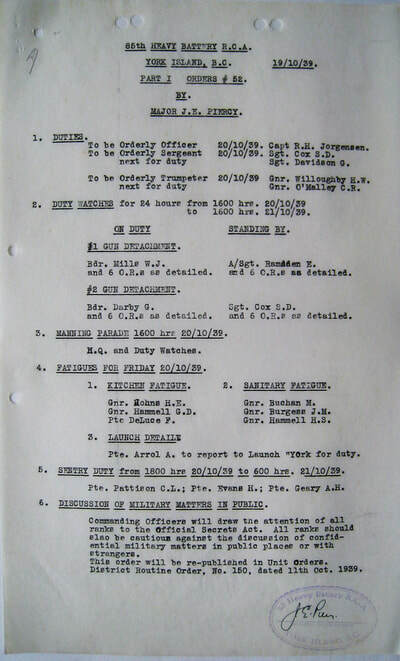 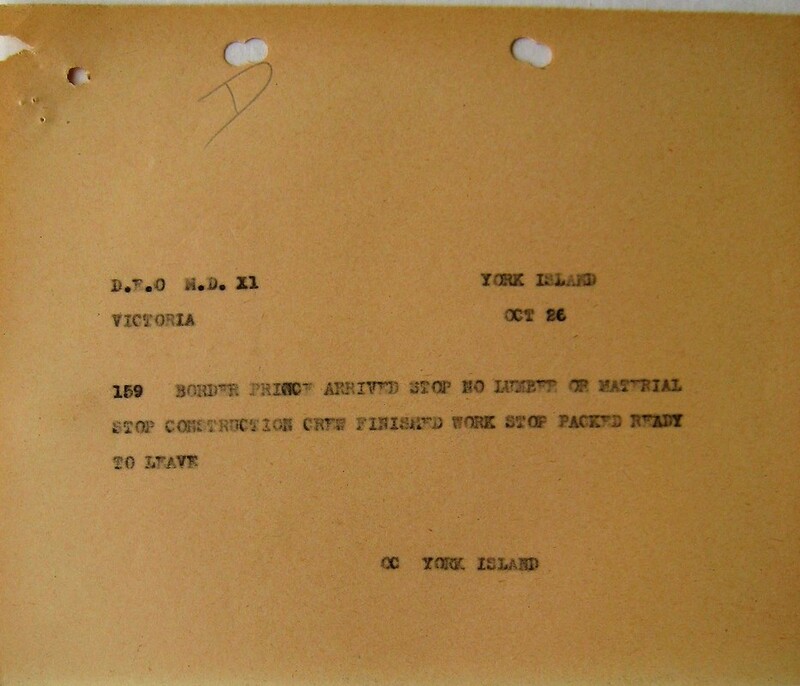 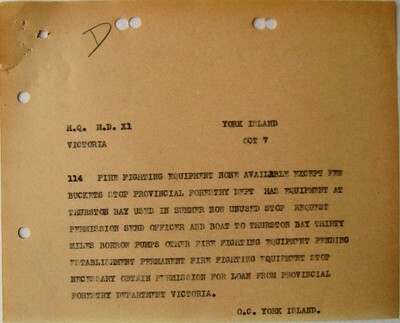 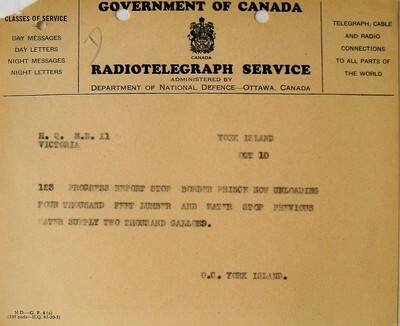 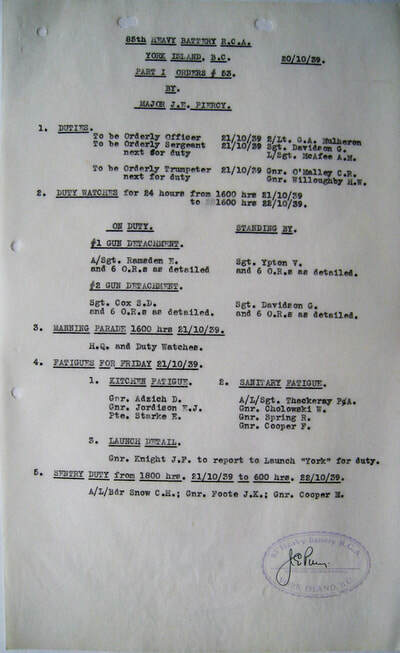 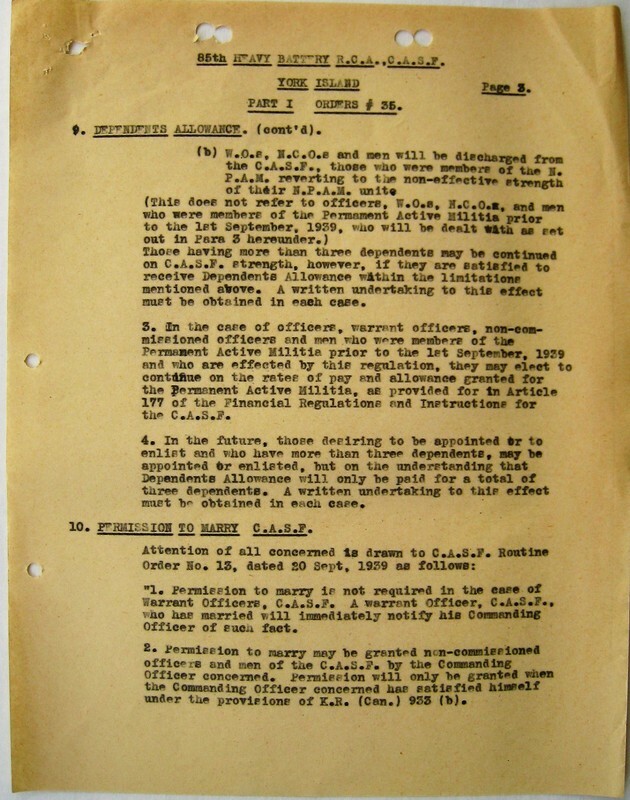 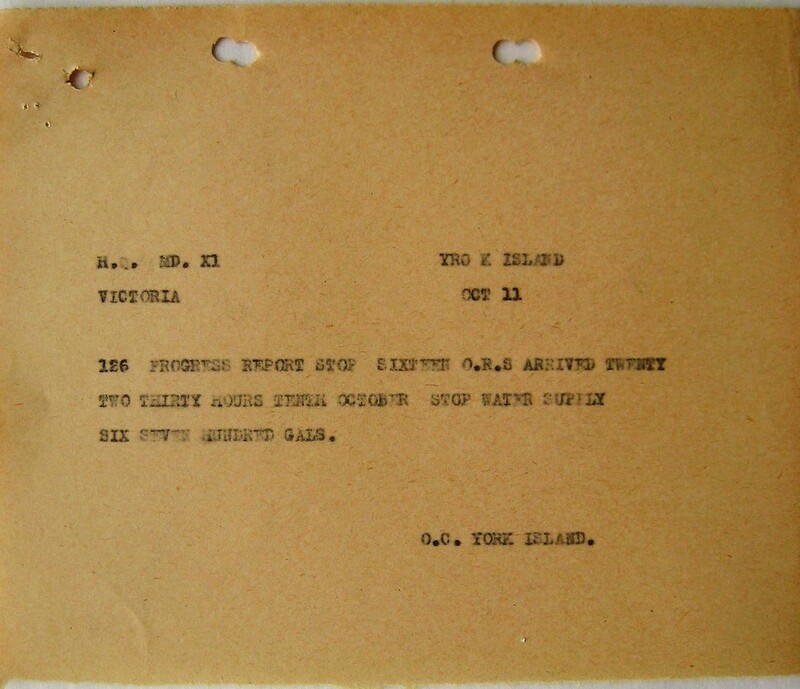 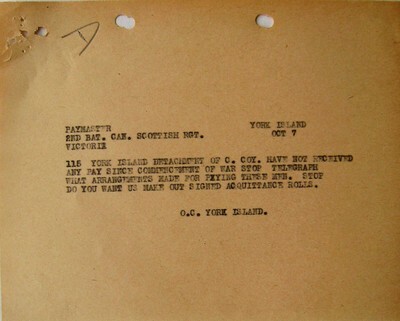 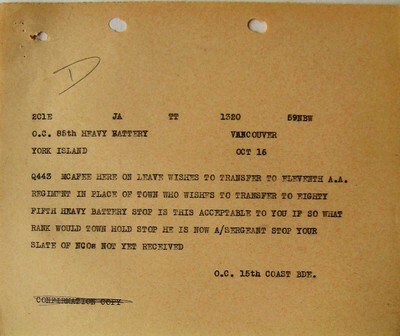 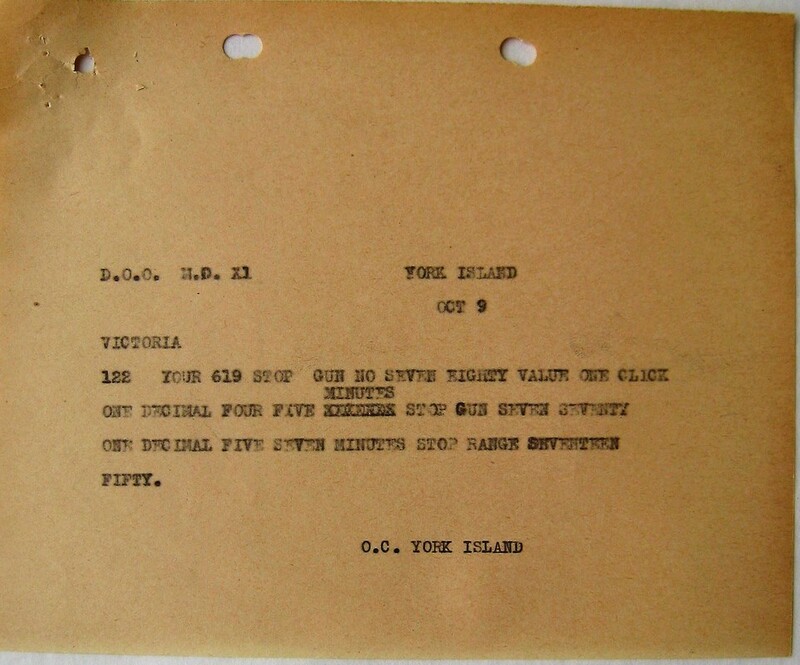 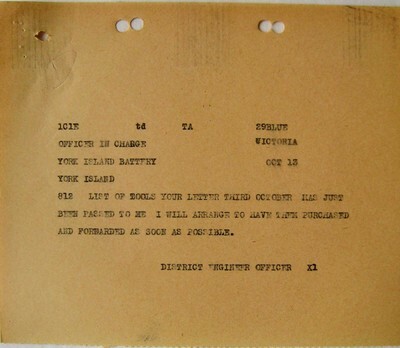 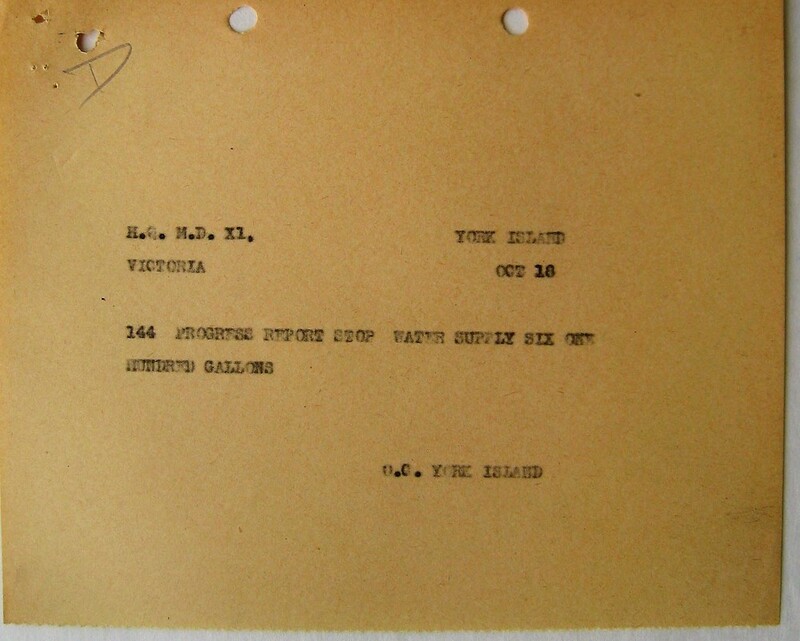 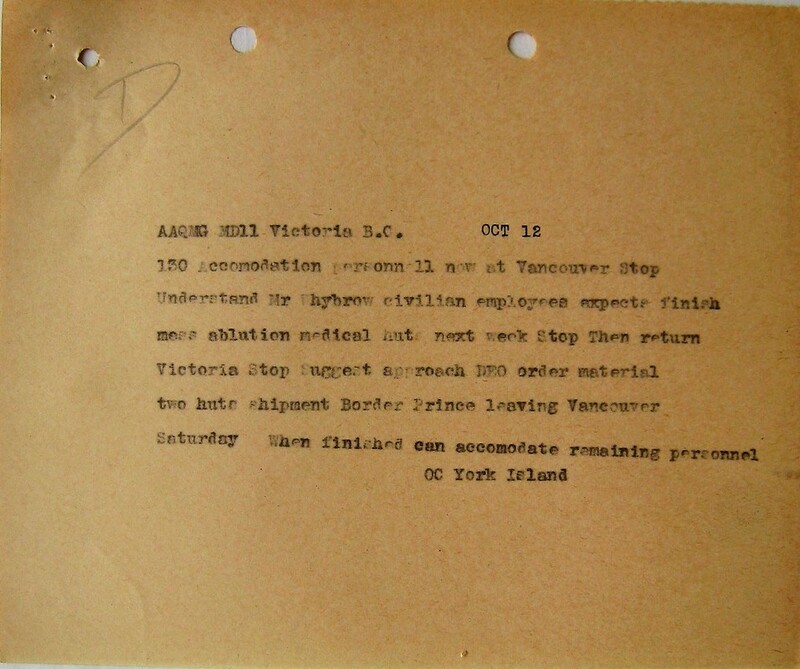 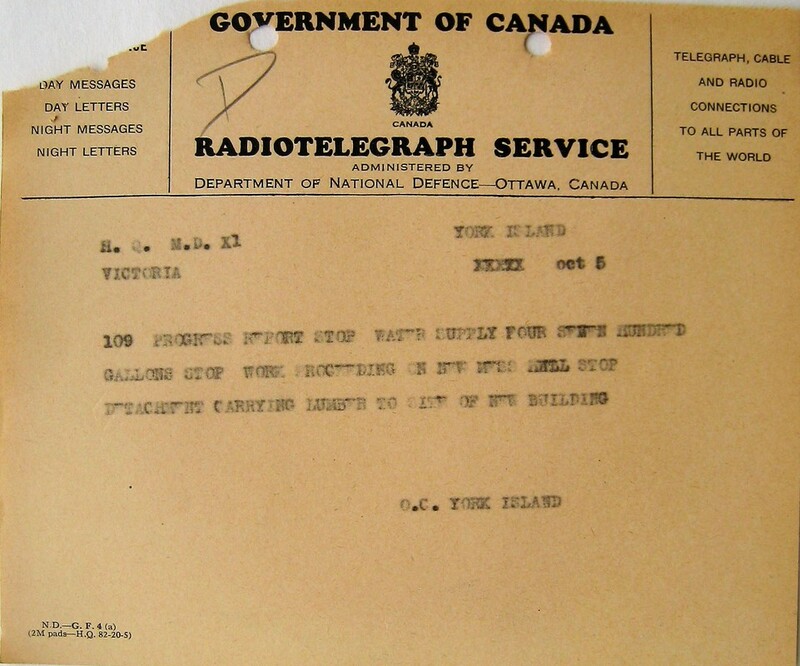 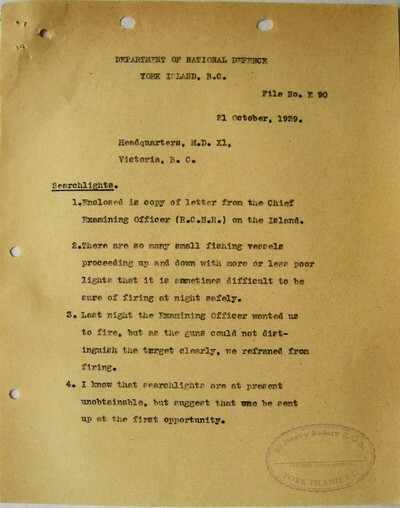 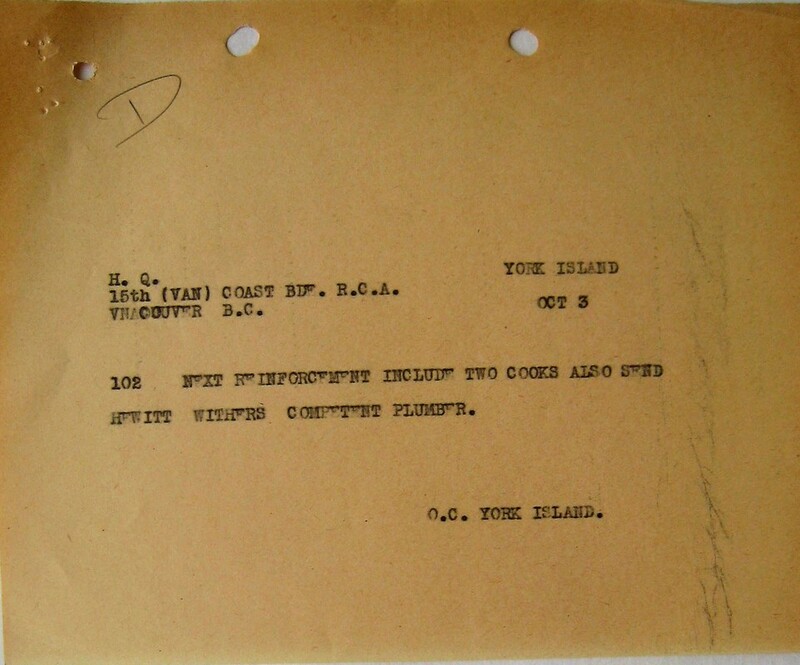 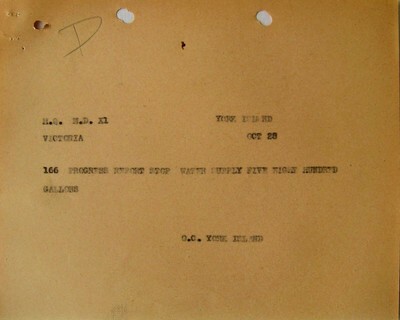 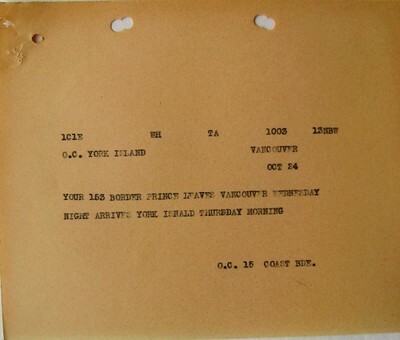 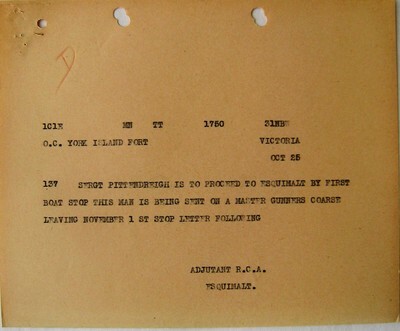 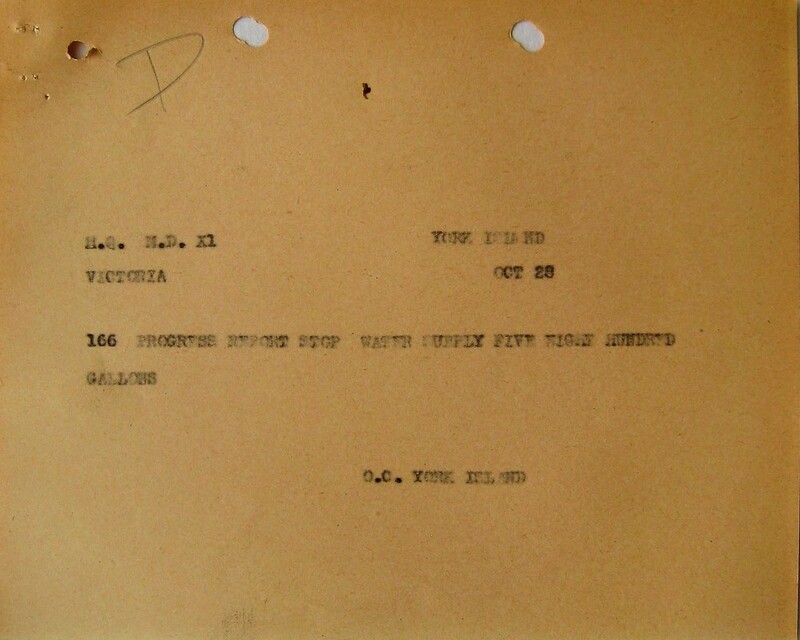 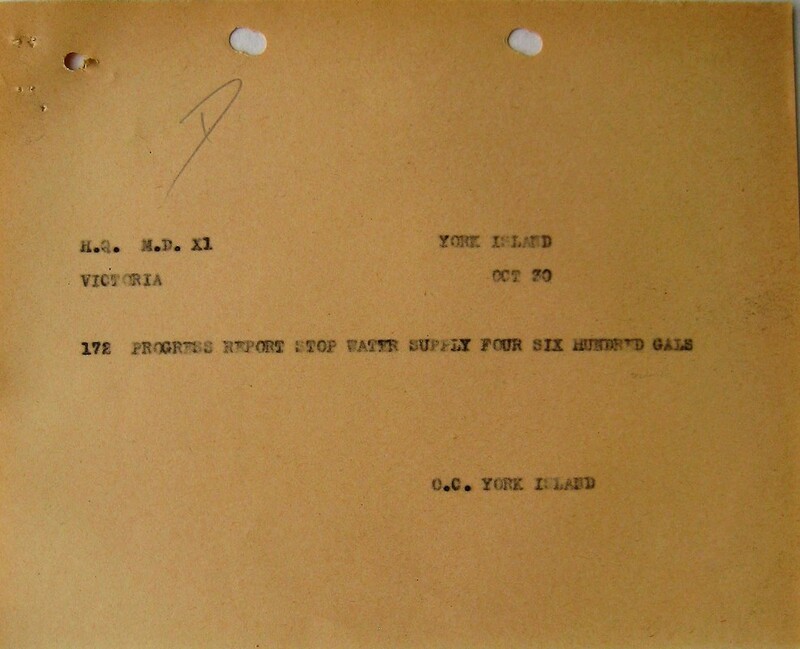 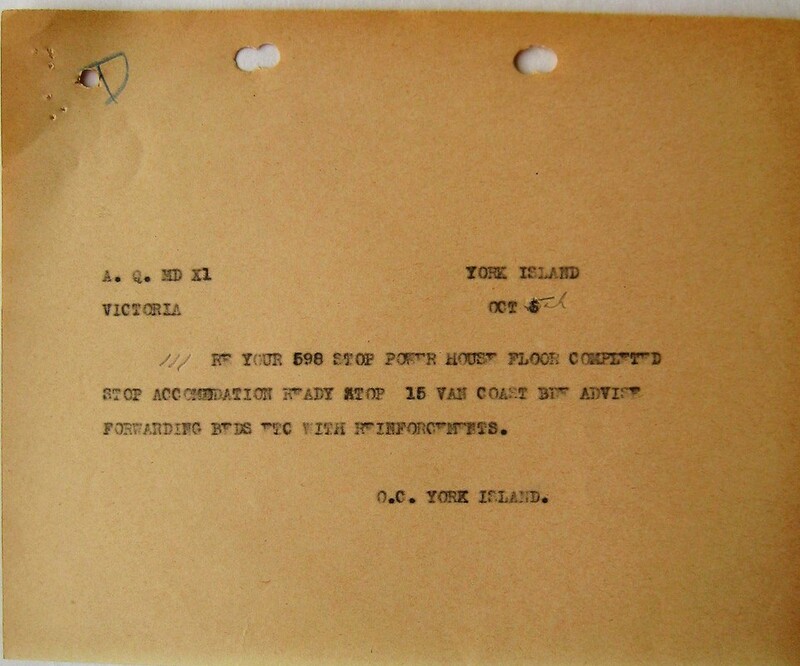 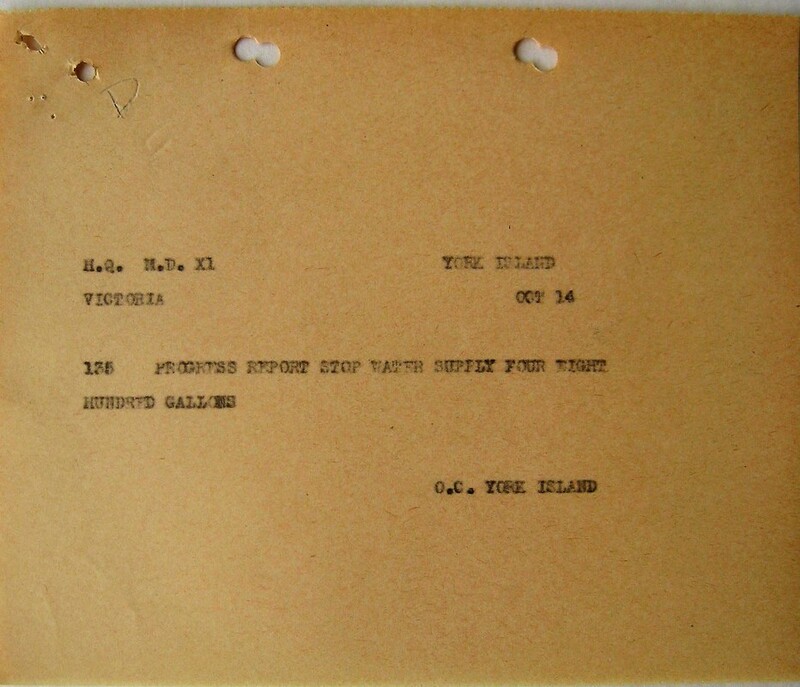 ​Letter re personnel (see App. 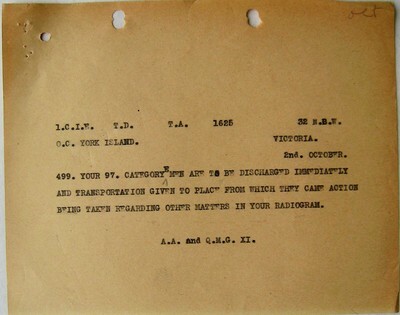 "G"). SS "Columbia" called. 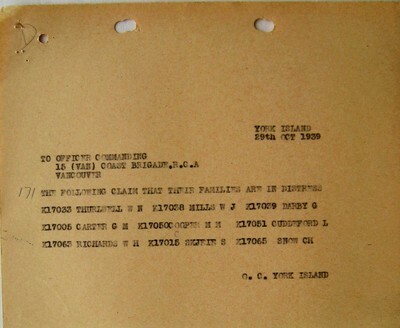 Church service held. 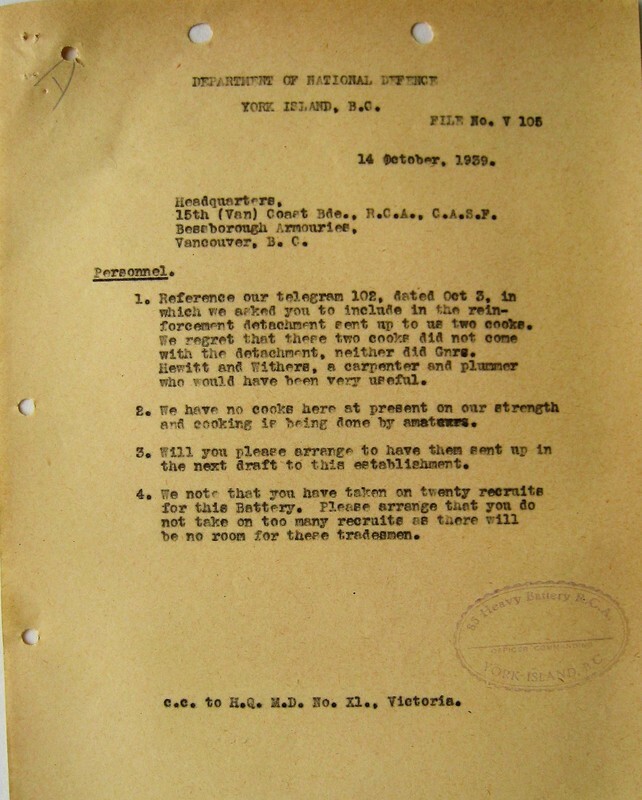 ​Letter re accommodation (see App. 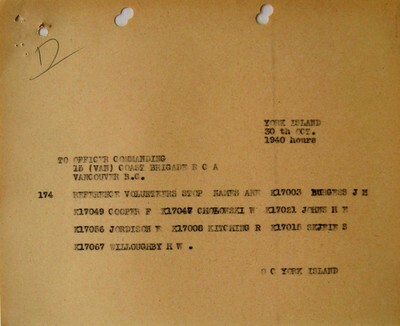 "E"). 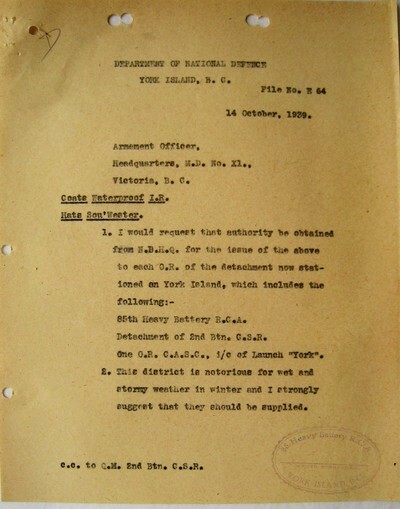 Letter re shelter for reserve watch (see app. "E"). 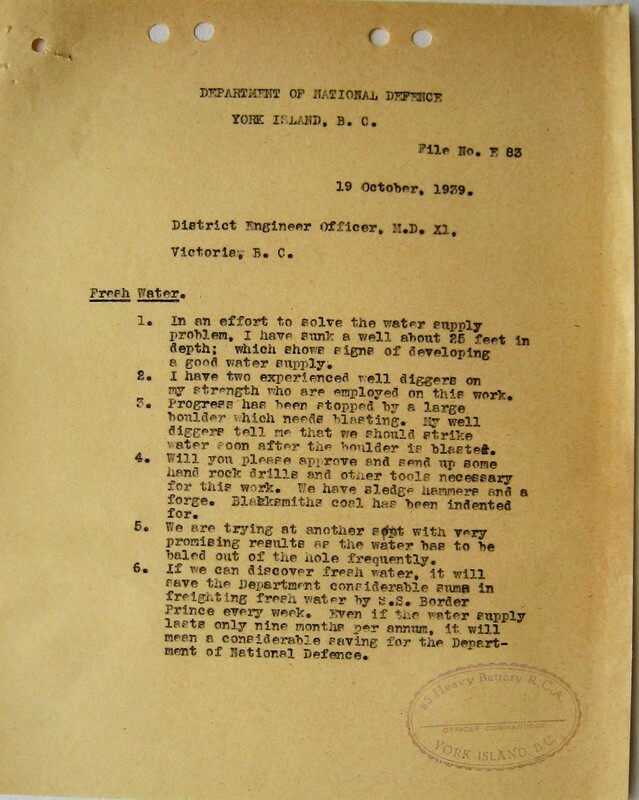 ​"Border Prince" delivered water and tools. 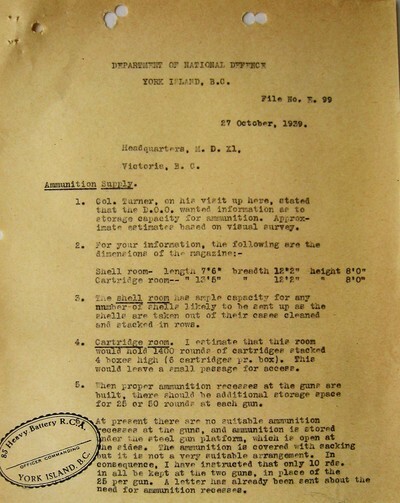 ​Letter re ammunition (see App. 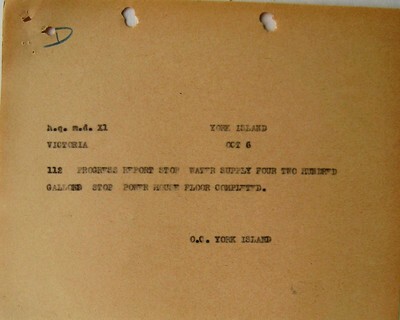 "E"). Letter re fresh water (see App. 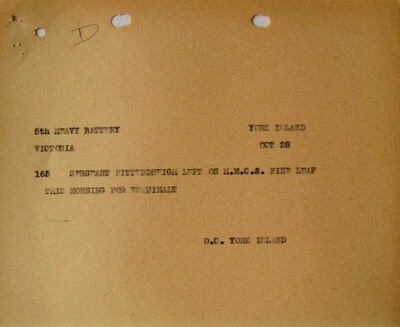 "E"). 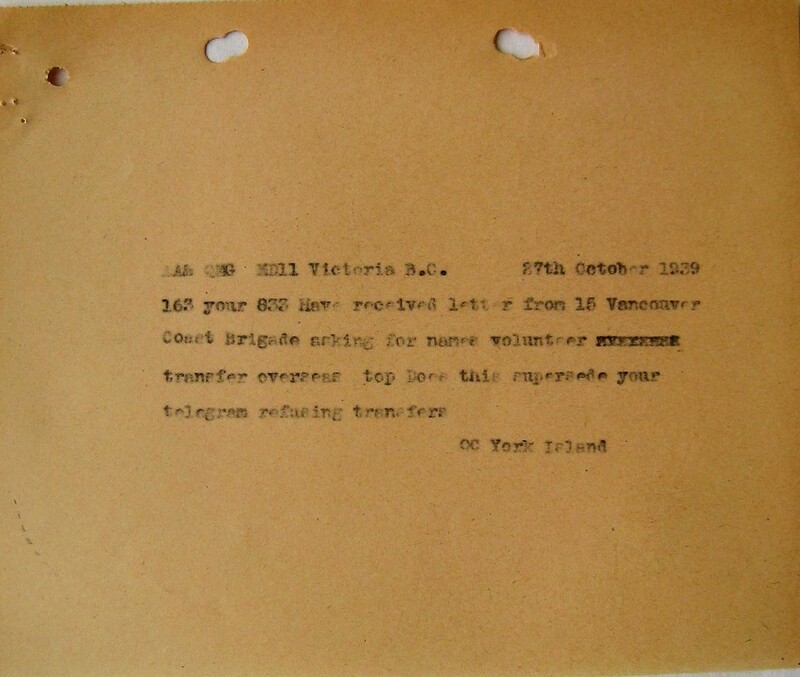 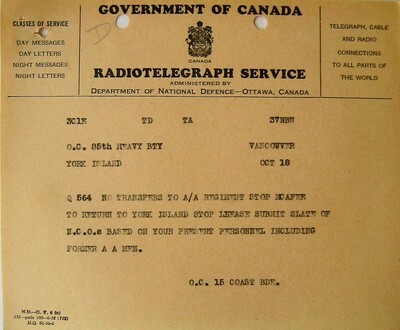 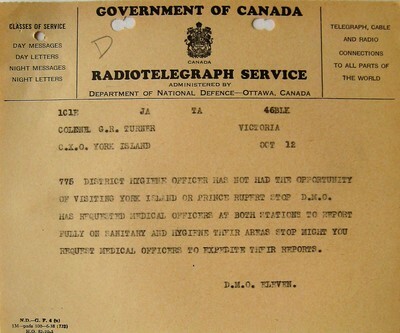 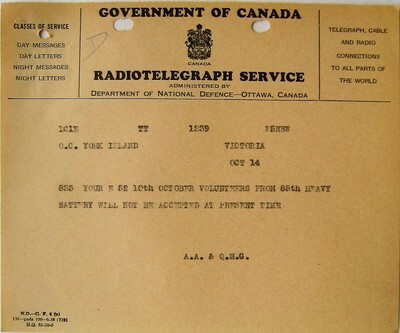 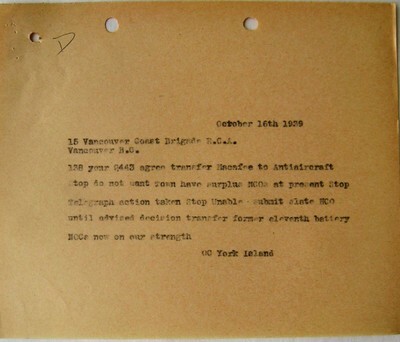 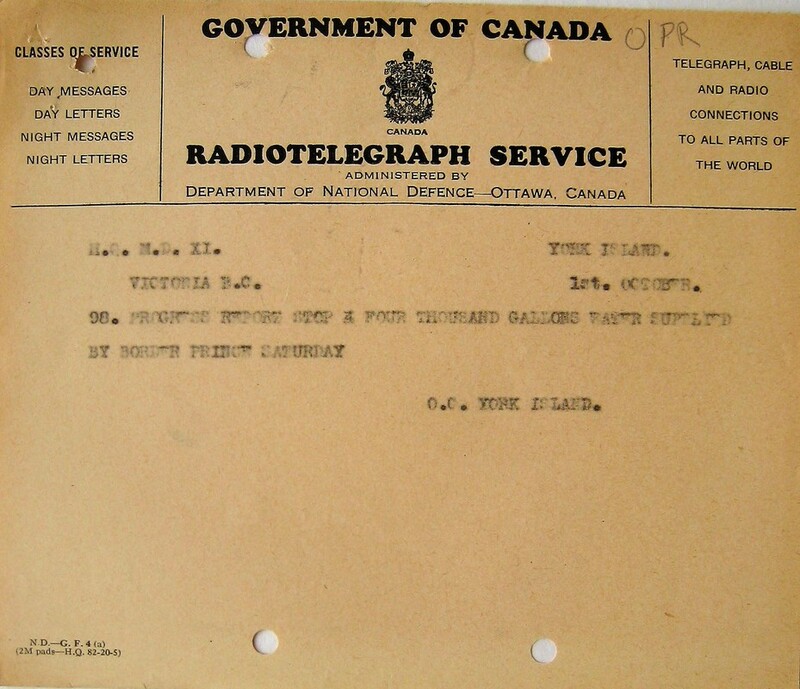 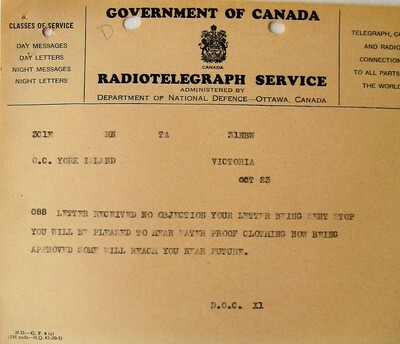 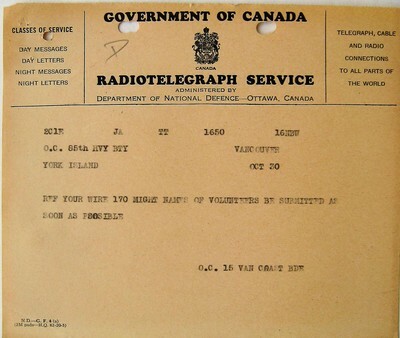 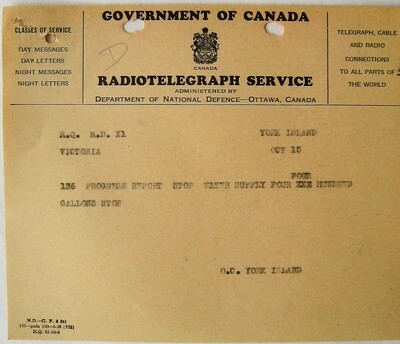 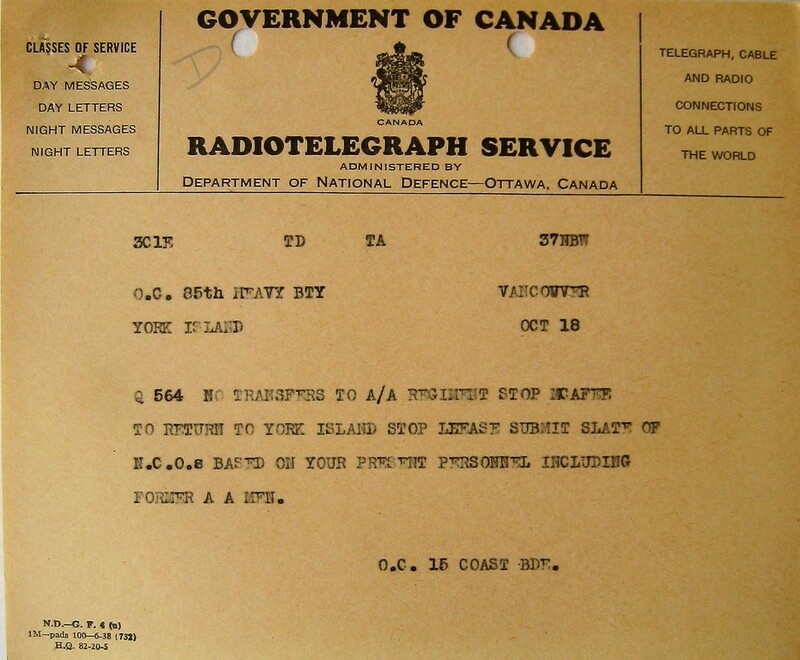 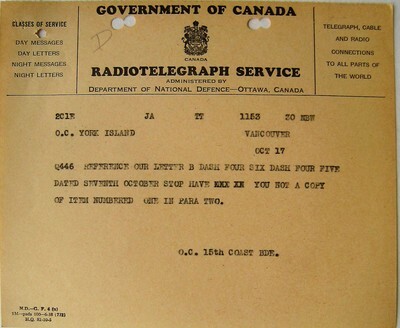 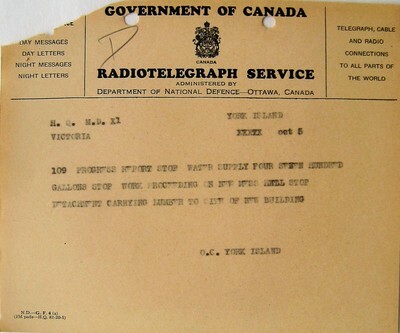 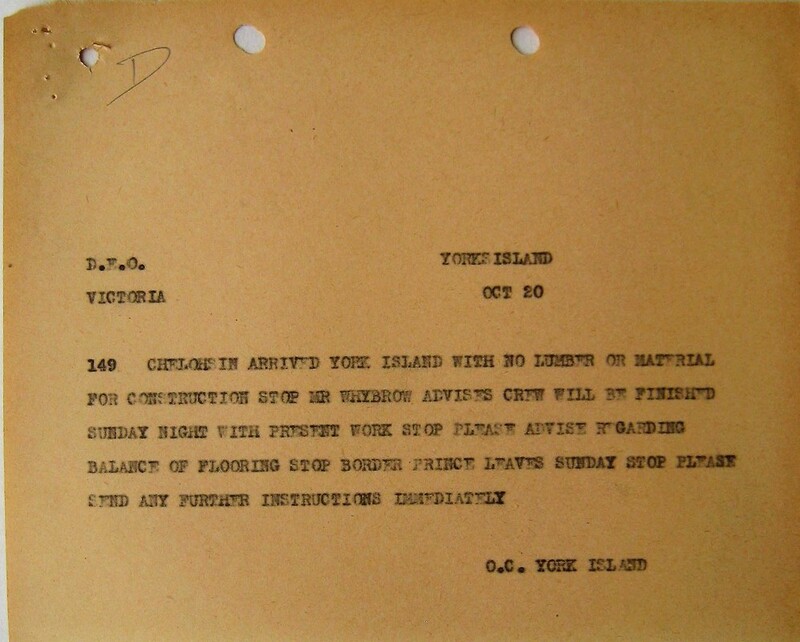 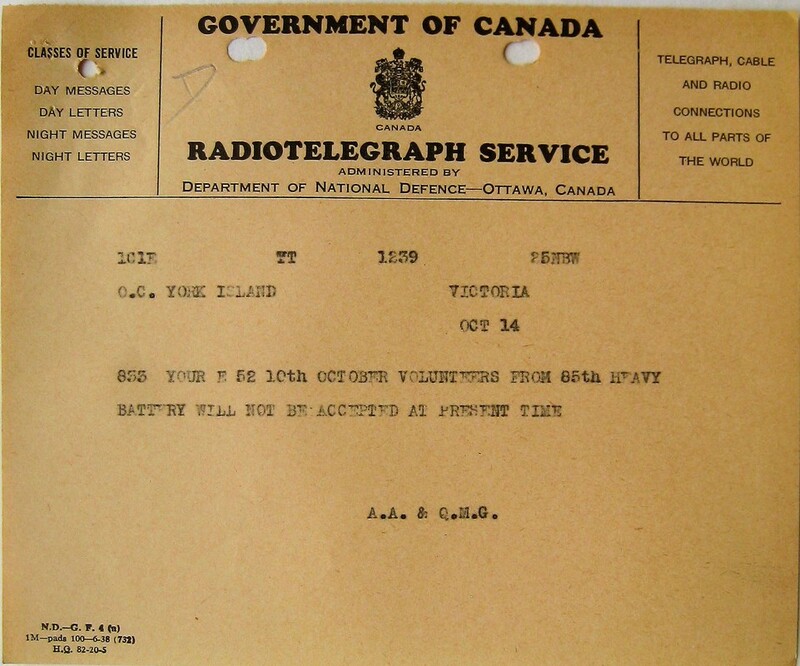 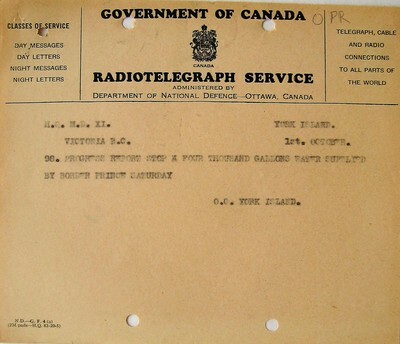 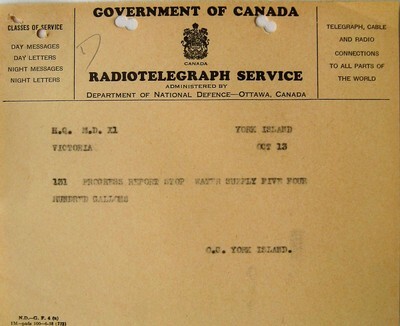 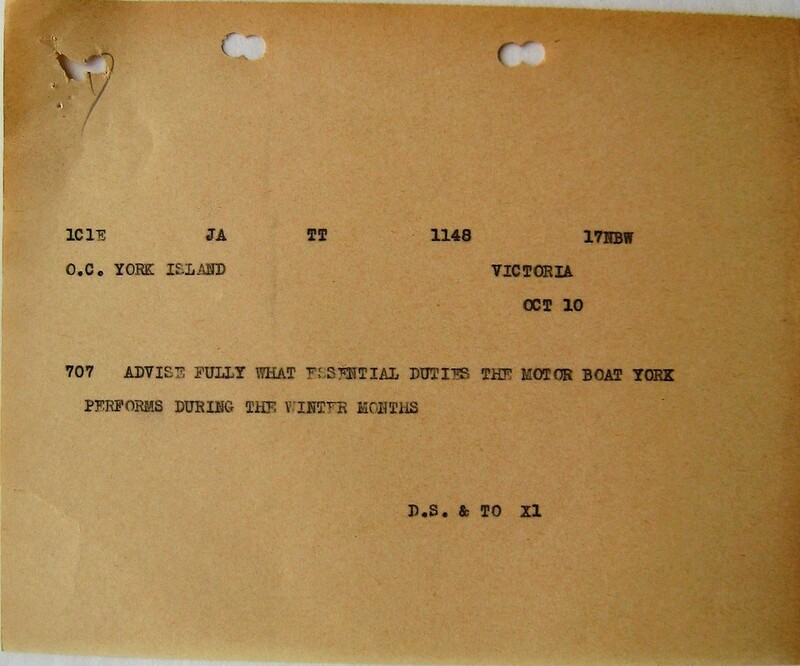 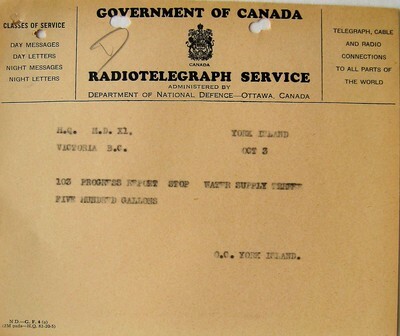 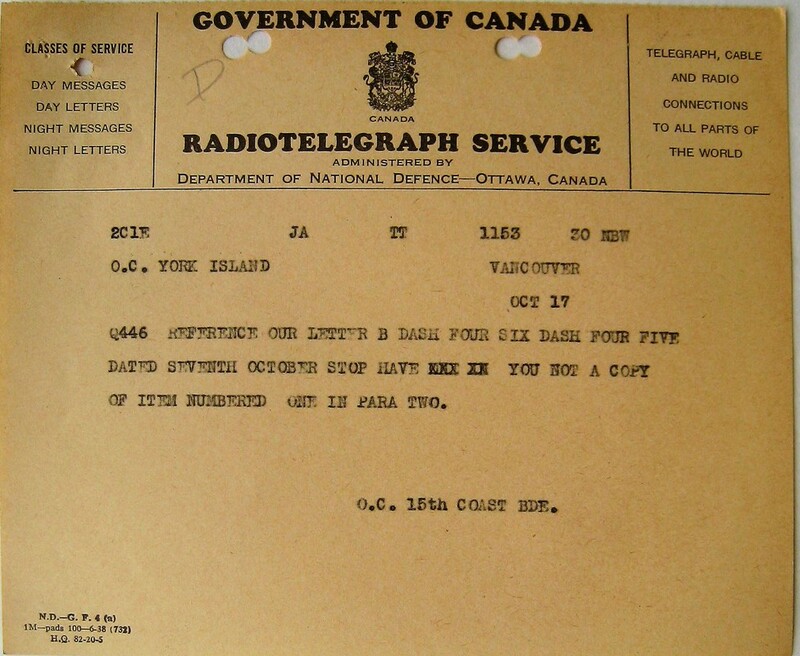 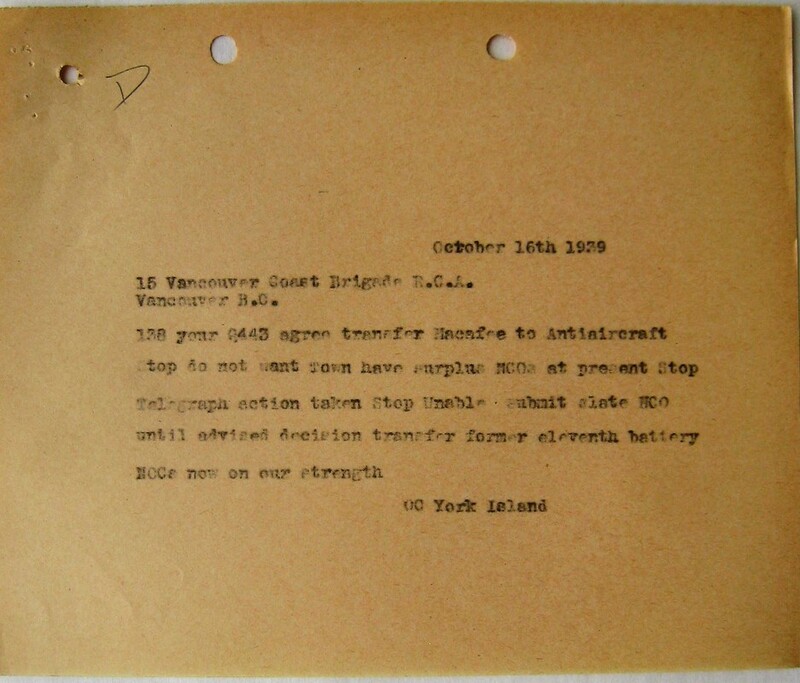 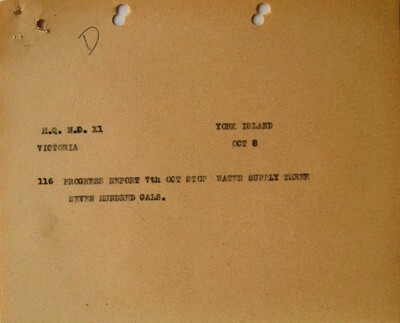 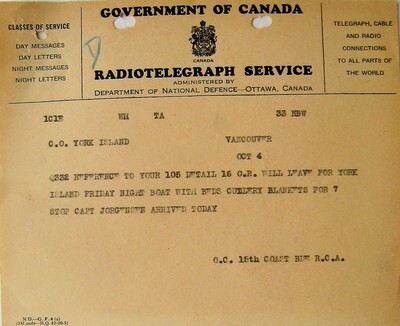 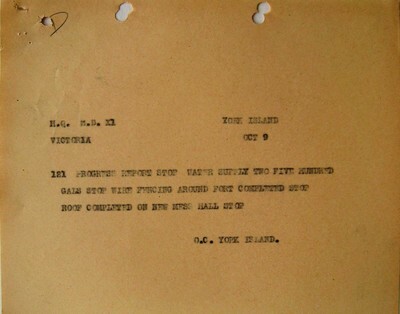 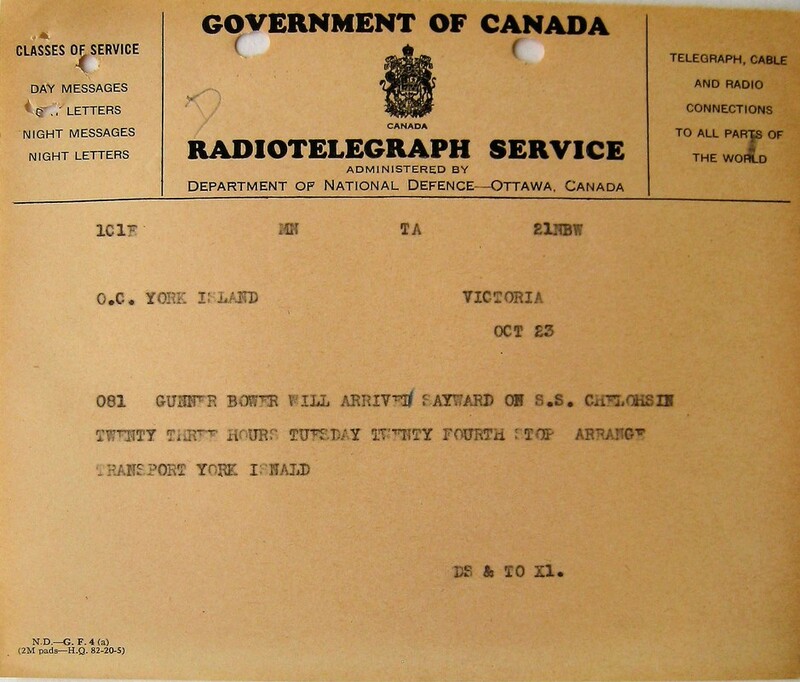 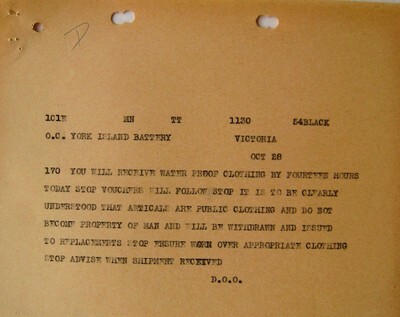 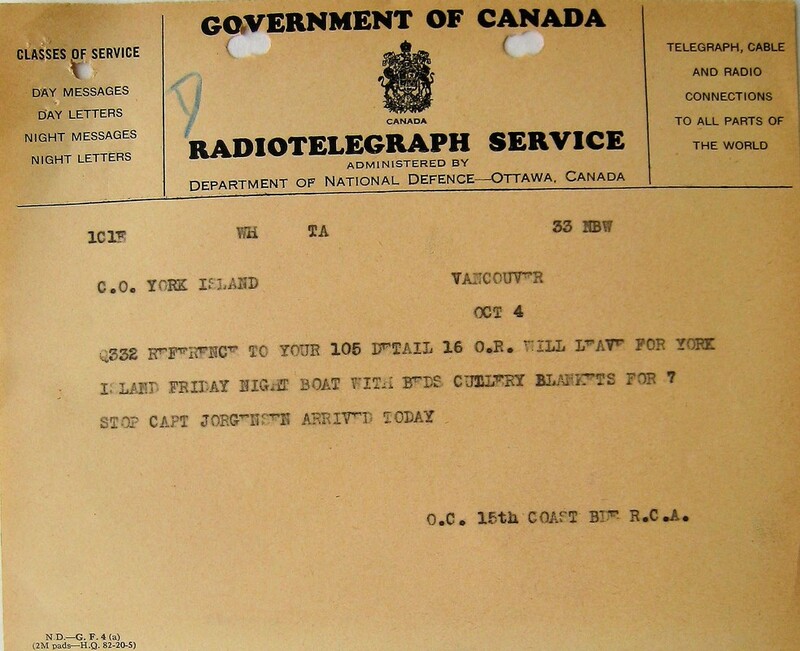 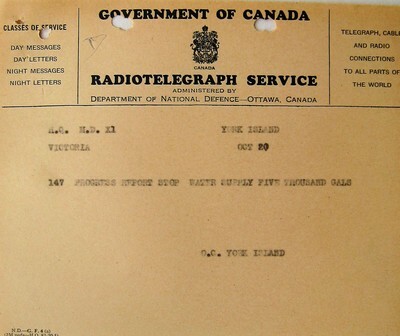 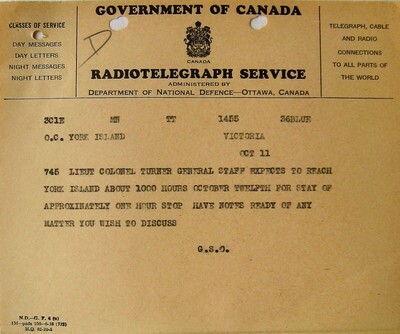 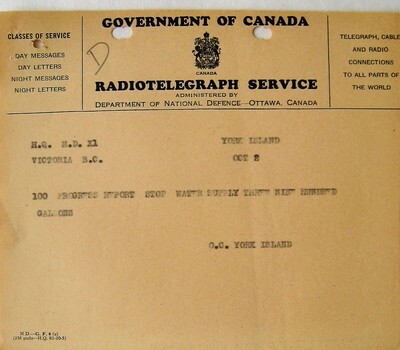 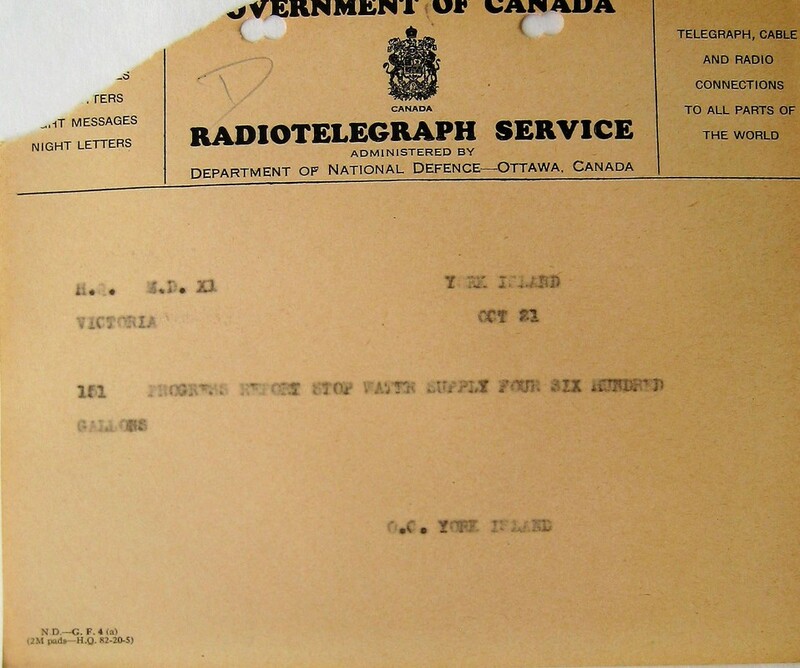 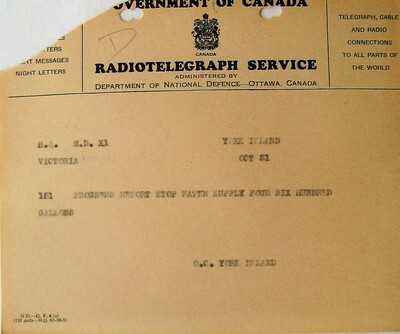 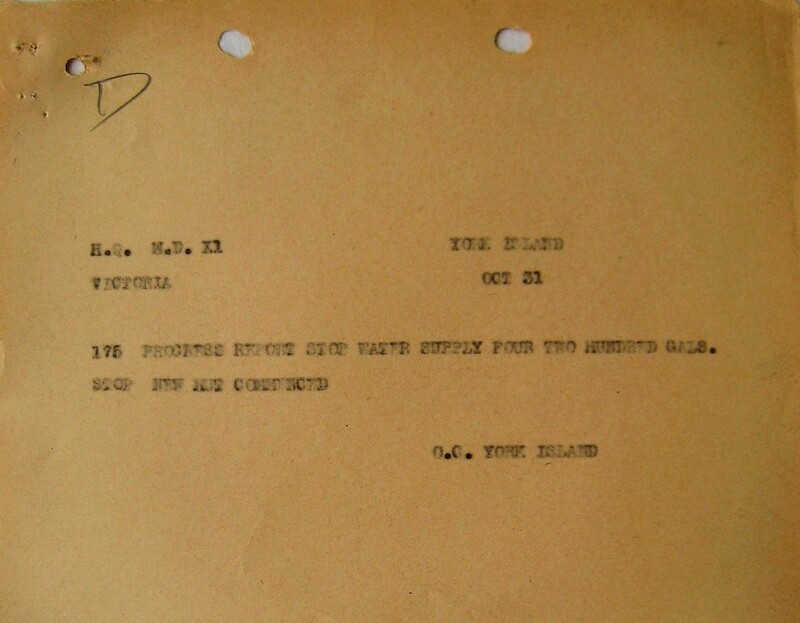 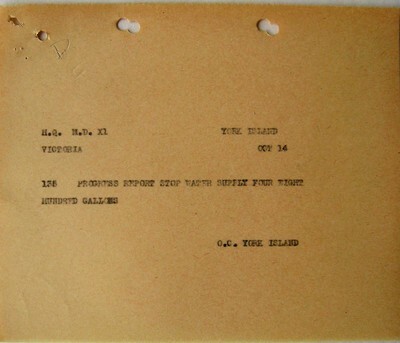 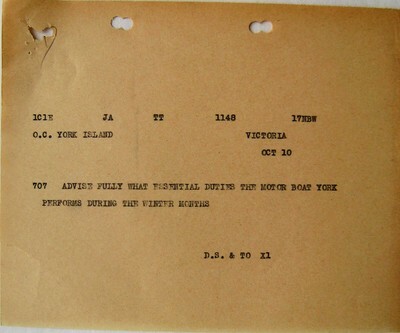 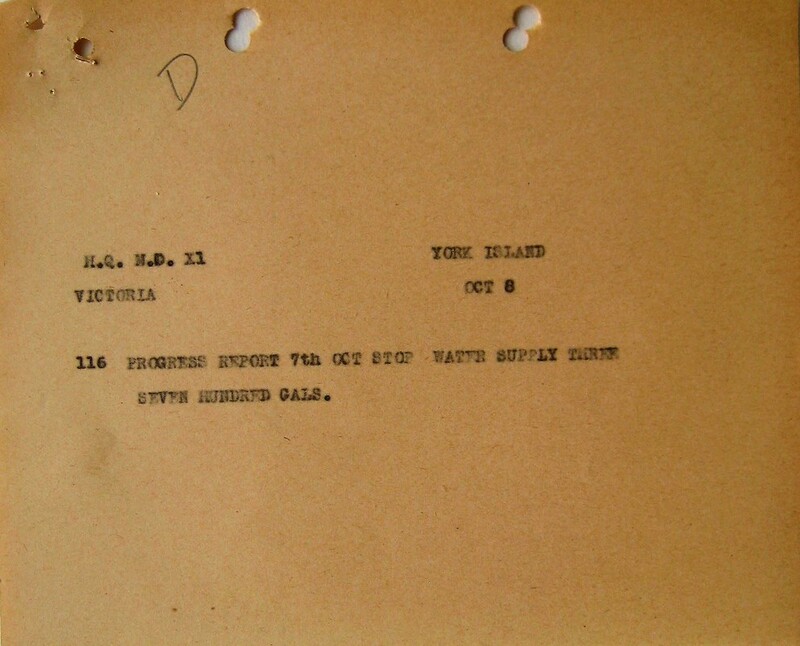 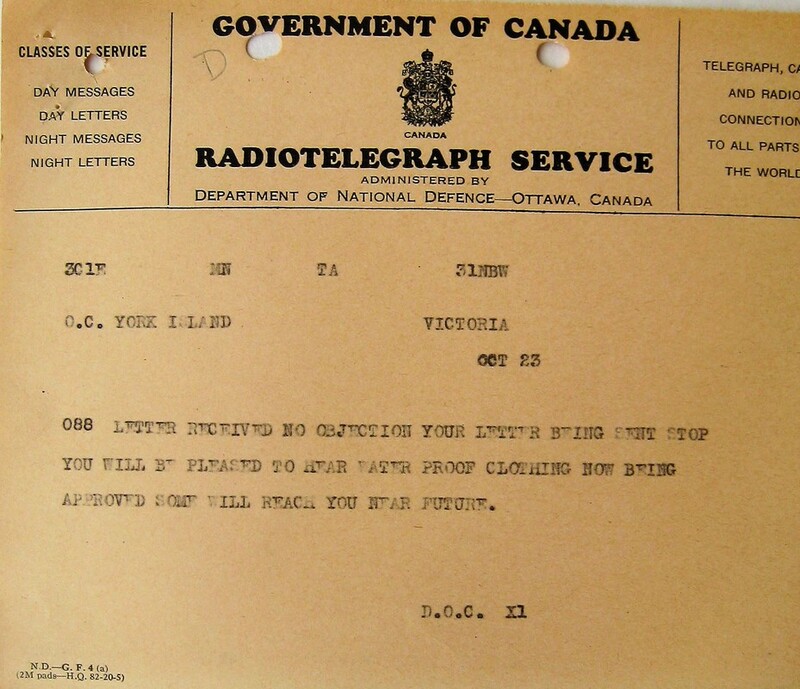 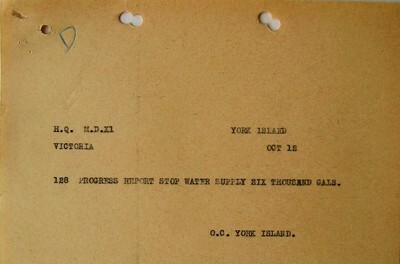 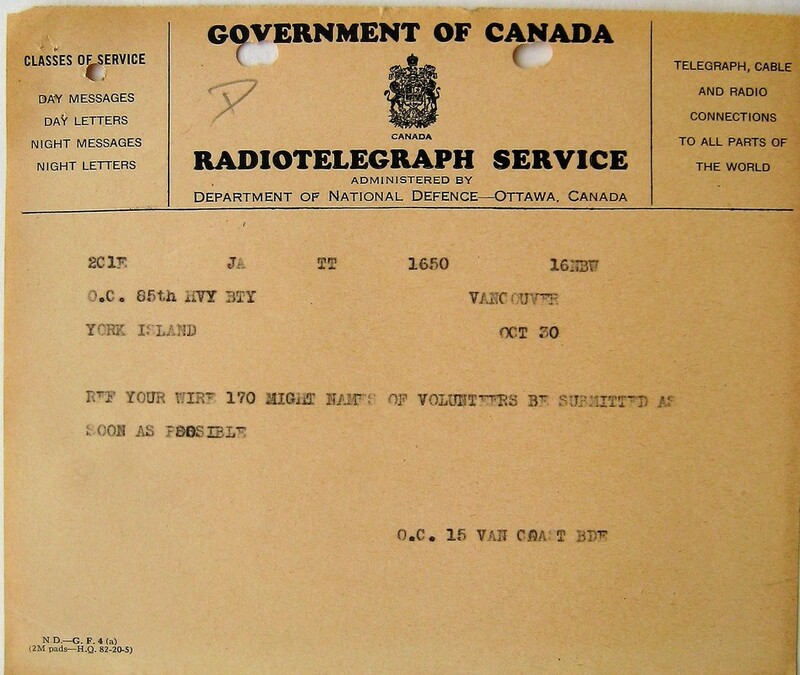 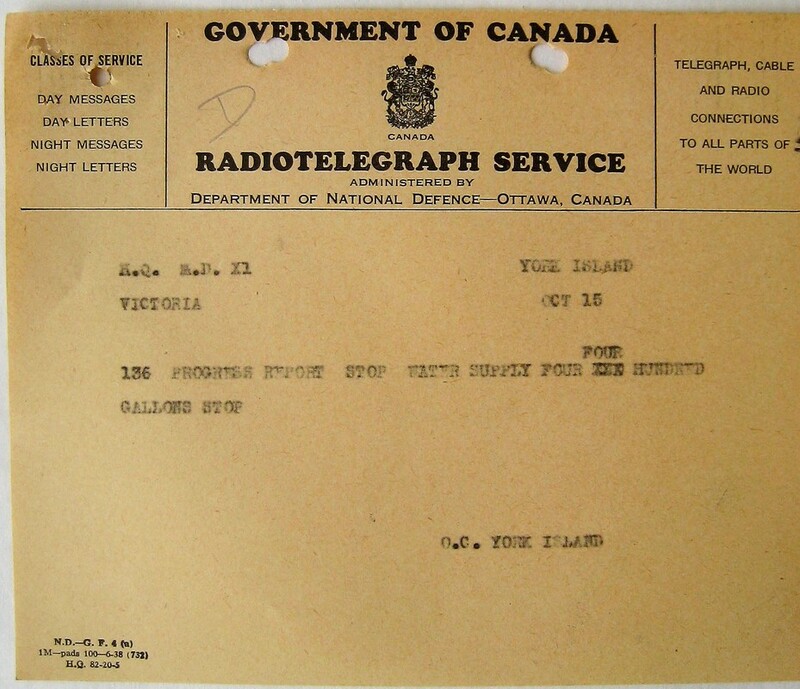 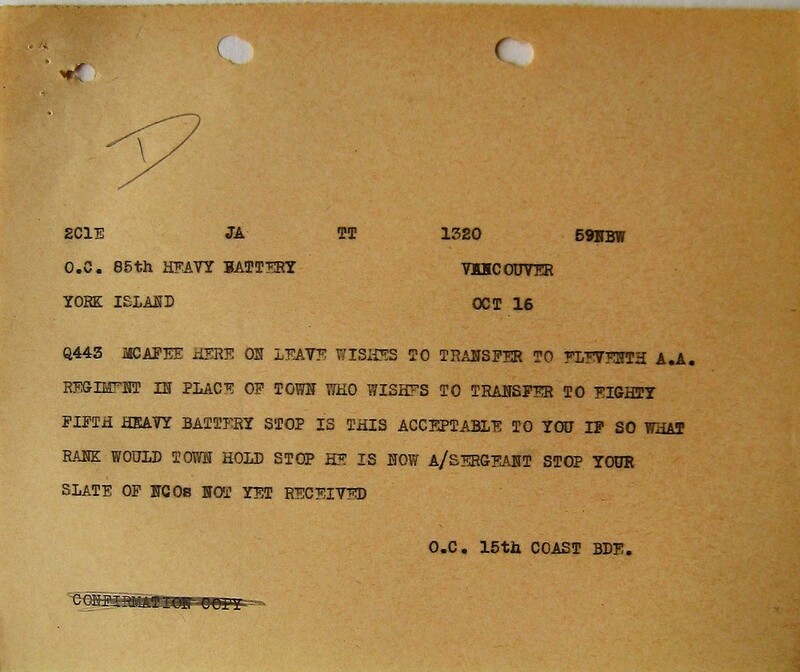 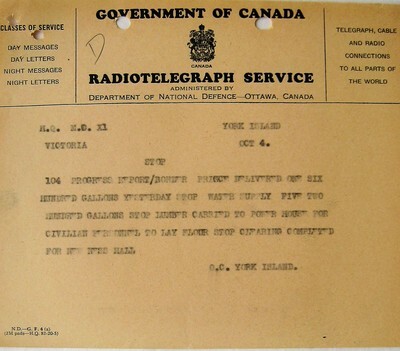 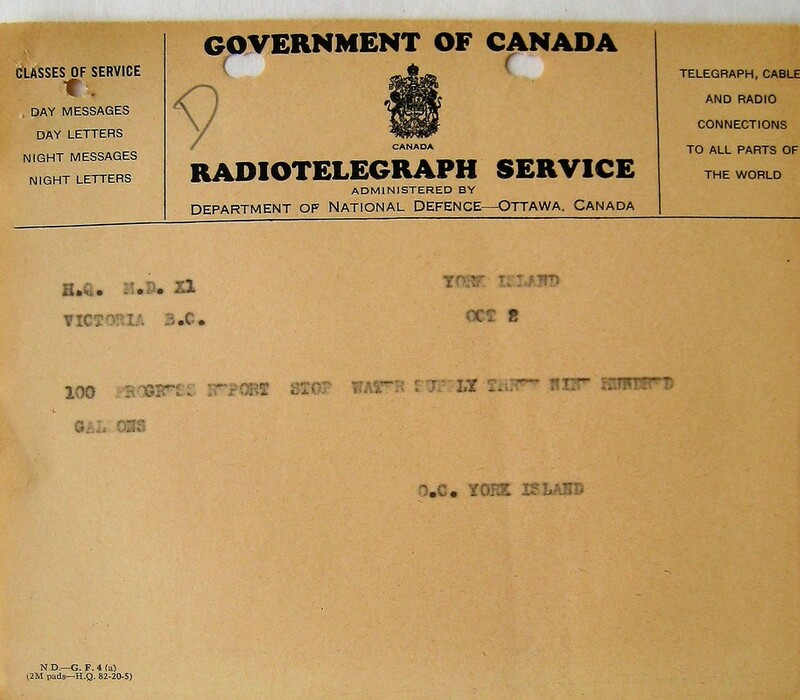 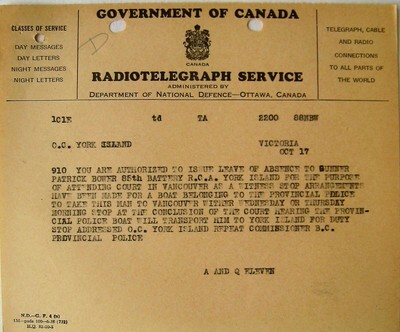 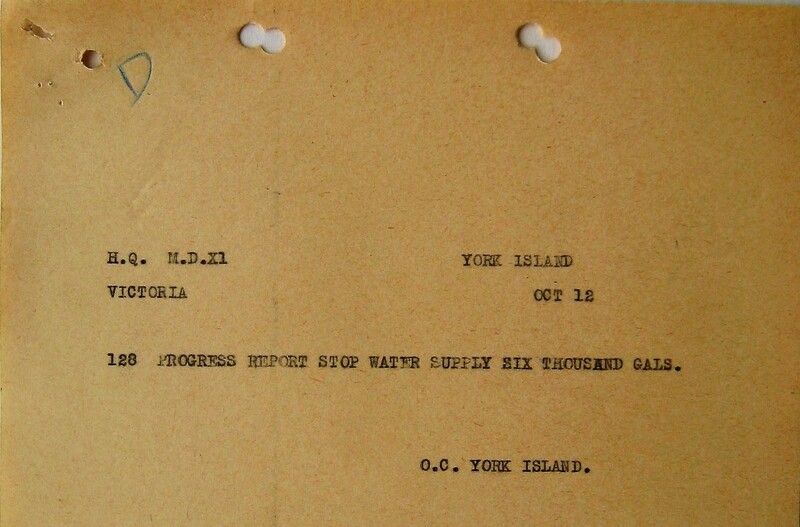 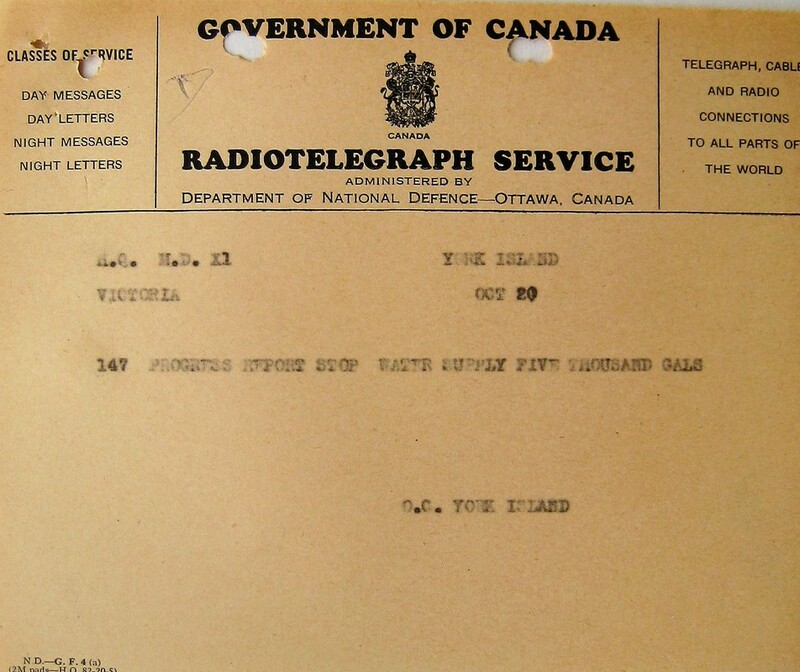 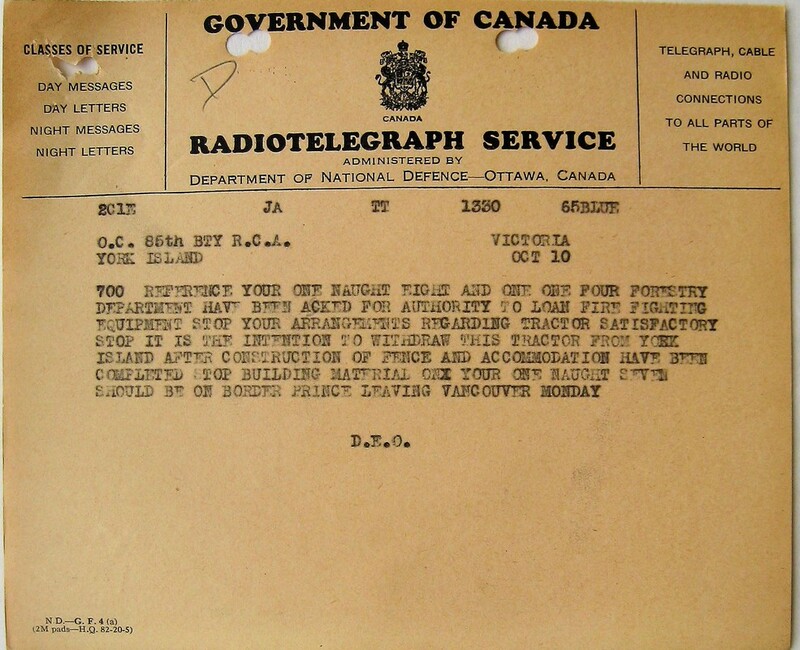 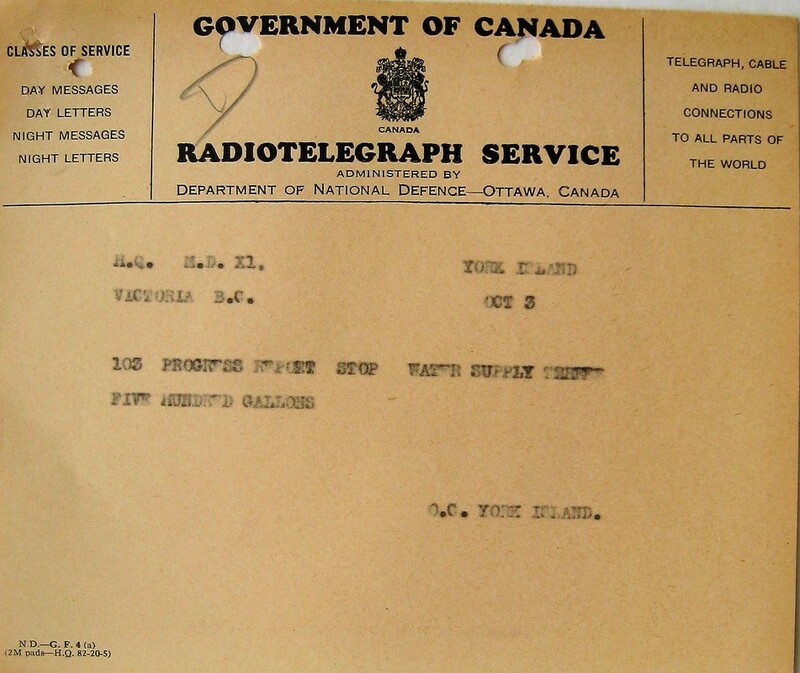 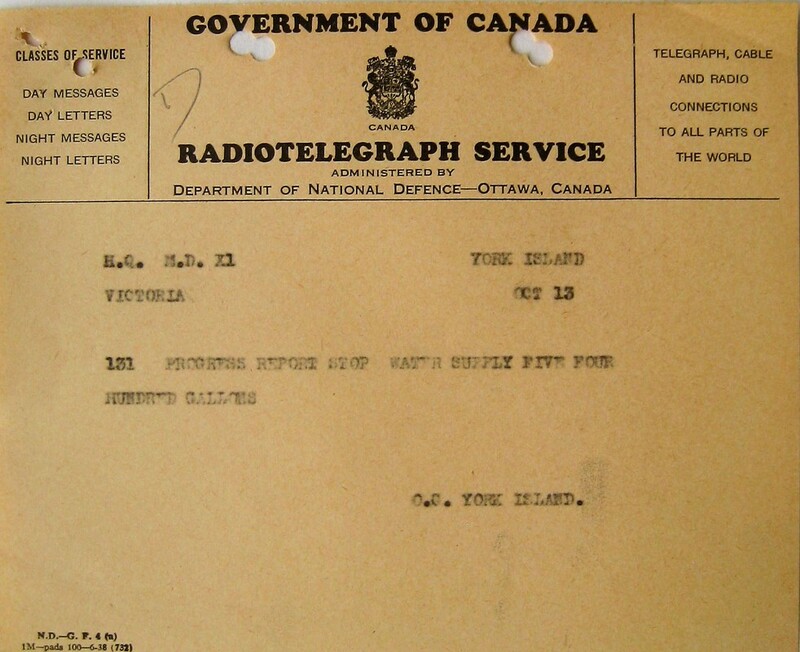 ​Letter re rations. 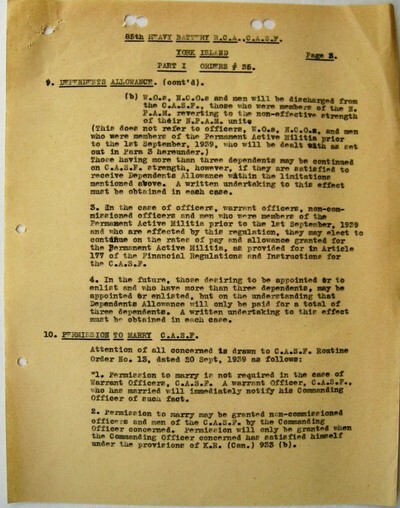 Civilian employees (see App. 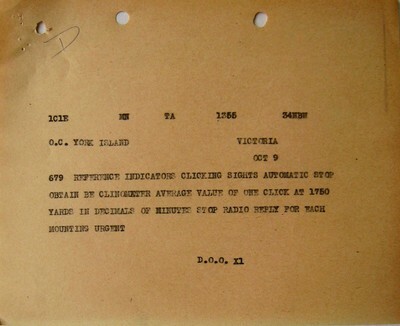 "E"). ​Letter re slate of N.C.O's (see App. 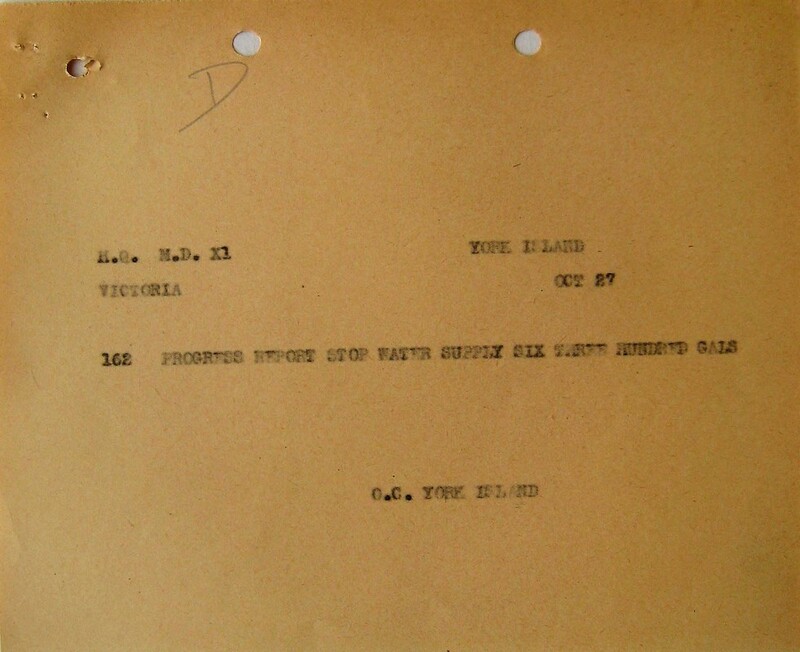 "E"). ​Letter re ammunition supply (see App. 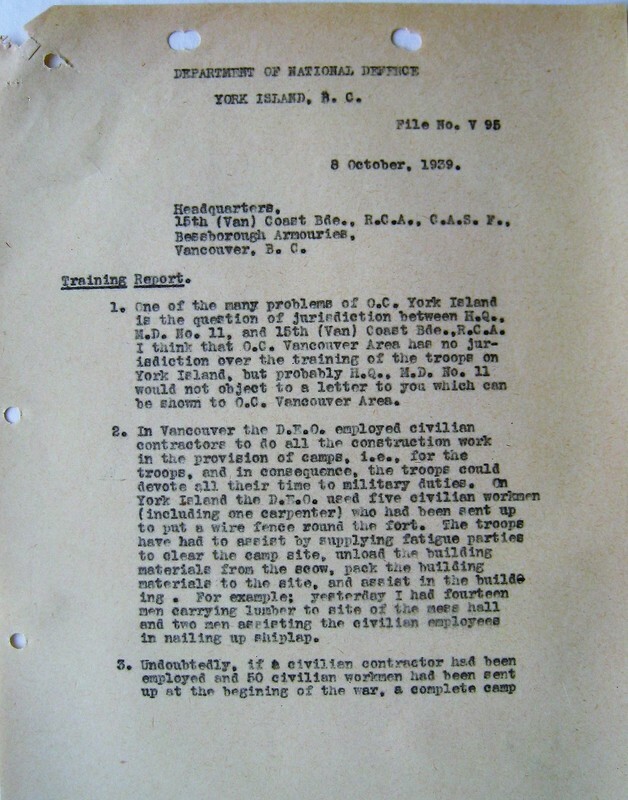 "E"). 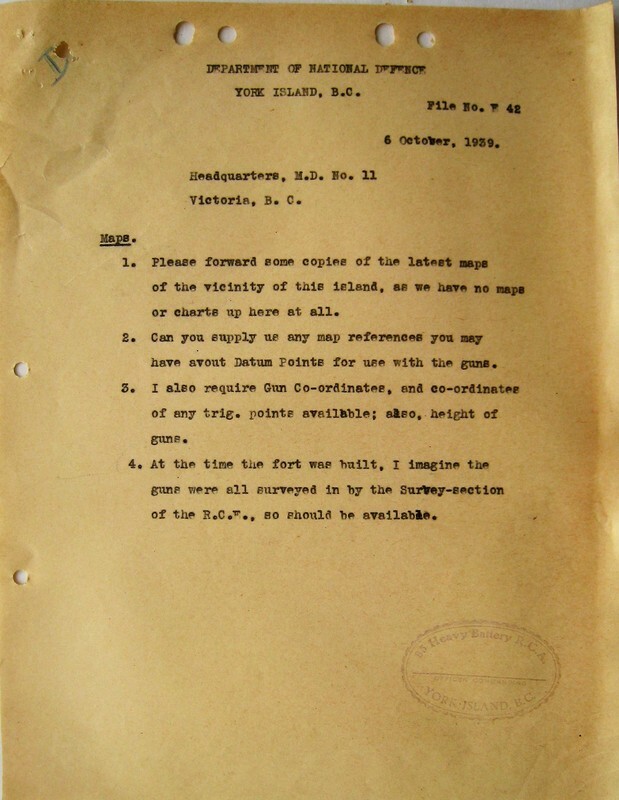 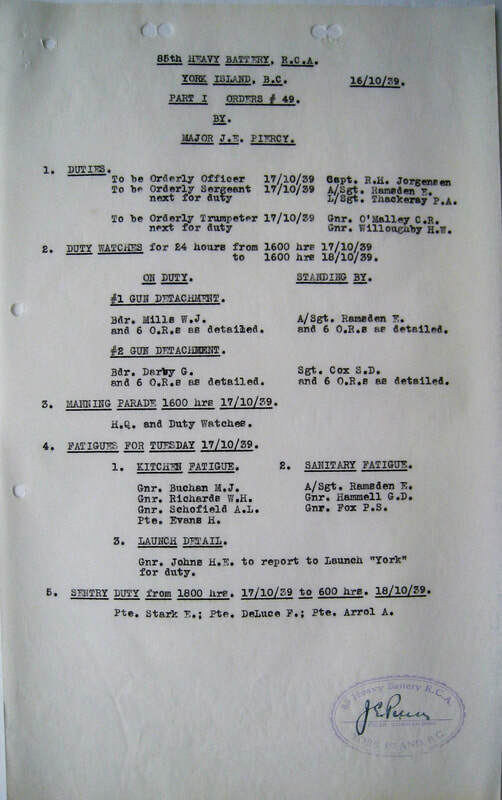 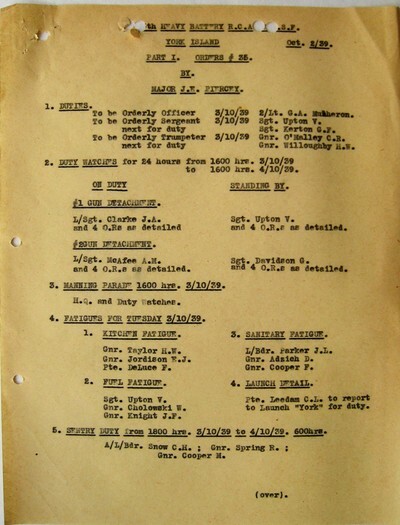 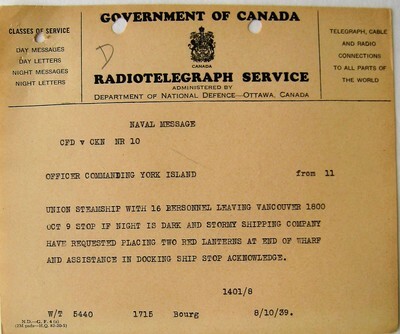 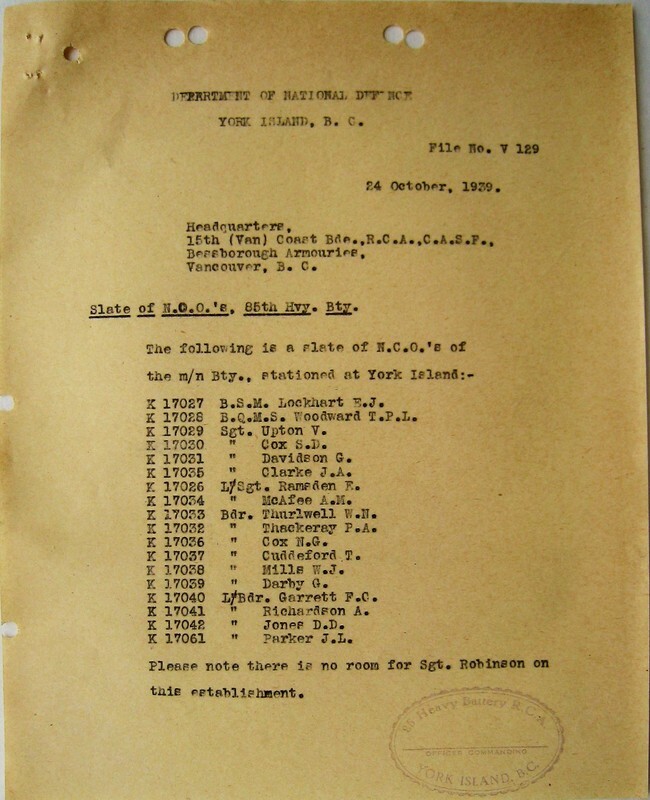 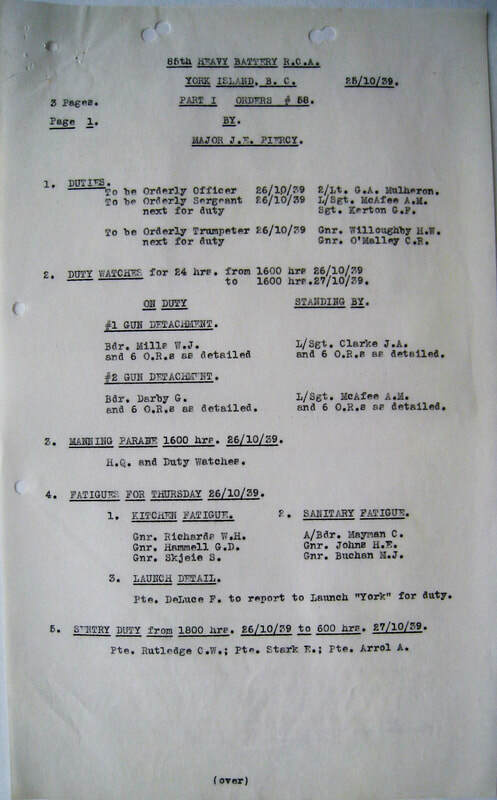 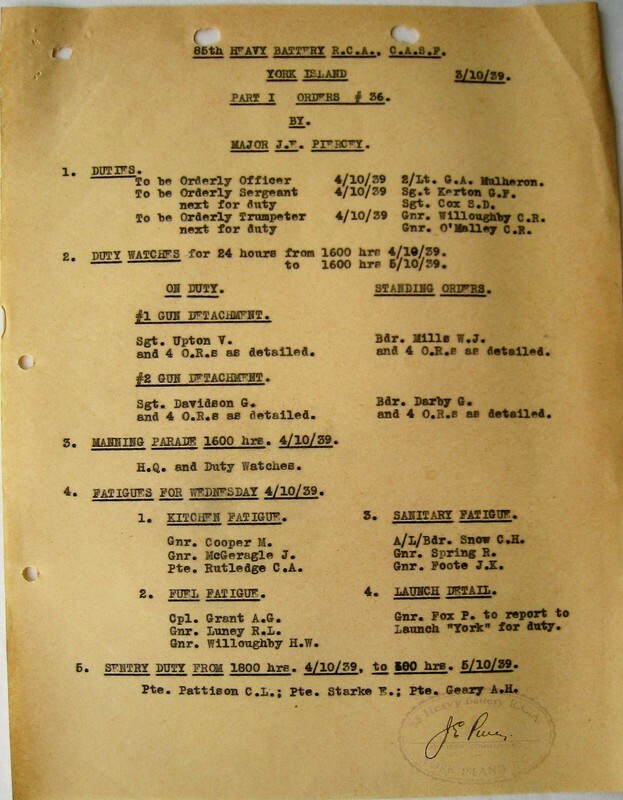 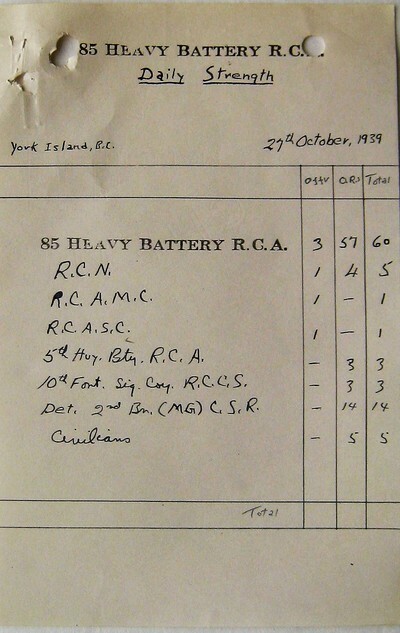 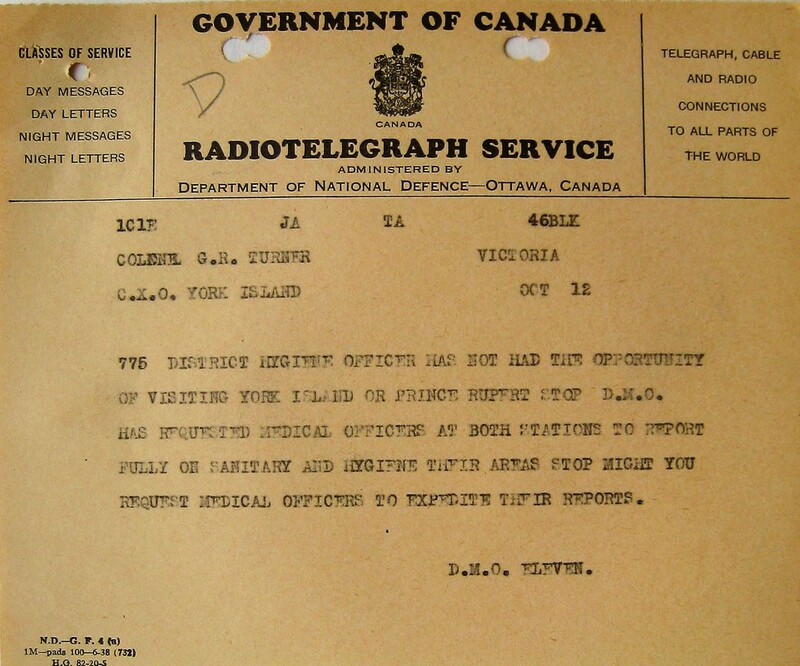 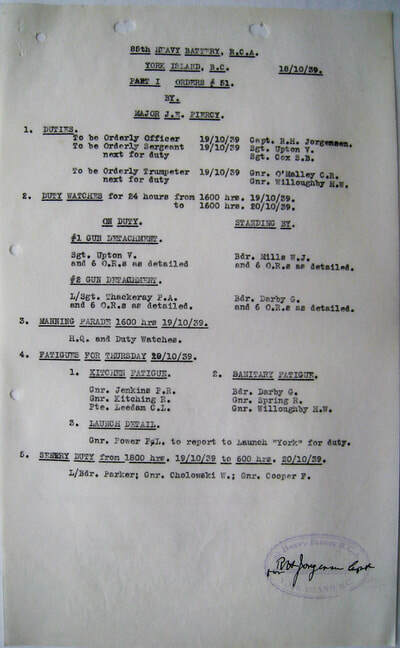 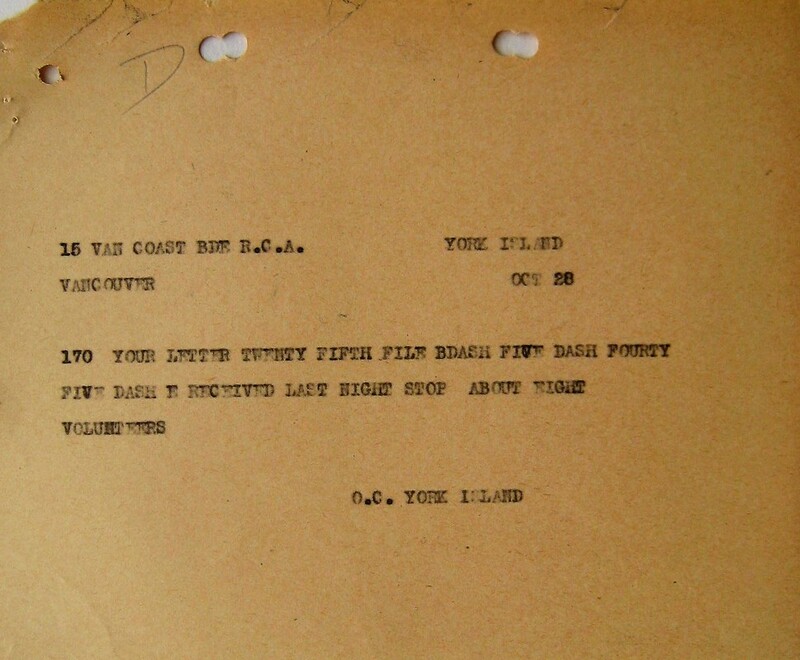 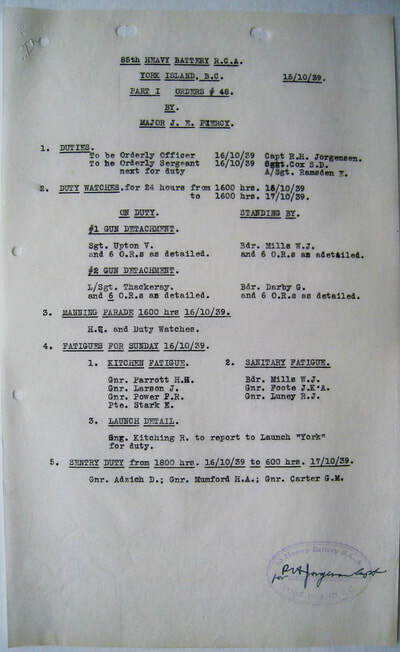 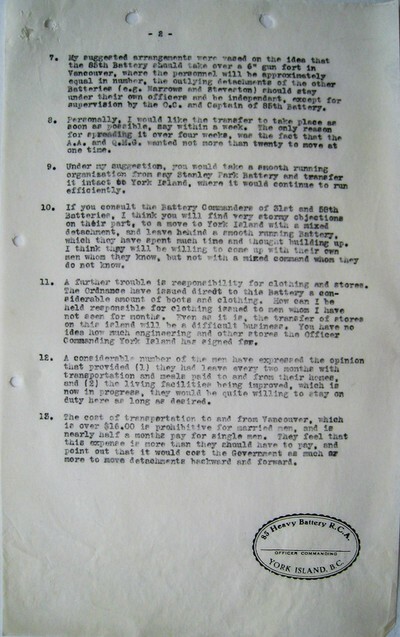 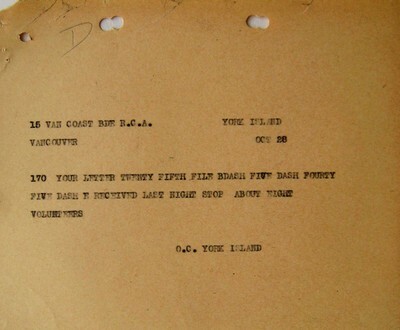 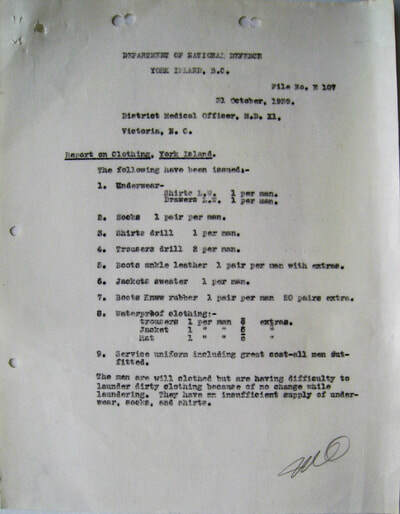 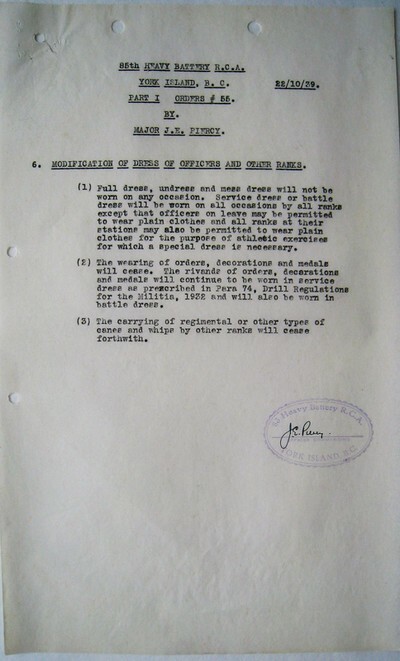 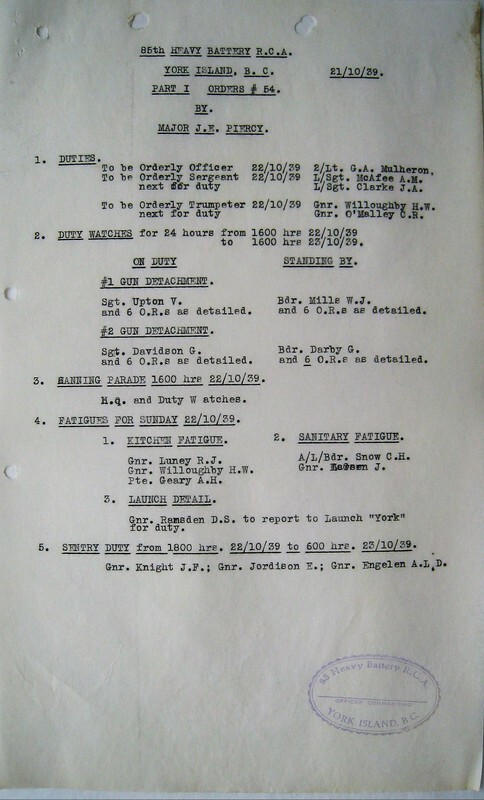 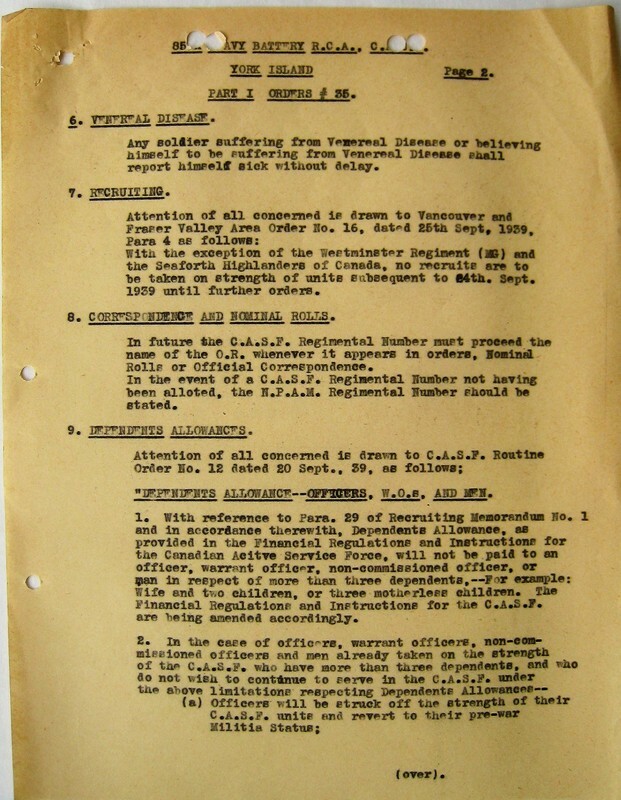 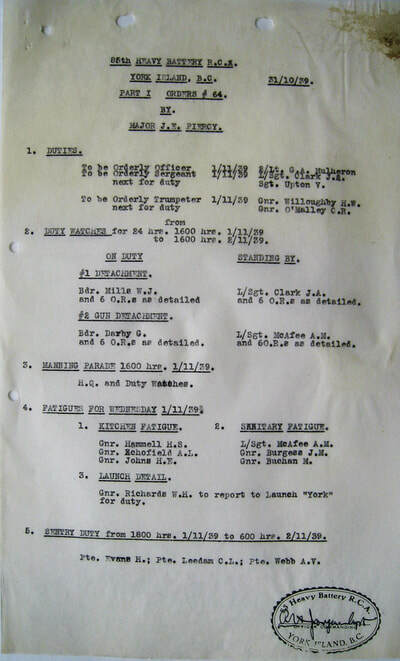 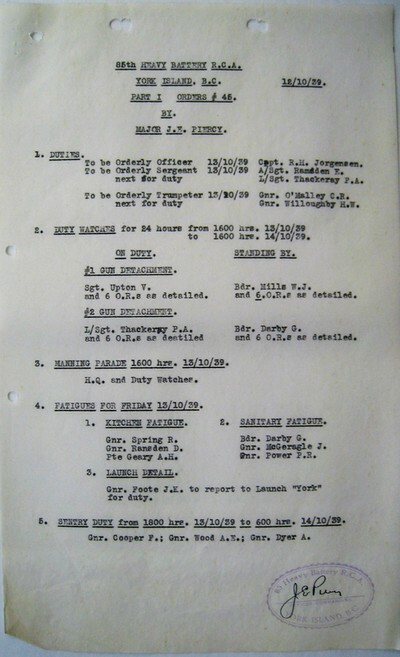 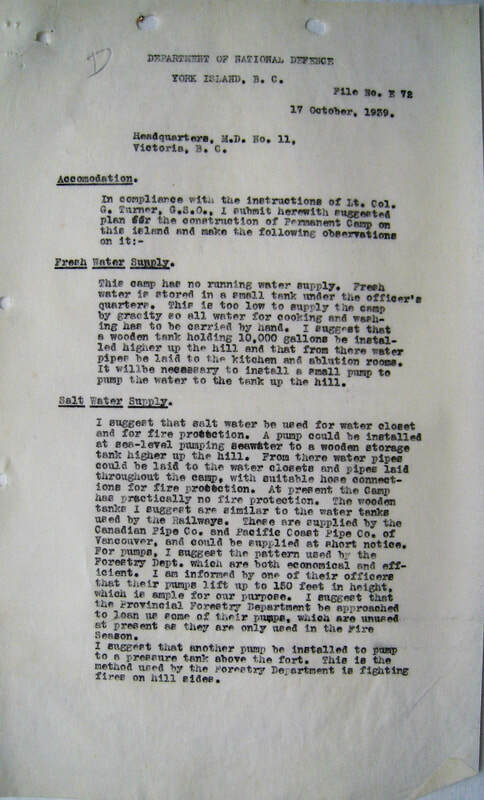 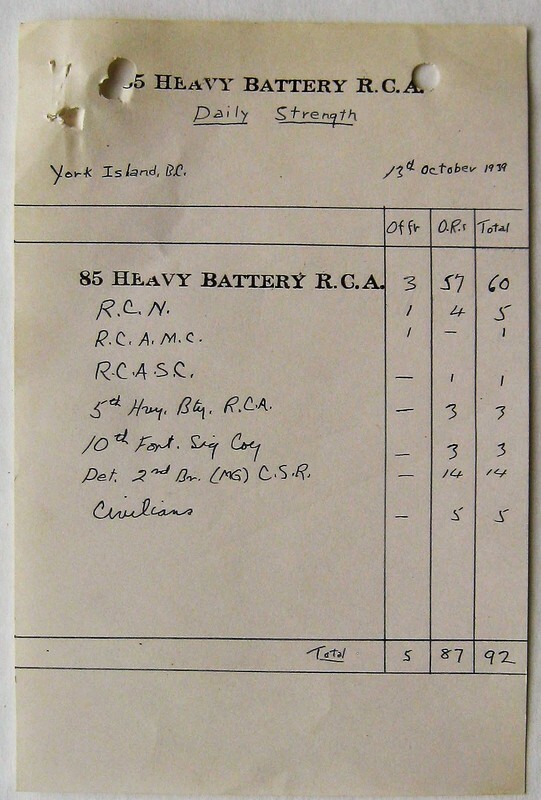 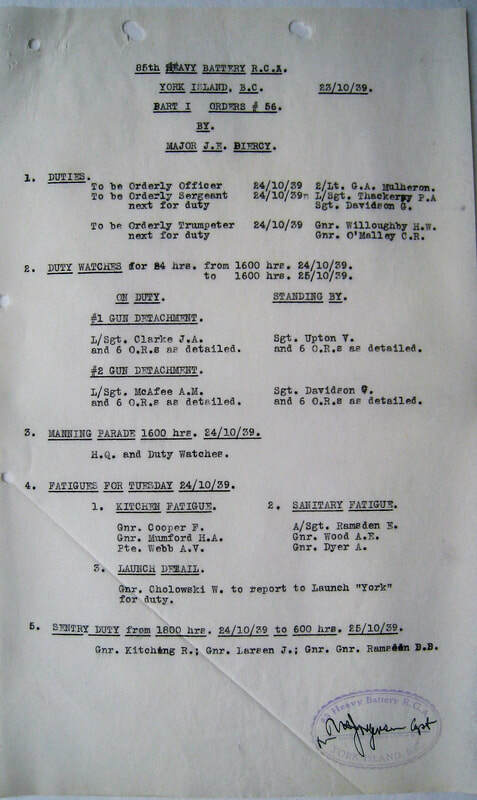 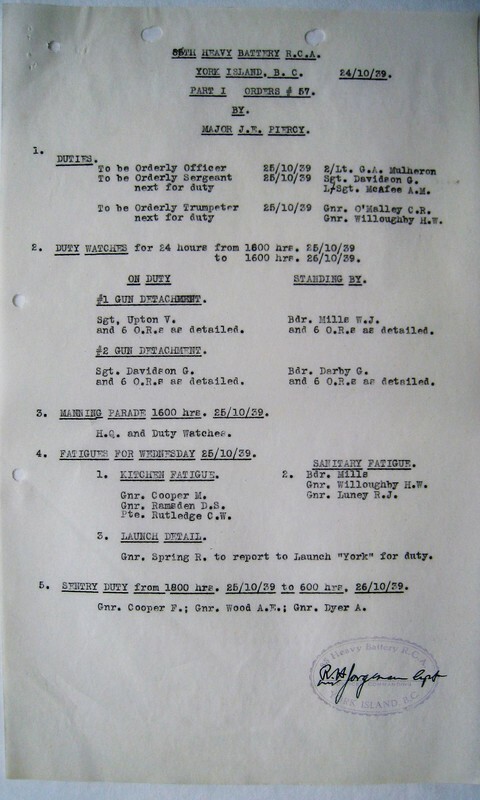 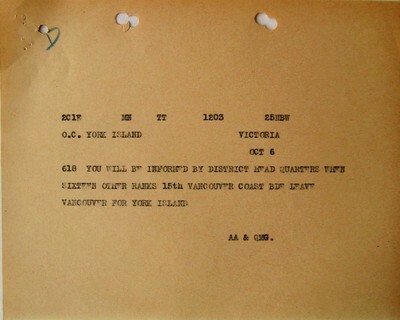 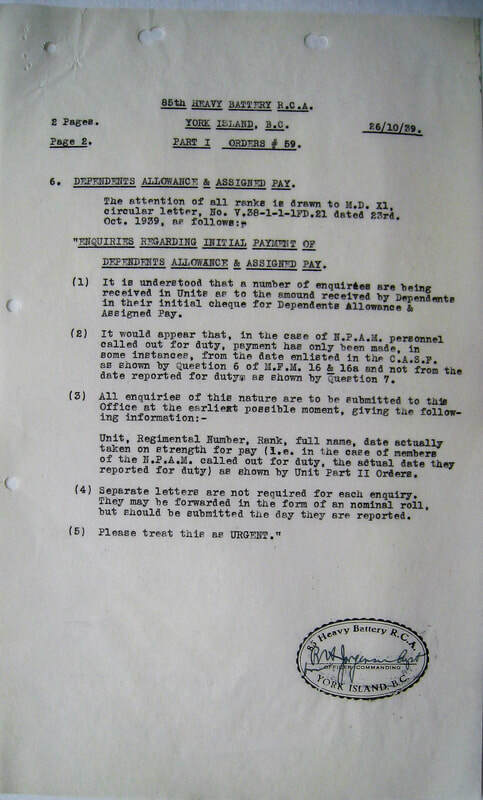 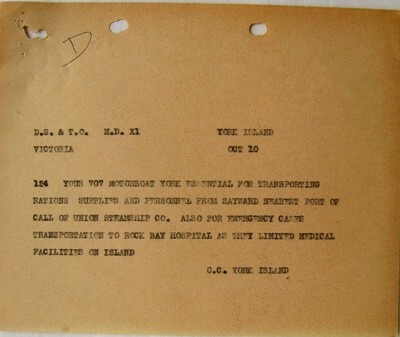 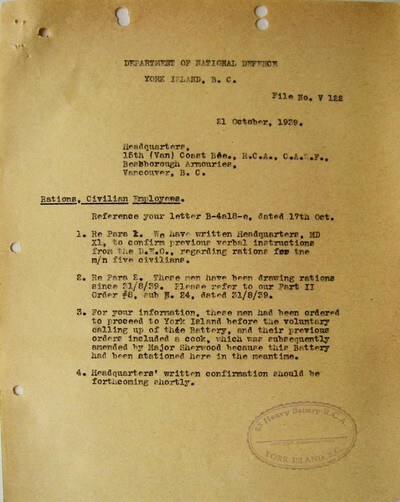 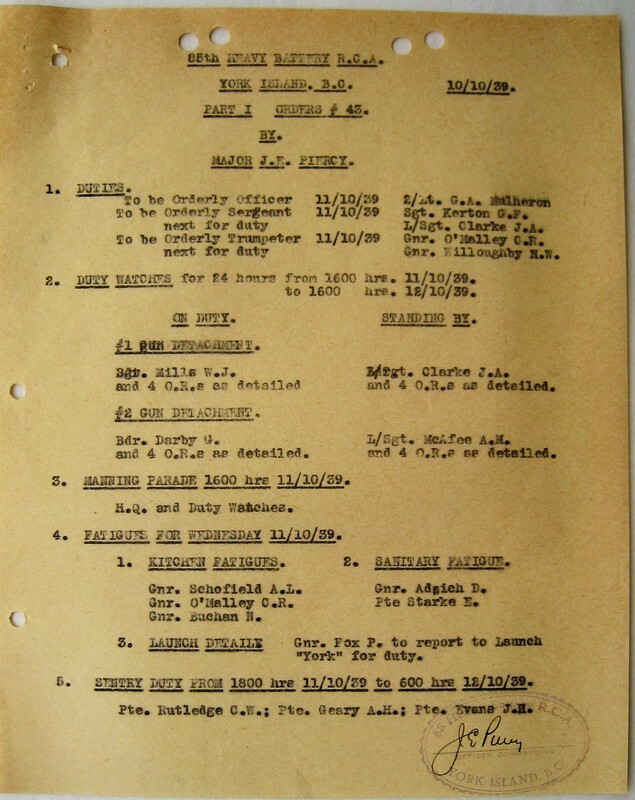 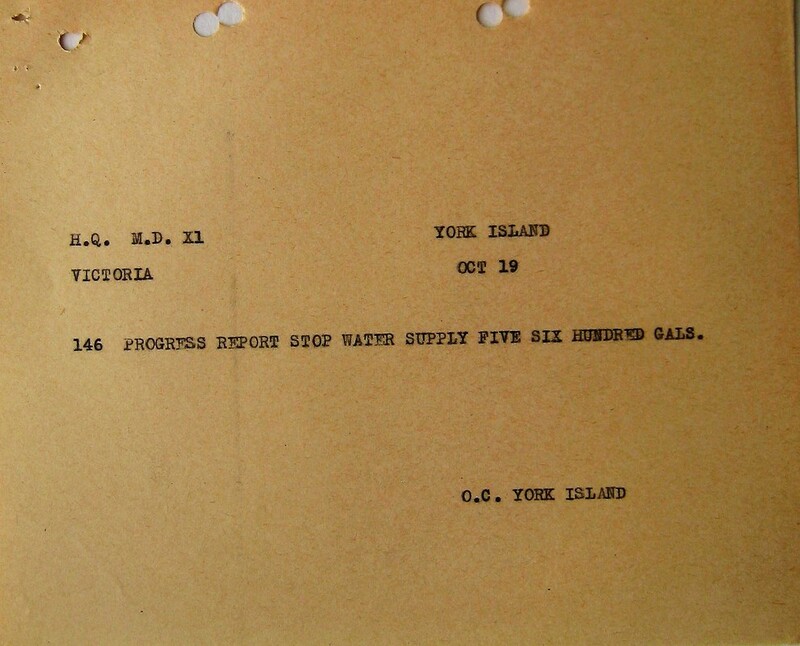 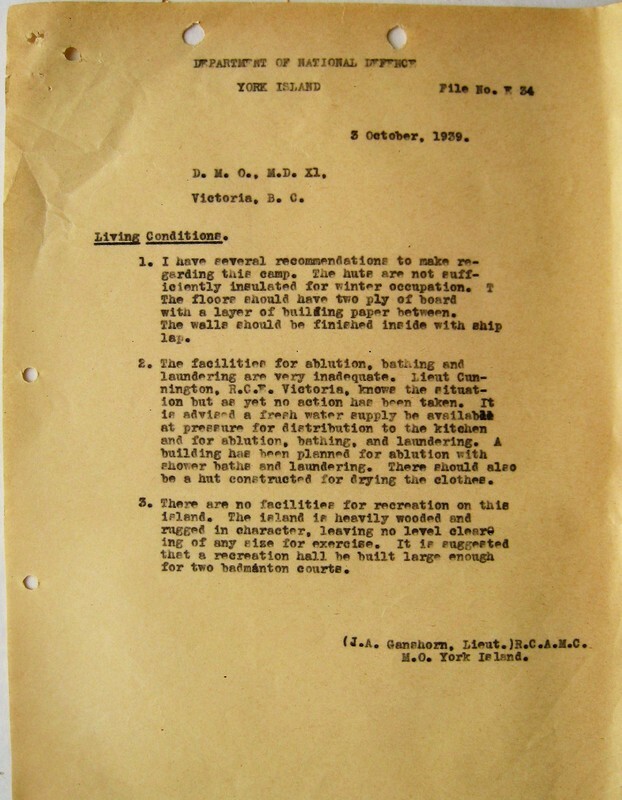 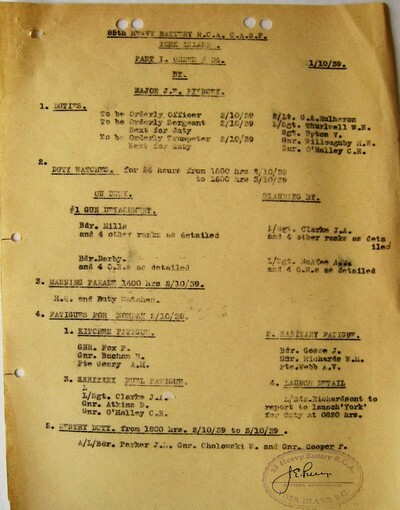 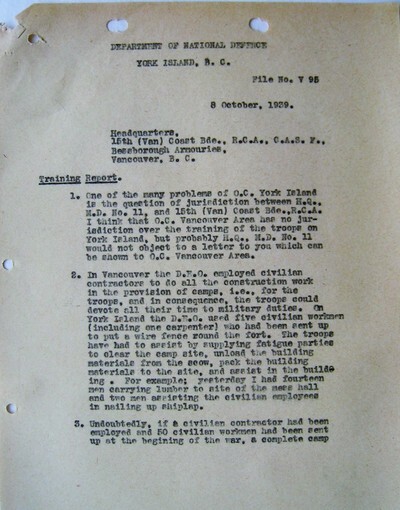 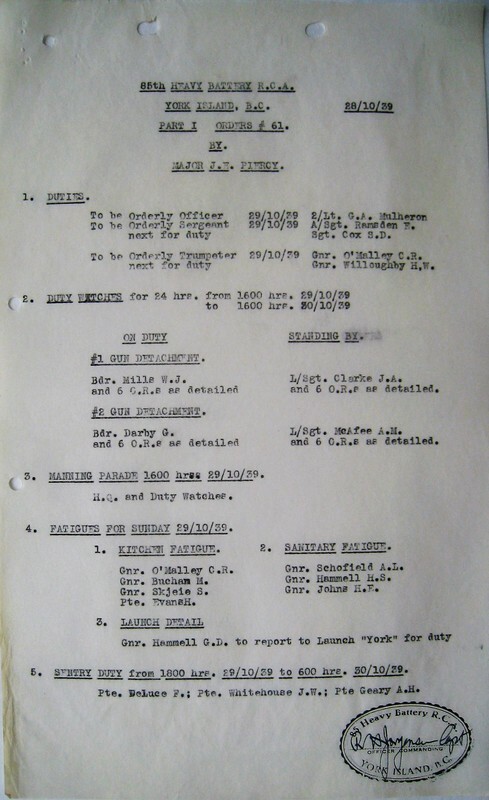 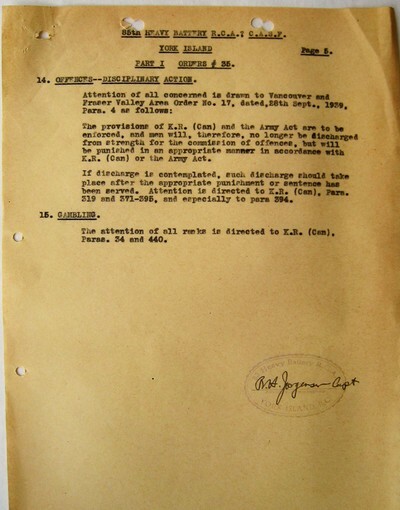 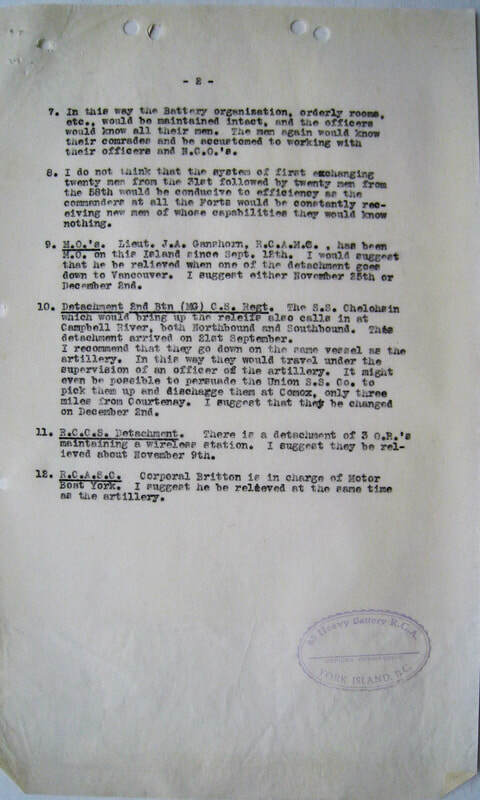 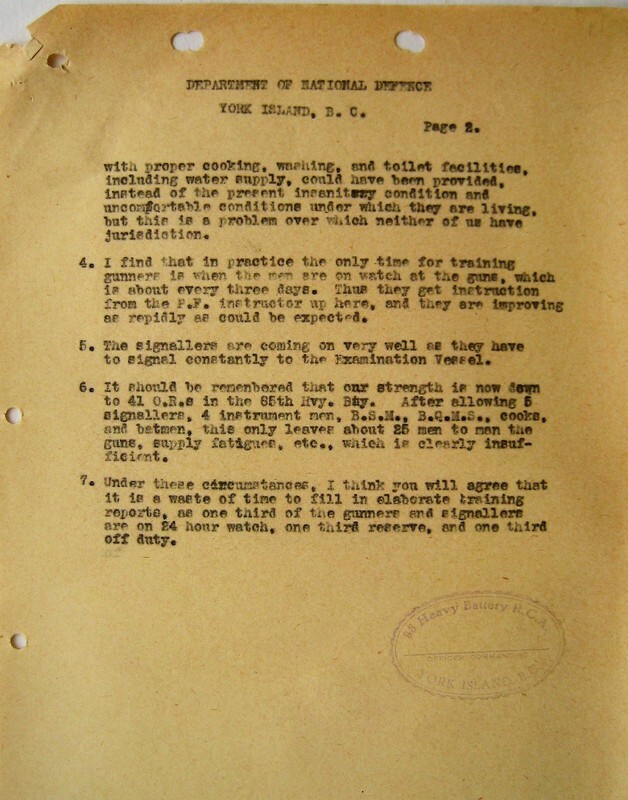 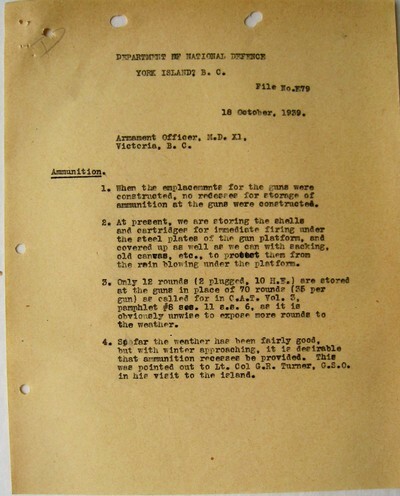 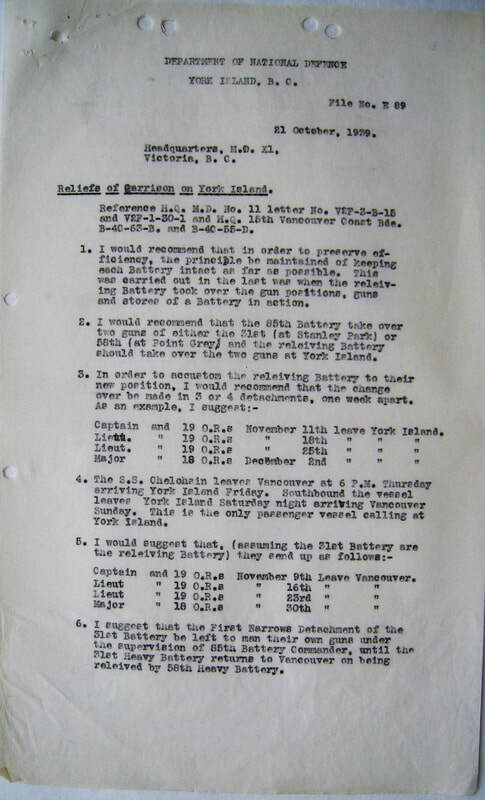 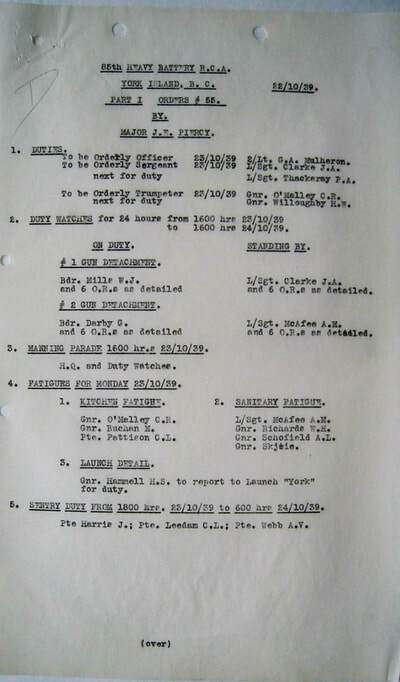 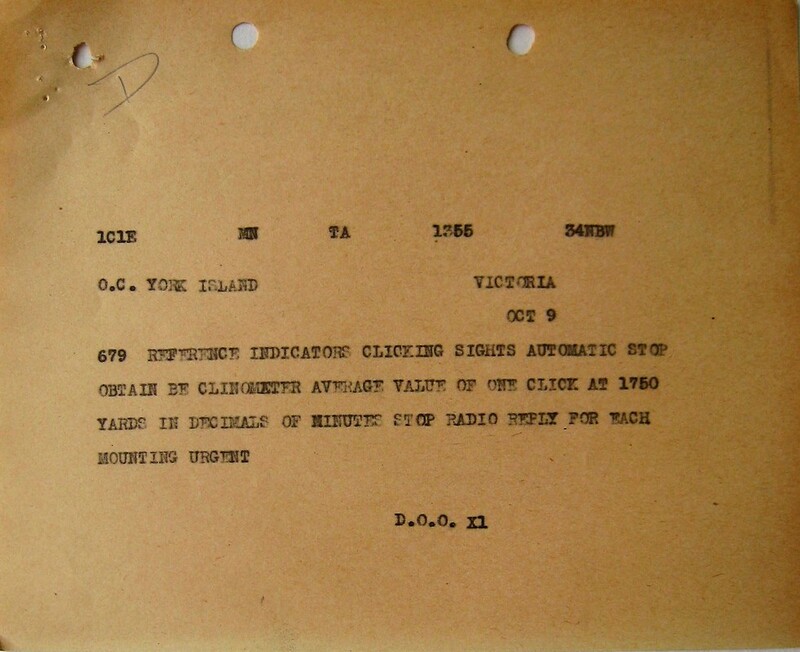 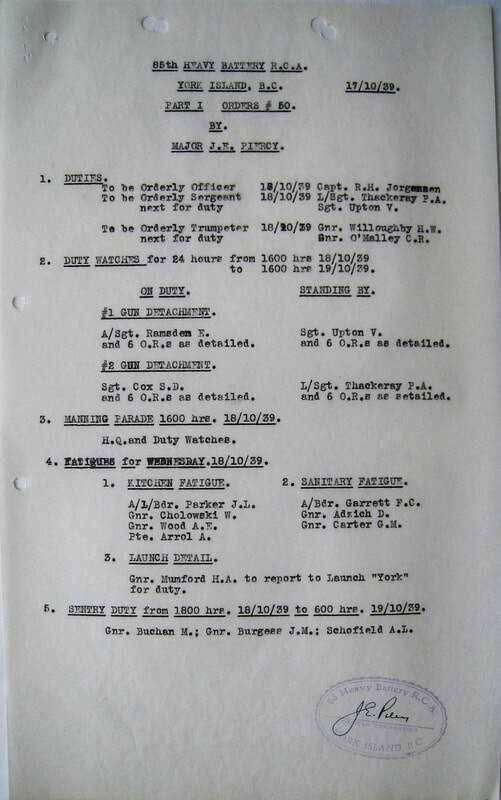 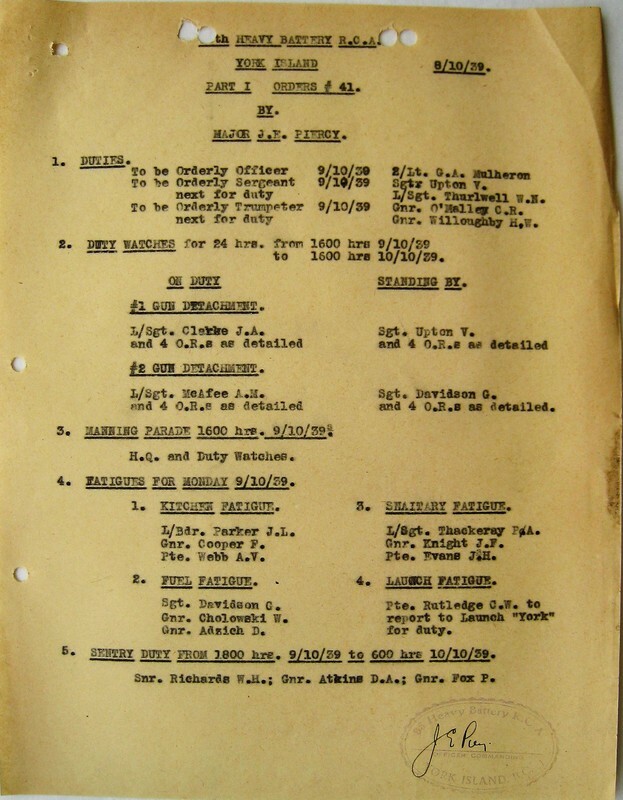 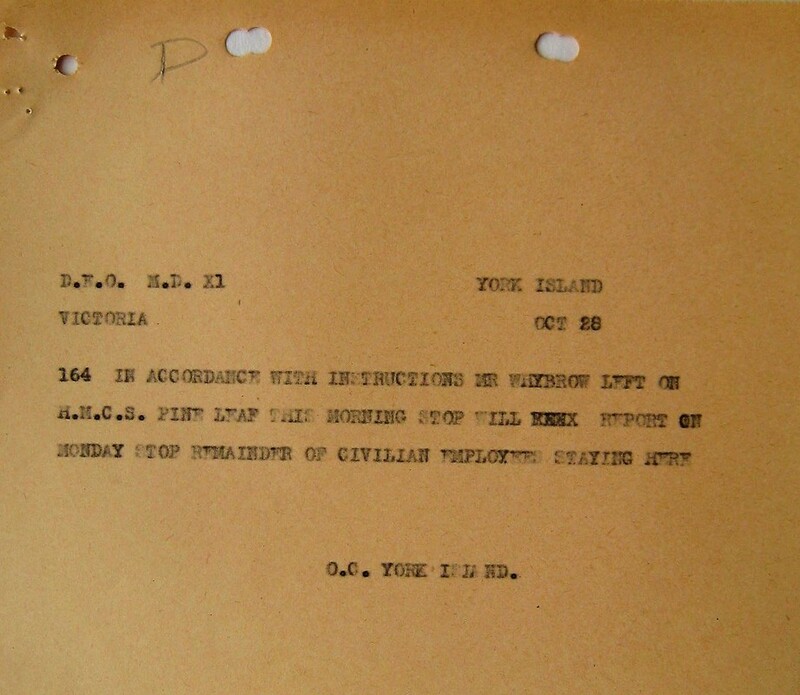 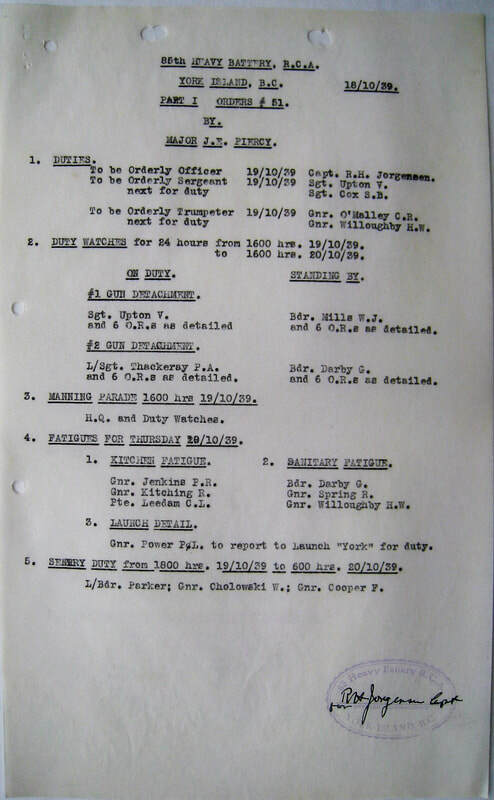 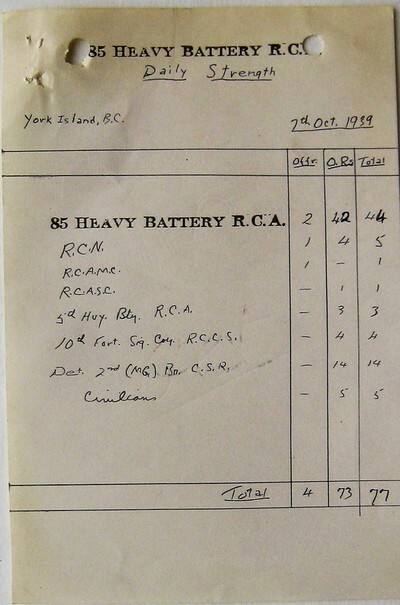 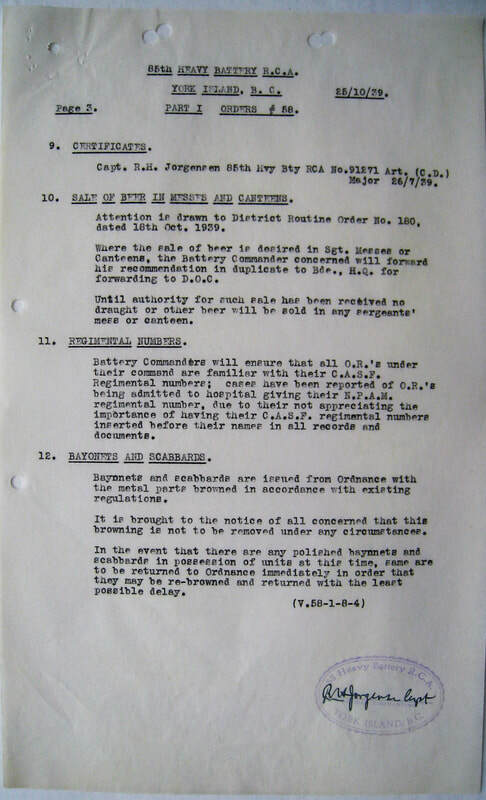 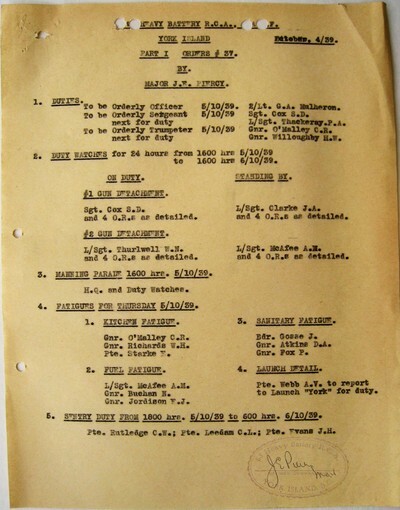 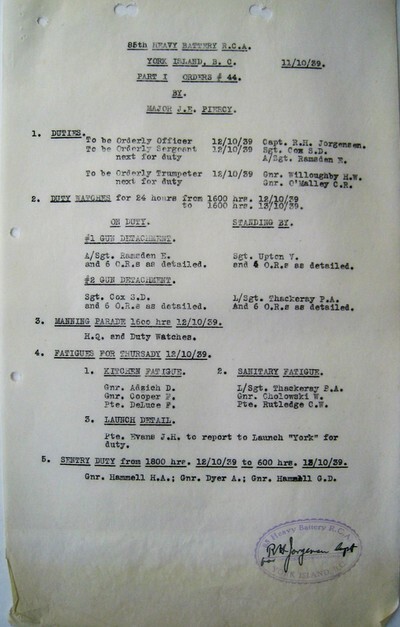 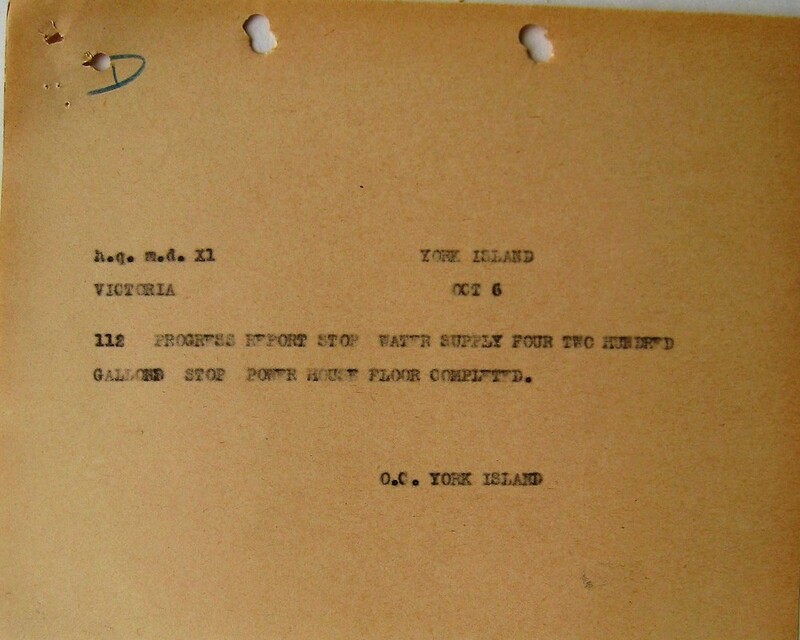 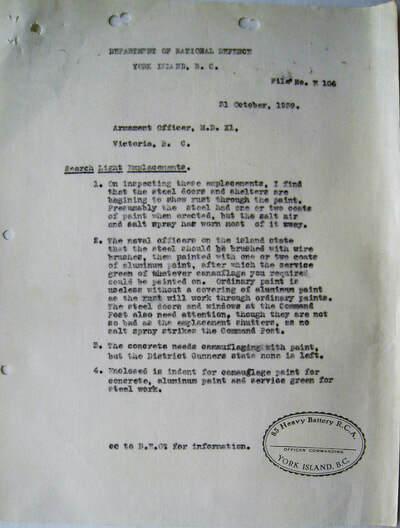 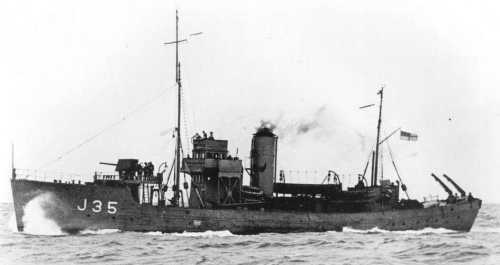 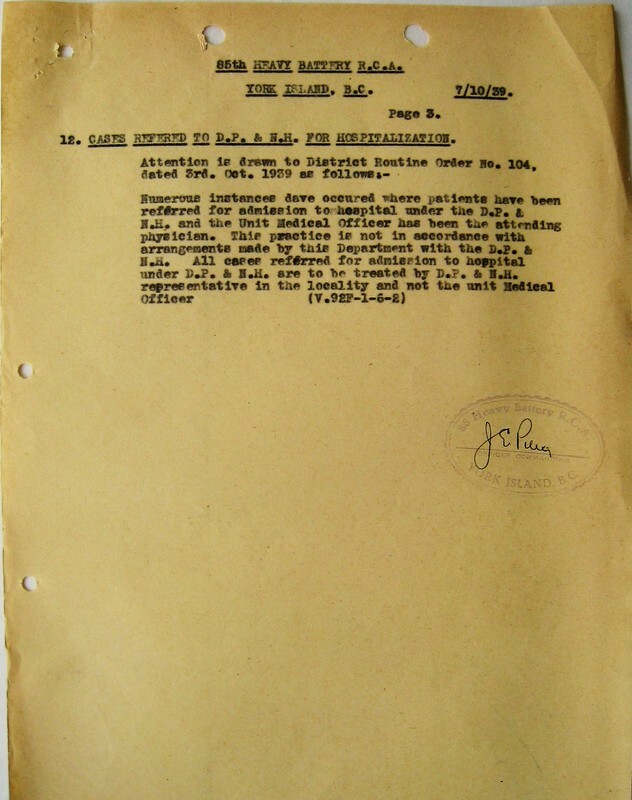 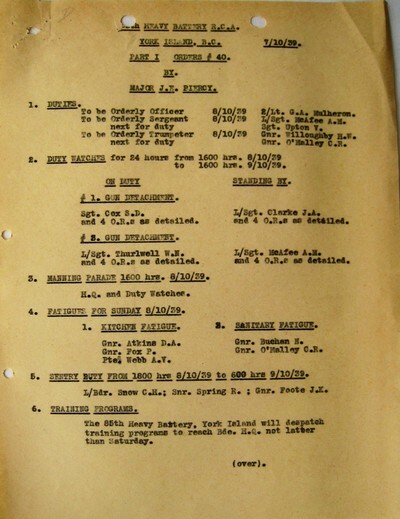 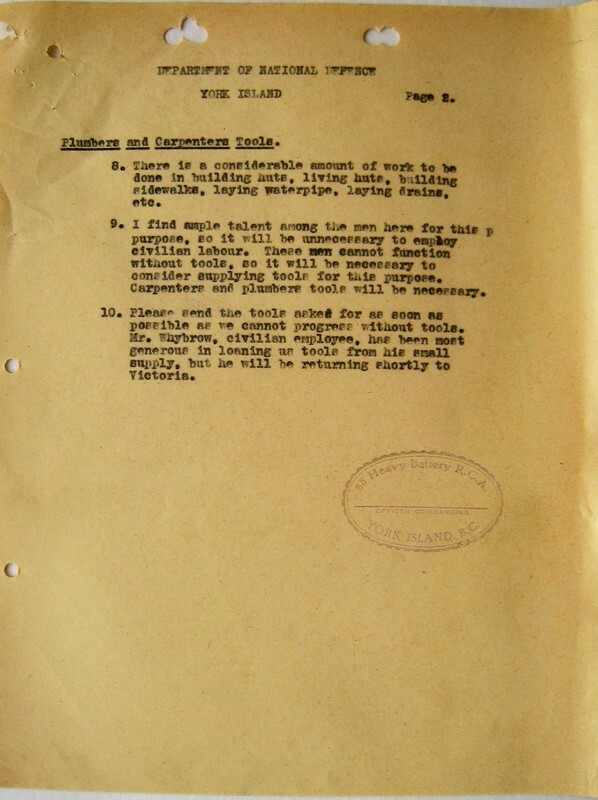 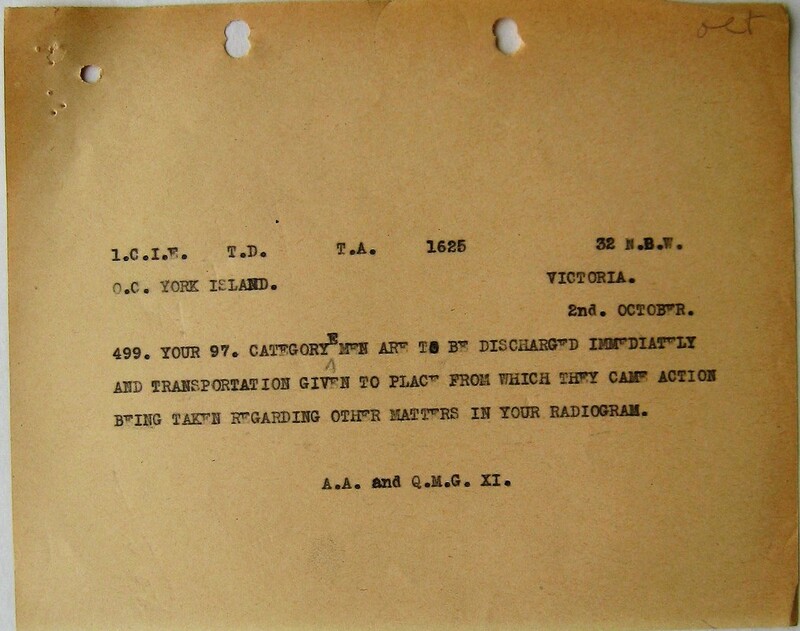 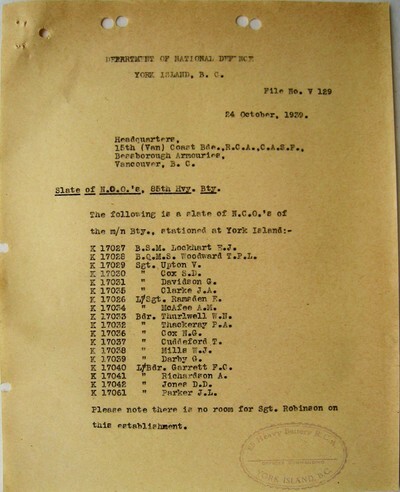 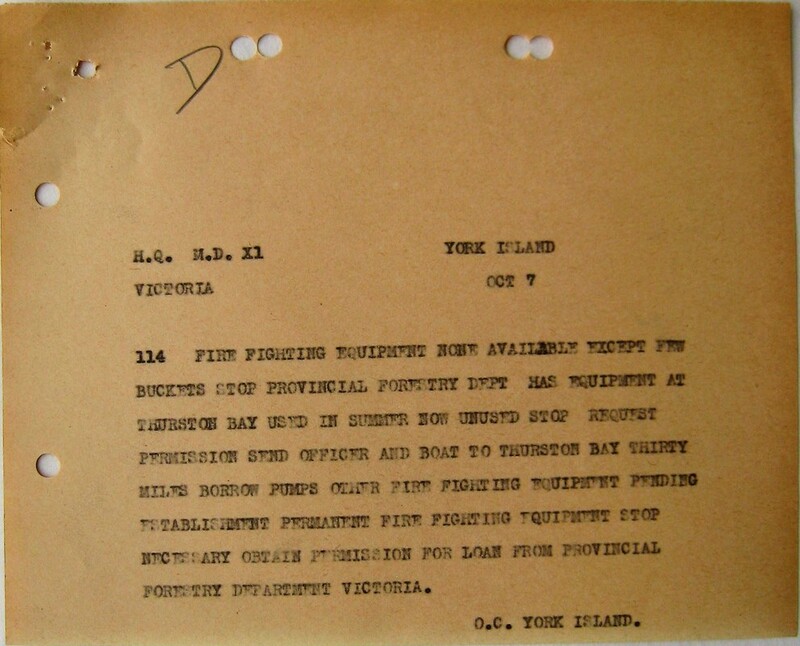 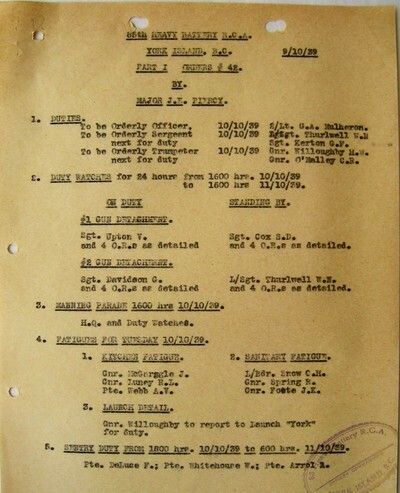 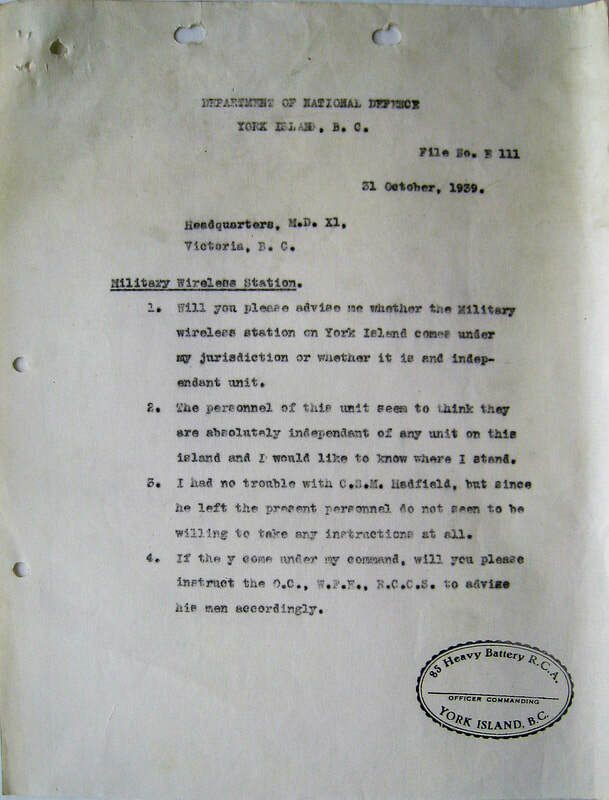 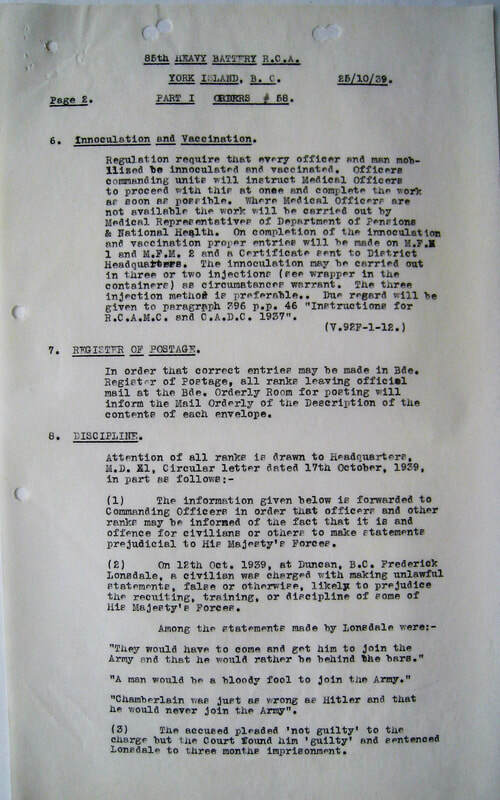 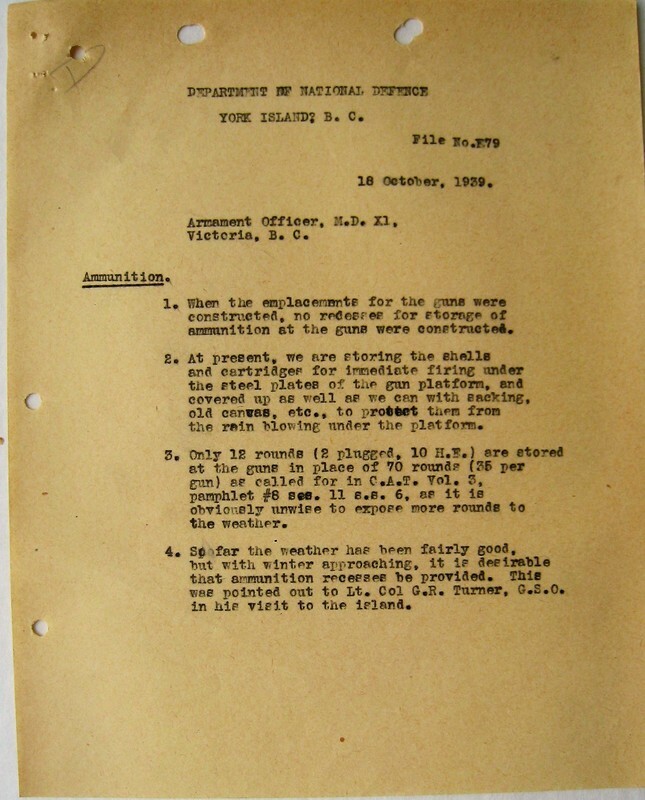 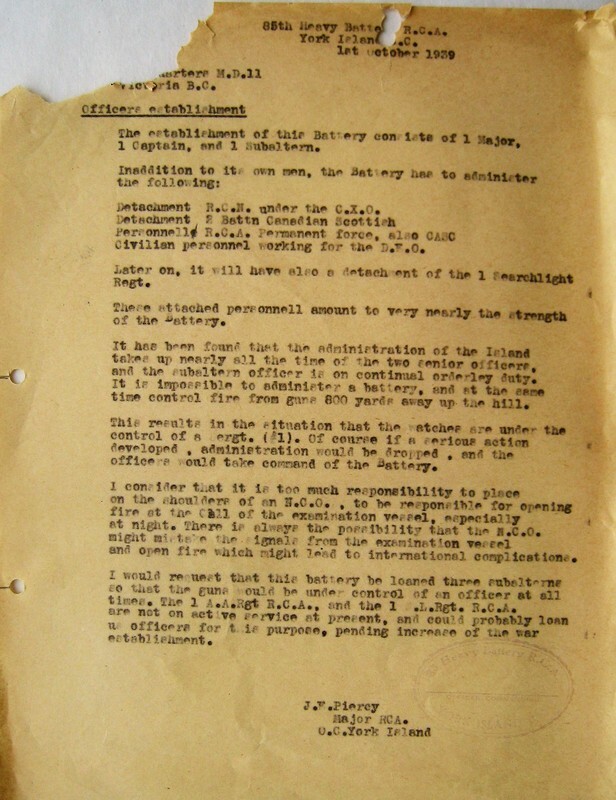 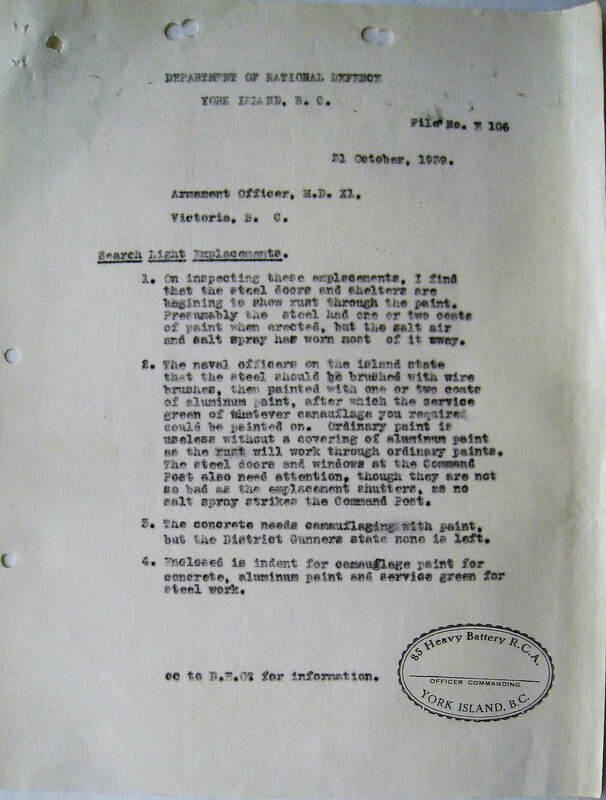 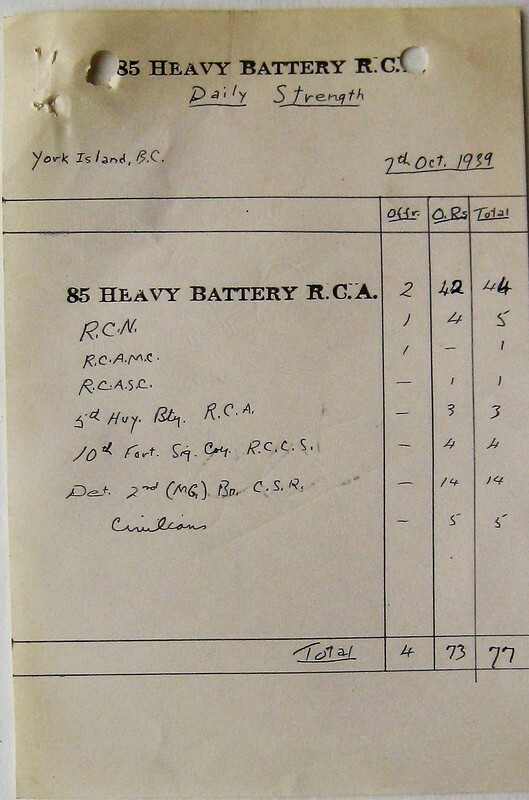 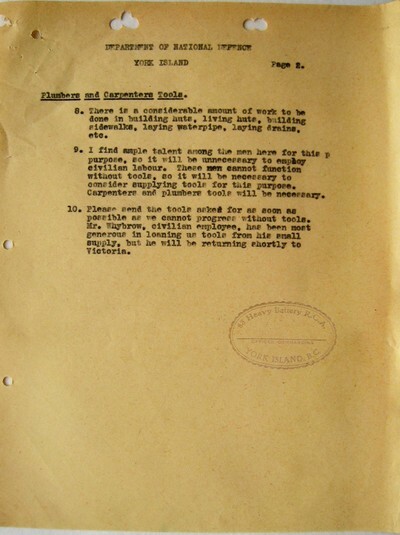 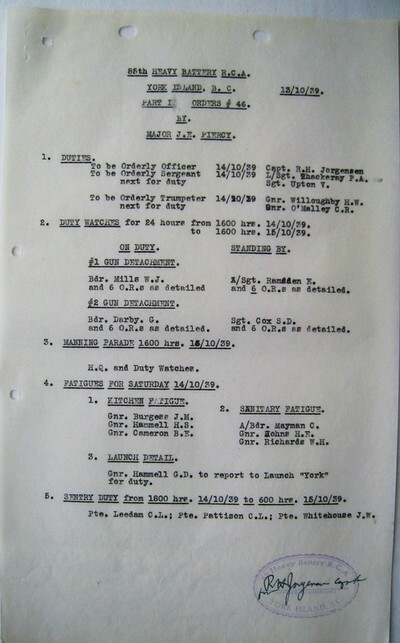 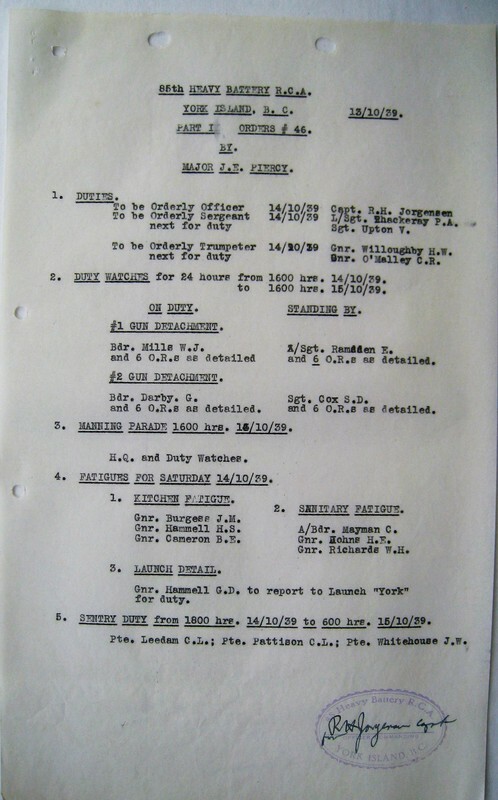 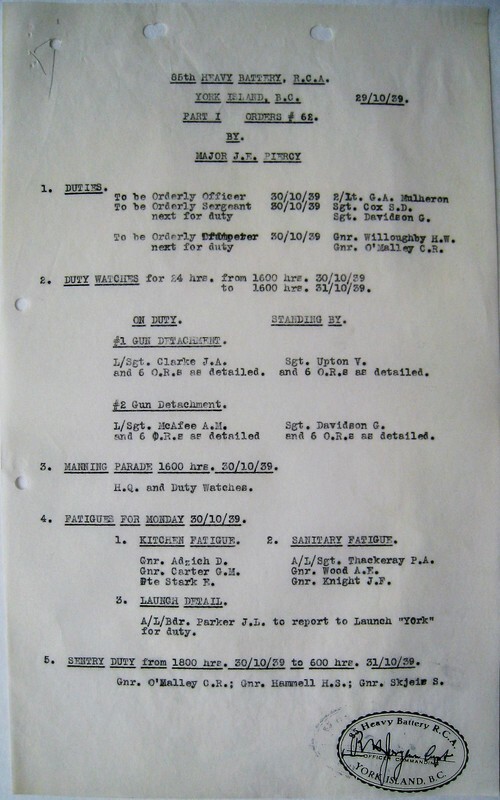 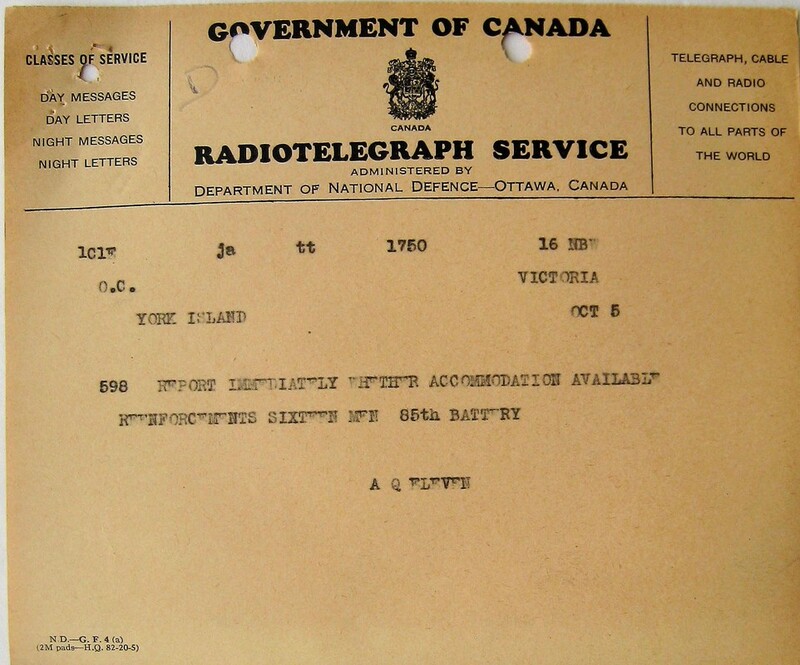 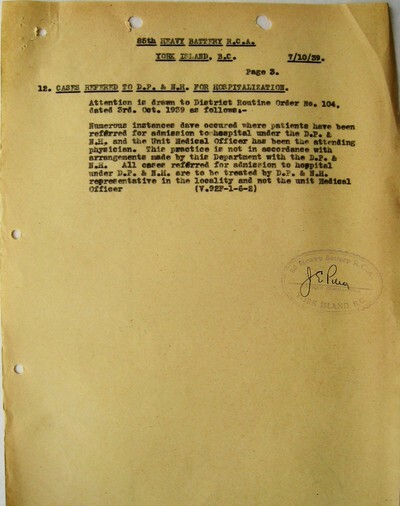 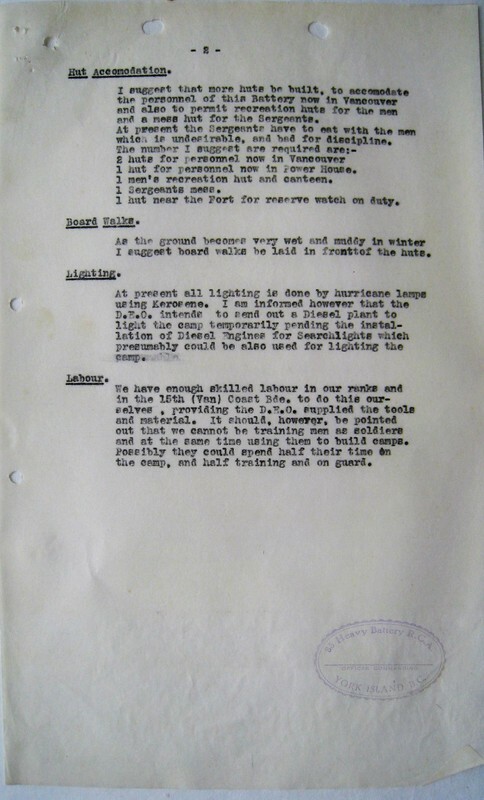 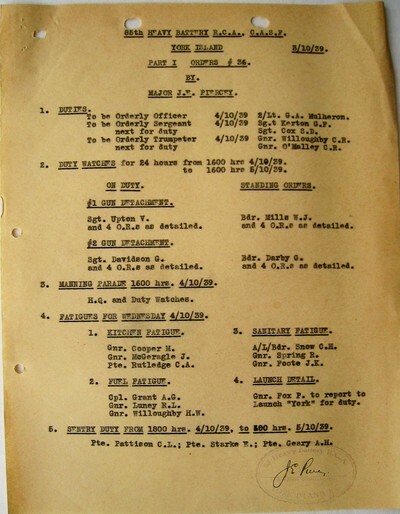 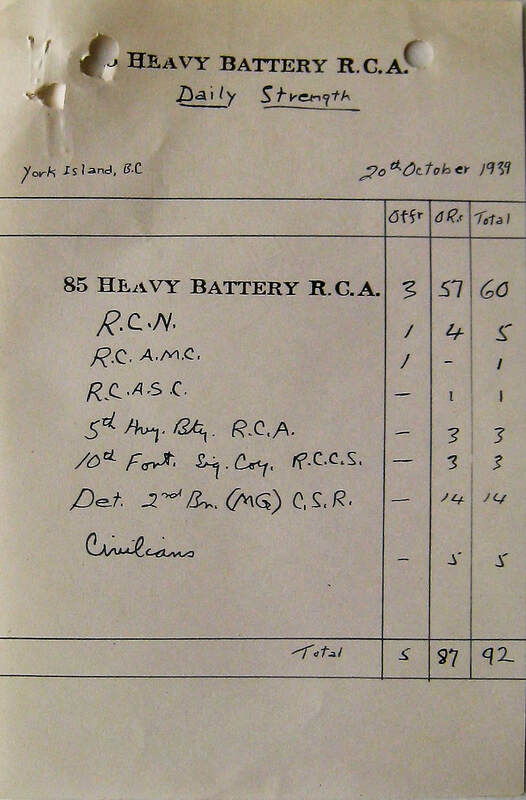 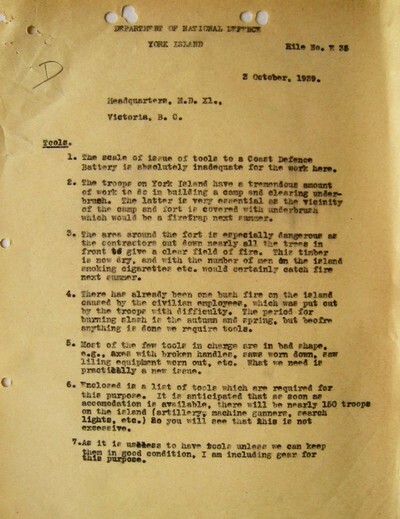 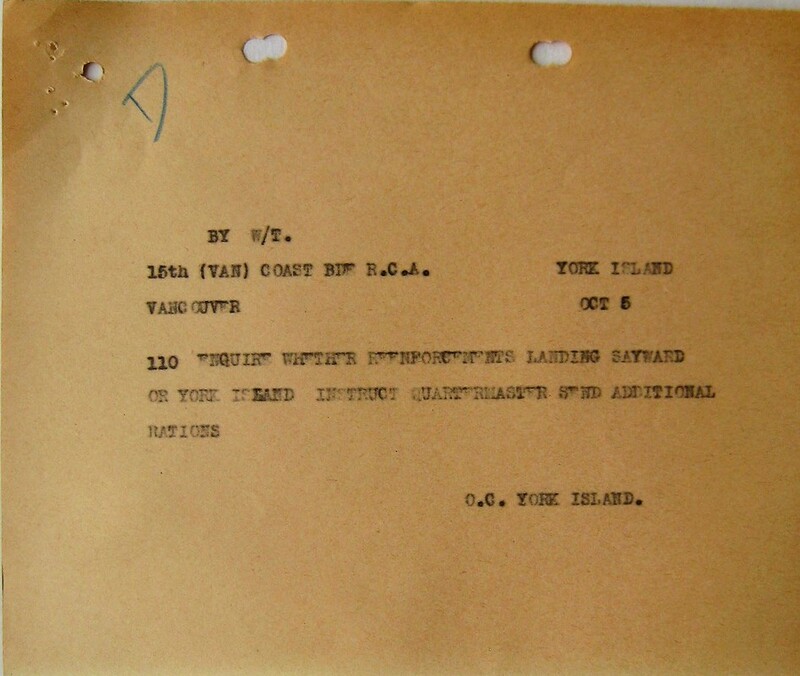 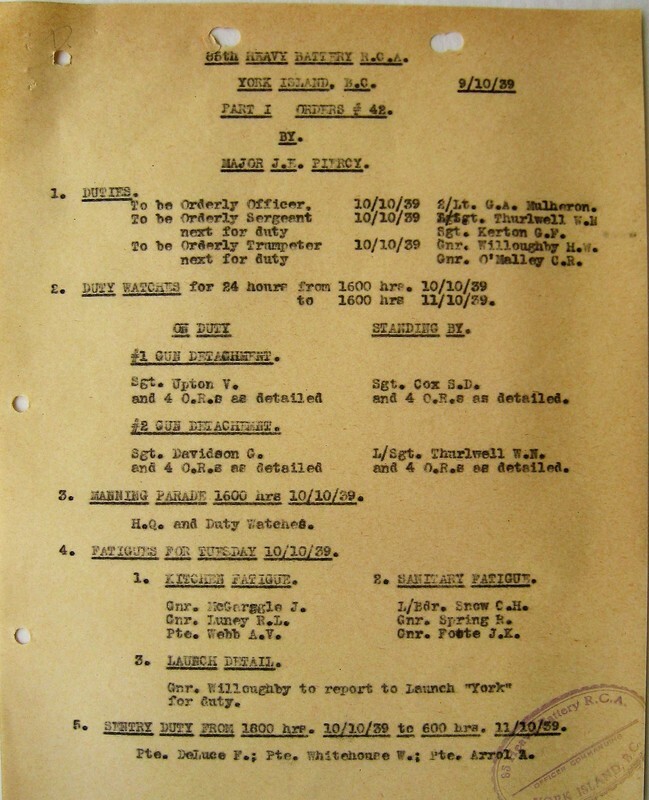 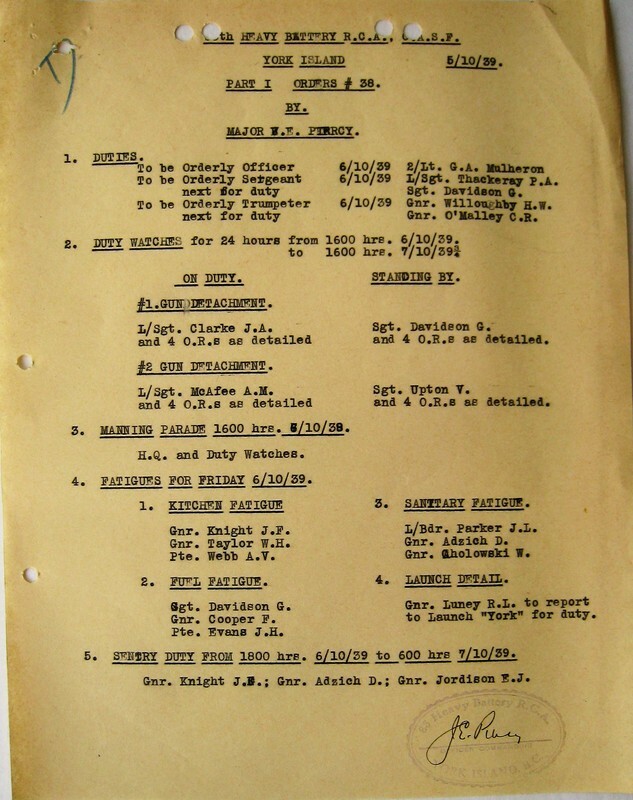 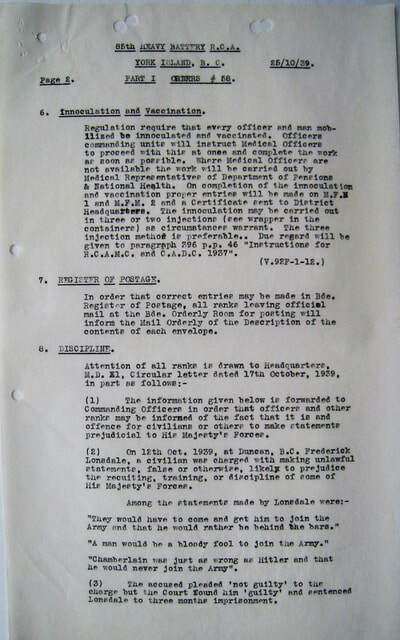 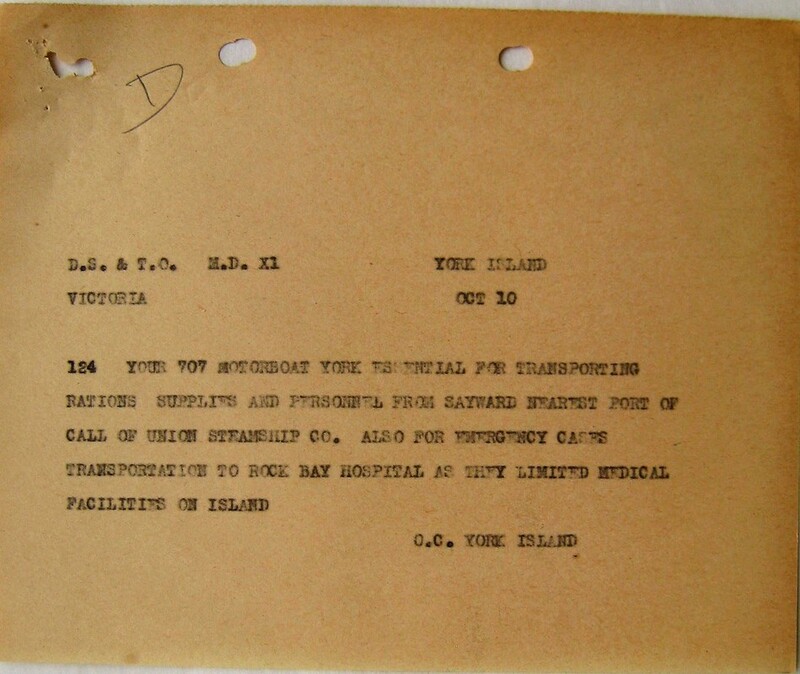 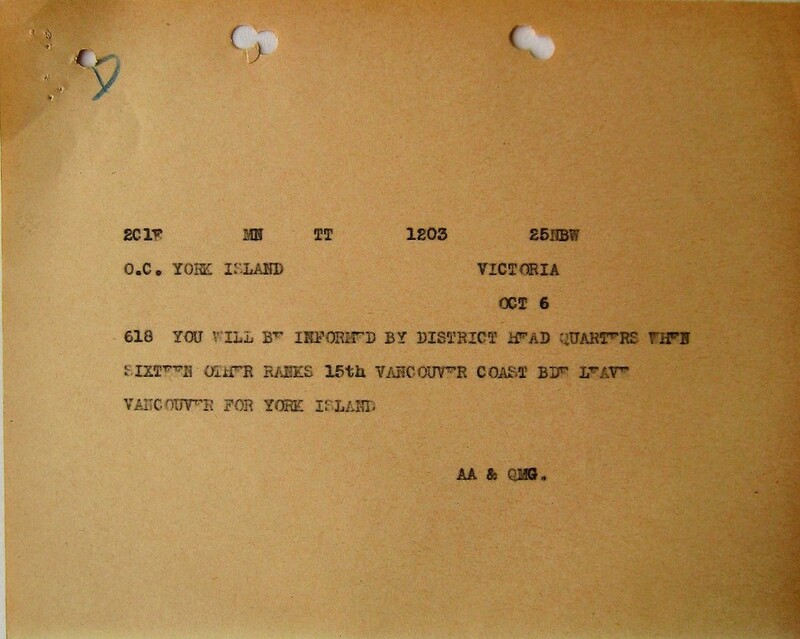 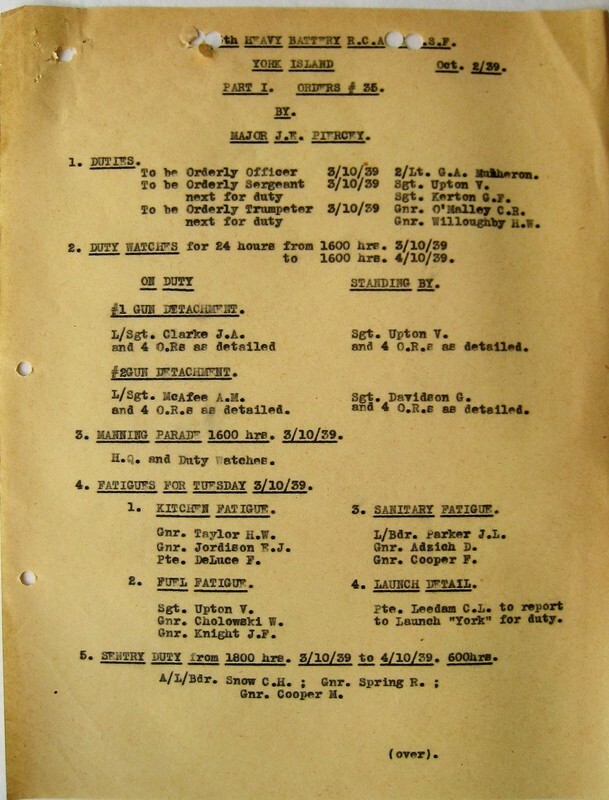 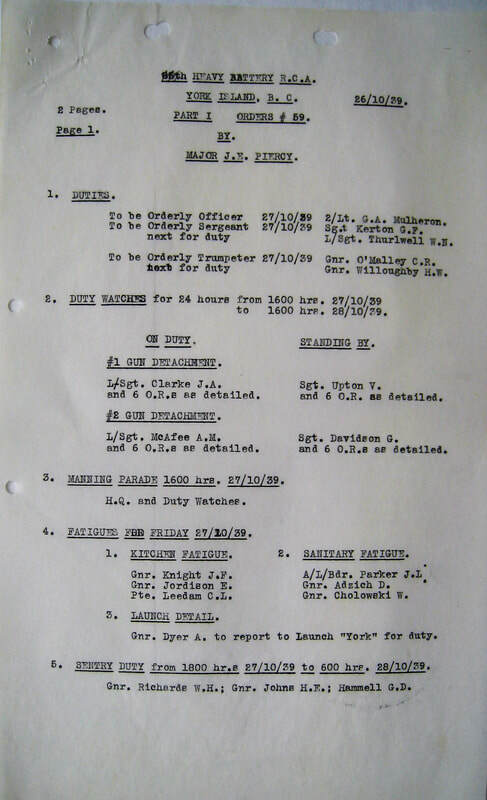 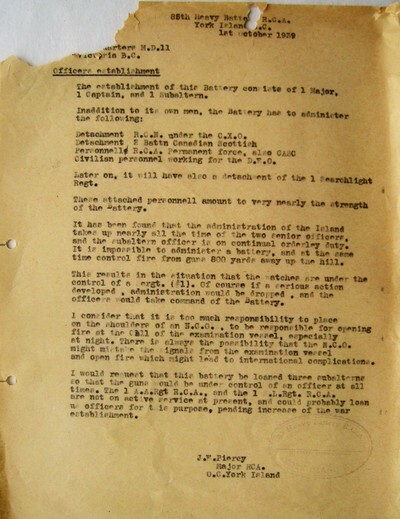 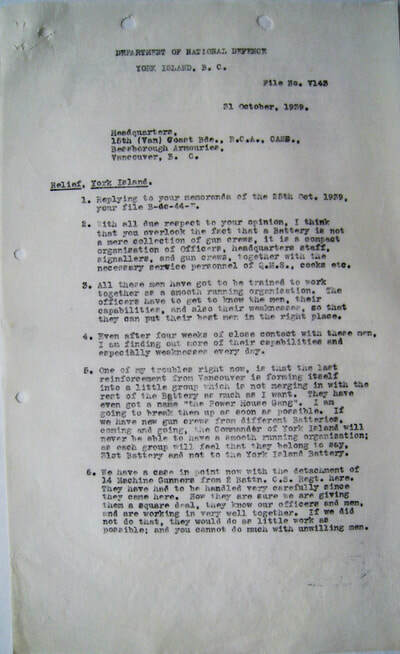 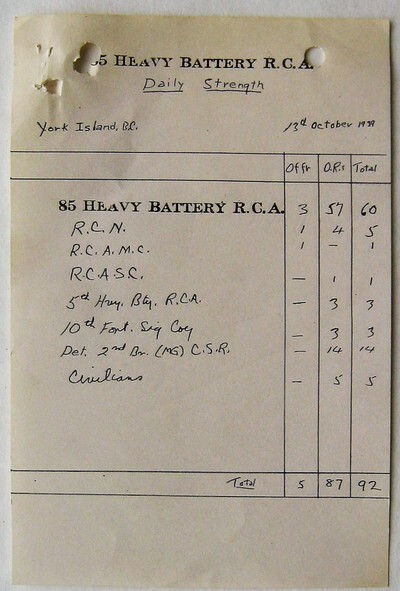 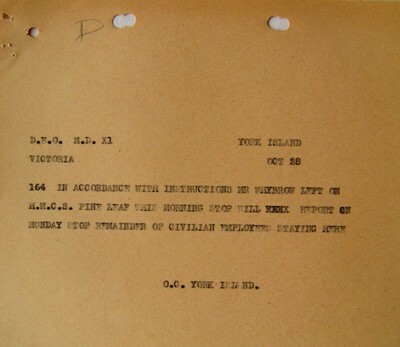 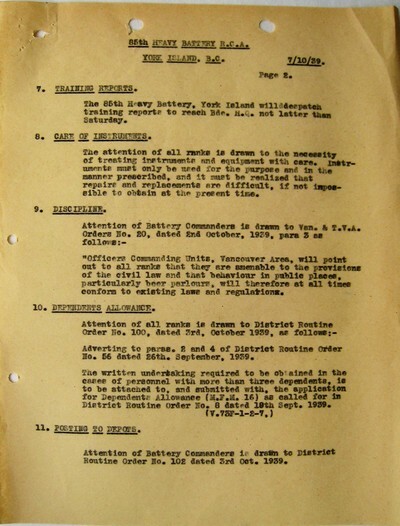 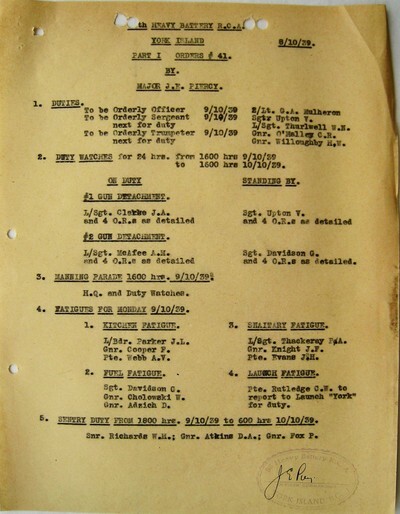 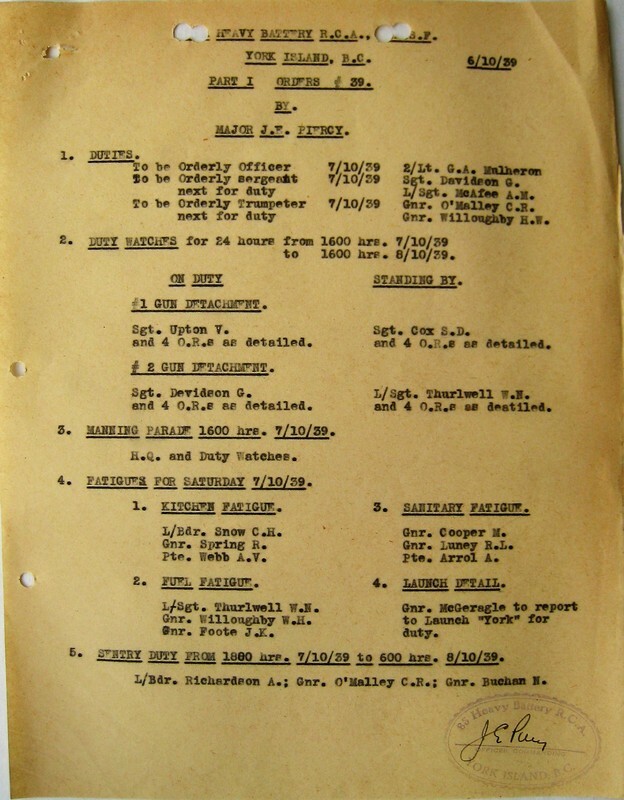 Letter re 3/L emplacements (see App. "E"). Letter re clothing (see App. 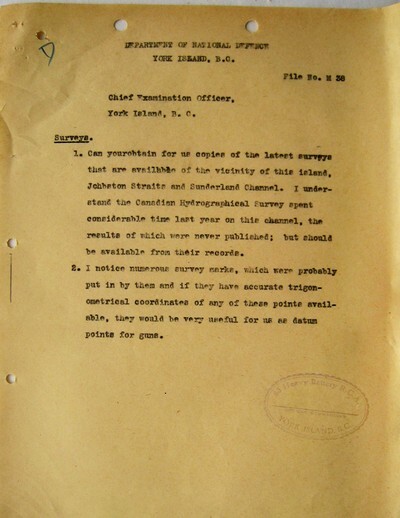 "E"). 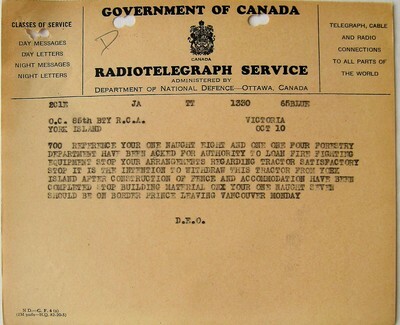 letter re Wireless Station (see App. 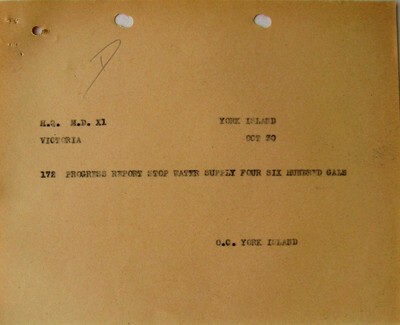 "E").